The school year concluded three weeks earlier, but the Screamin’ Eagles waited until after the National Championships to officially close the year at their annual Awards Banquet. Almost 200 team members, parents and coaches spent the entire evening dining, celebrating successes, remembering their speech experiences and presenting awards to the competitors, parents and assistant coaches. 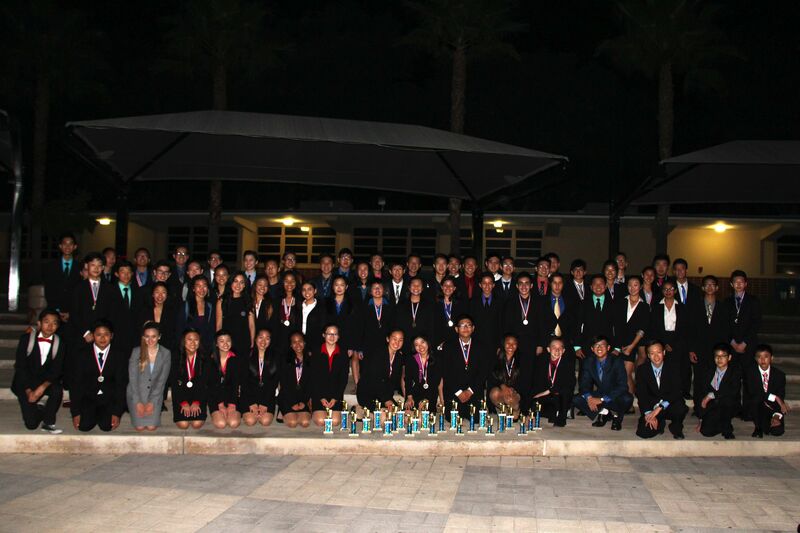 The 28 students attending the State Championships and 17 members of the Ft. Lauderdale Nationals Team were presented awards from the California High School Speech Association and the National Speech and Debate Association. Almost 50 team members were awarded the Varsity G letter for attending 11 tournaments throughout the year, qualifying for a varsity final round at some point in the 2017-2018 season and making the 2018 League Championship team. Each of the nearly 30 seniors in attendance were recognized by underclassmen and presented with a fun tongue-in-cheek representation of their individual speech careers. The highlight of the night was the nearly 45-minute year-in-review video compiled by sophomores Kett, Lin and Brendon. Students got to film little vignettes about their events to go along with the videos and photos taken throughout the year and see it all on the huge movie-sized screen in the gymnasium of the San Gabriel Christian Church. Key awards were presented to students who were voted and/or nominated by their teammates or coaches. The team members voted freshman Eric as Rookie of the Year and senior Leon Tran as the Most Outstanding Speaker. The coaches voted seniors Jannelle Dang and Kaylin Tran winners of the David Nguyen Psycho Work Award; named after one of the historically hardest working Screamin’ Eagles who graduated in 2000. Freshman Bianca was the recipient of emotional Rode Panginda Memorial Award in remembrance of a team member who tragically lost her life in an accident at a family gathering 11 years ago. Over 40 students were nominated by their peers for the Top Eagle Award for the spirit of the team. Senior Richelle Chow was chosen from that group of nominees to receive the award. Senior Captains Richelle Chow, Angelina Liang and Josh Raymundo presented the Assistant Coaches and Officers of the Screamin’ Eagles’ Parent Booster Organization with gifts and tokens of their appreciation. After all the awards were given out, the team members took one last opportunity to take pictures in their respective events, with the graduating seniors and their coaches and parents. After a long and successful season, the banquet was an elegant and wonderful way to close the book on the 2017-18 speech and debate year. “If you miss the exit on the interstate, you’ll be stuck in the Everglades.” Wow. How does anyone digest that? 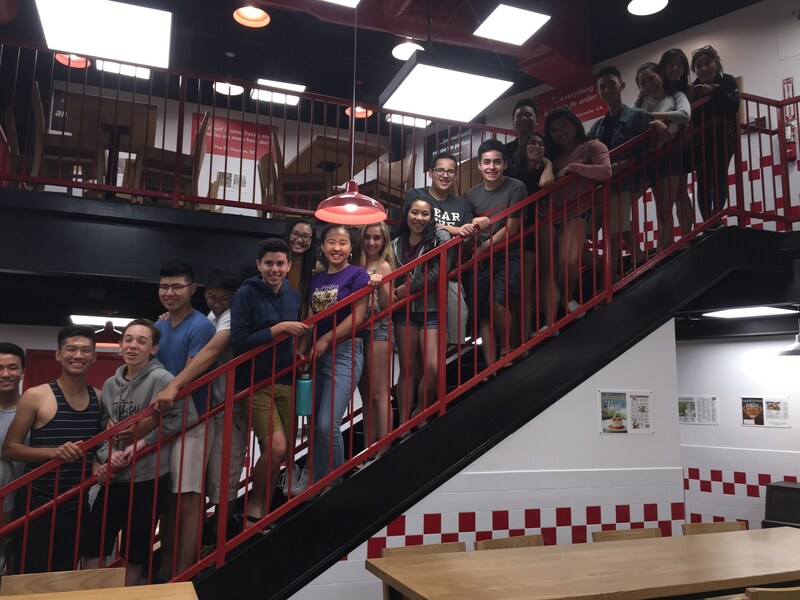 This year’s Screamin’ Eagles’ National Qualifiers had to travel to six different locations throughout the Greater Ft. Lauderdale area for the week and avoid getting lost in the alligator infested Everglades in order to compete at the 2018 National Speech and Debate Association’s National Championships. Much like Southern California schools, the competition venues lacked interior hallways to connect the buildings. Thus, the daily Florida downpours created challenges to students running between classrooms in suits, dresses, and high heels. It was helpful, yet a bad omen, that each judge and competitor was given a complementary umbrella at registration. After several days of playing large-scale musical chairs with our six venues and three vans, the team had only four of their 15 entries advance to the Octofinals (the top 60 of the almost 250 entries from around the country who qualified for the tournament). The Screamin’ Eagles haven’t seen results this dismal in over a decade. “Wichita in 2007 was pretty bad. This seems right up, or down, there with that one,” said a team official. Over the past 20 years, the team breaks, on average, well over 50% of its entries to at least the top 60. Just like Kansas a decade ago, the team placed an Extemper in the Quarterfinals and had a Semi-Finalist in U.S. Extemp. 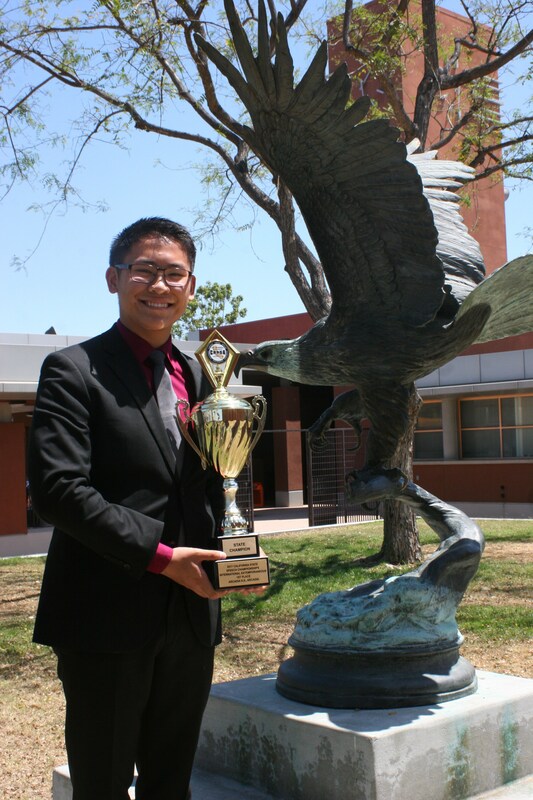 Leon Tran, the 2018 California State Champion, joined the ranks of so many Extemp Semi-Finalists and Finalists of the past but came up just short of becoming the program’s fourth Extemp Finalist in the past eight years. 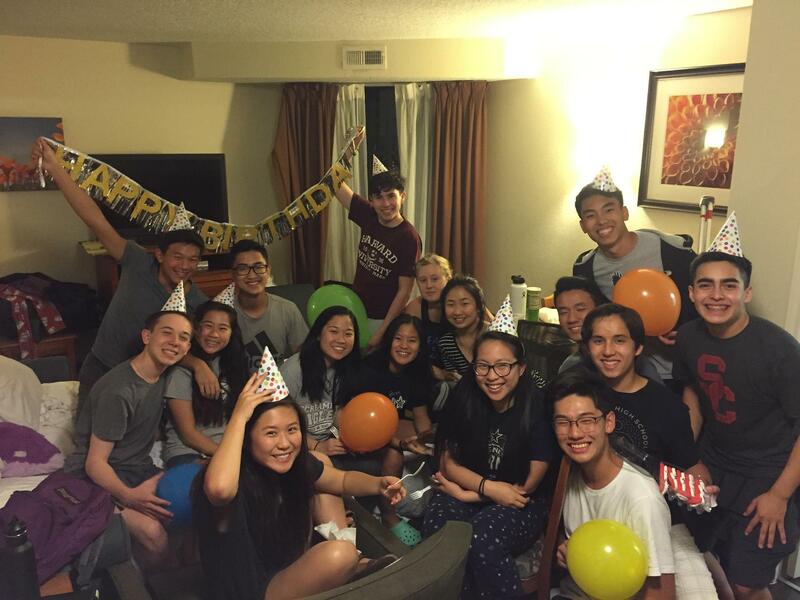 It was, however the 12th year in a row, Gabrielino Speech and Debate has had someone in the National Semi-Finals. 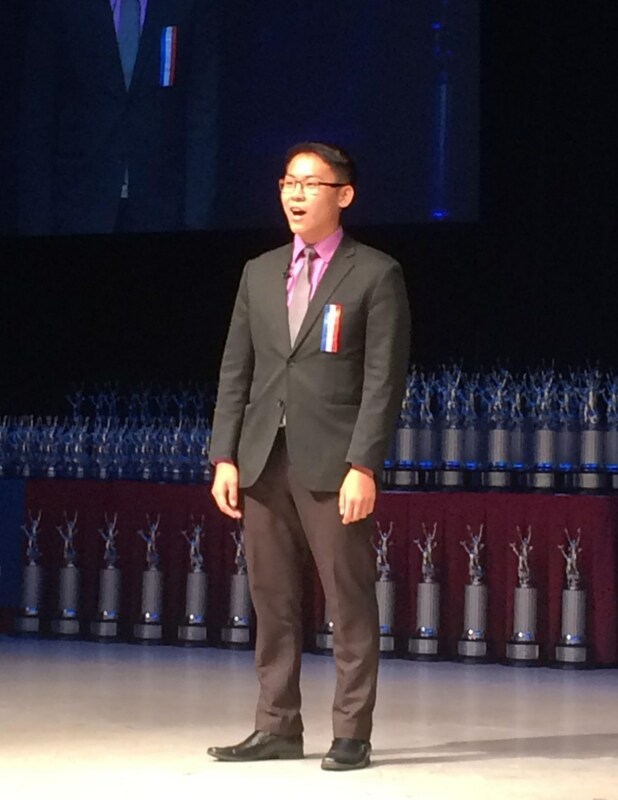 Leon was GHS’ 38th National Semi-Finalist. Most teams in America are ecstatic to even qualify for the National Championships (the largest academic competition in the world) but for the Screamin’ Eagles, their expectations are to remain with the elite programs in the country. 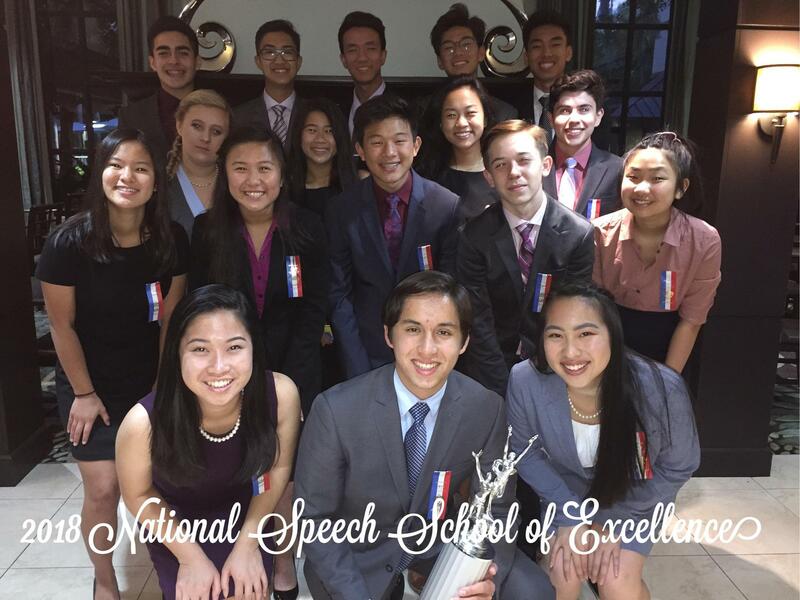 Gabrielino did manage to be named one of the 20 National Speech Programs of Excellence for the 11th year in a row. “That is always the test of our program,” according to one of the coaches. “We barely made it, but a win is a win. And again, this year, we proved that Gabrielino is one of the very best programs in all of America. To do this and be at this level for over a decade, in spite of all the things that consistently hit us and hinder our program, in spite of the challenges we face and obstacles we overcome, is a testament to all the people who are a part of this team: the students, coaching staff and parents”. 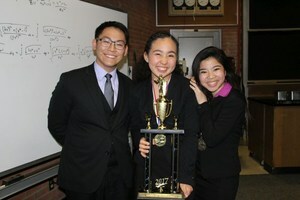 And again this year, they were the top team from the Southern California Debate League. One of the students pointed to gecko on the sidewalk outside of the team’s hotel and said, “look it’s a baby alligator.” That was kind of an indicator of how little the Screamin’ Eagles knew about Southern Florida. After 10 days, the team was happy to have avoided the Everglades and as they boarded the plane to come home said, “see you later alligator…after while crocodile” and returned to California just in time for many of the National Qualifiers to celebrate their arrival in the real sunshine state. State Champion. Once you get that title, you would think you should stop. What a great way to end a career. Obviously, there is a legacy to being the team’s first State Champion in an event. Nope. That’s not the Screamin’ Eagle Way. It is not about trophies. It is not about championships. The awards and accolades will fade, but the passion to constantly improve stays with team members long after they leave Gabrielino. This philosophy embodies senior Leon Tran. 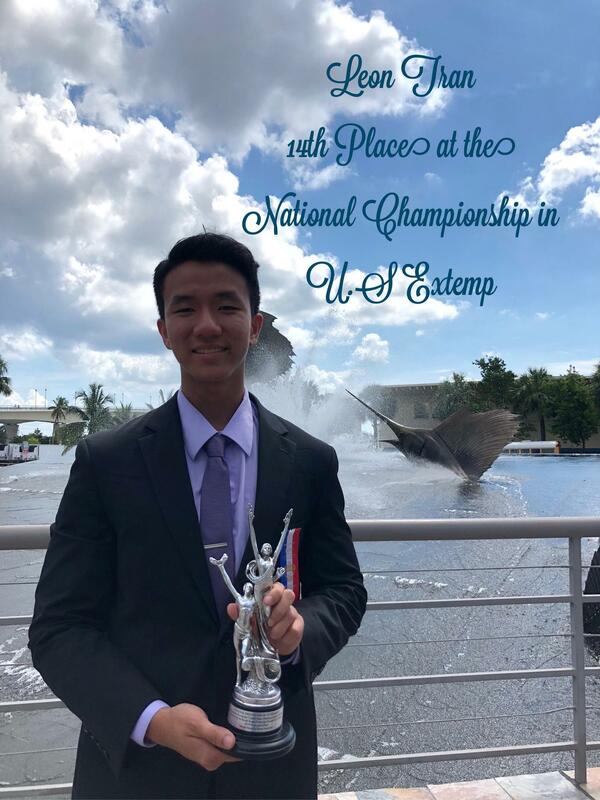 Less than two months removed from being crowned State Champion in U.S. Extemp for California, the recent and Stanford bound graduate traveled with his team to hot and humid Ft. Lauderdale, Florida for the 2018 National Speech and Debate Association’s National Championships. All 500 or so students in both U.S. and International Extemp drew their speaking topics and spent 30 minutes of preparation in the gym at Cypress Bay High School. Close to their speaking time, students had to trek across campus and through the parking lot to the middle school next door to perform their speeches for the judges. After racking up impressive scores in the first six rounds of competition over a day and half, Leon saw his speaker number listed among the top 60 competitors on a large poster indicating he would advance to the Octofinal round 7 and 8. Leon endured the brutal Florida afternoon heat and gave two more remarkable speeches. Upon the conclusion of round eight, the team headed back to the hotel to change before going out for a rare team dinner. Leon learned from one of his teammates that he was one of the 30 qualifiers for the National Quarter-Finals, which meant his speech career included at least two more rounds and one more day of competition. The Quarters were even more competitive than the previous rounds, and rightfully so. These were the top students in all of America. Leon talked about the U.S. Energy policy and the direction it should take in the future. He delivered both speeches with the grace and poise he had spent the last four years developing. Just after the sun hit its highest point in the Florida sky, the banner stretching nearly two stories was unveiled, listing the 14 students who advanced to the National Semi-Finals. Leon stood in the Extemp Prep room as he watched the banner unroll and saw the competitor numbers listed. Sure enough, his Screamin’ Eagle attitude put his digits on the hallowed paper. As the sun set on the last day of spring, Leon learned it would also be his last day of competitive high school speech. He would not be speaking on the final round stage, but instead he, and the other non-advancing semi-finalists would be invited on the stage to receive their individual trophies. State Champion and a National Semi-Finalist. Those are two terms that will always be associated with the legacy that is Leon. Congrats!!!! Awesome job, awesome career. 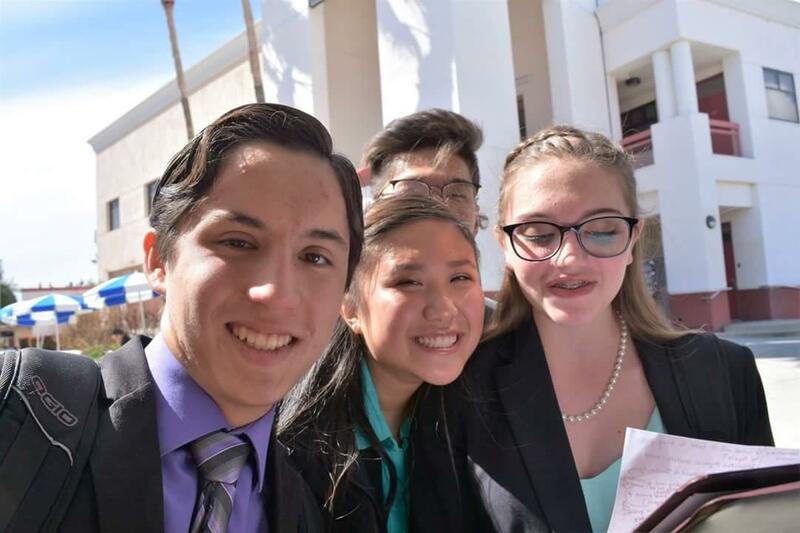 In speech and debate competition, if a school wins both first and second place in an event, it is called, “a close-out”. 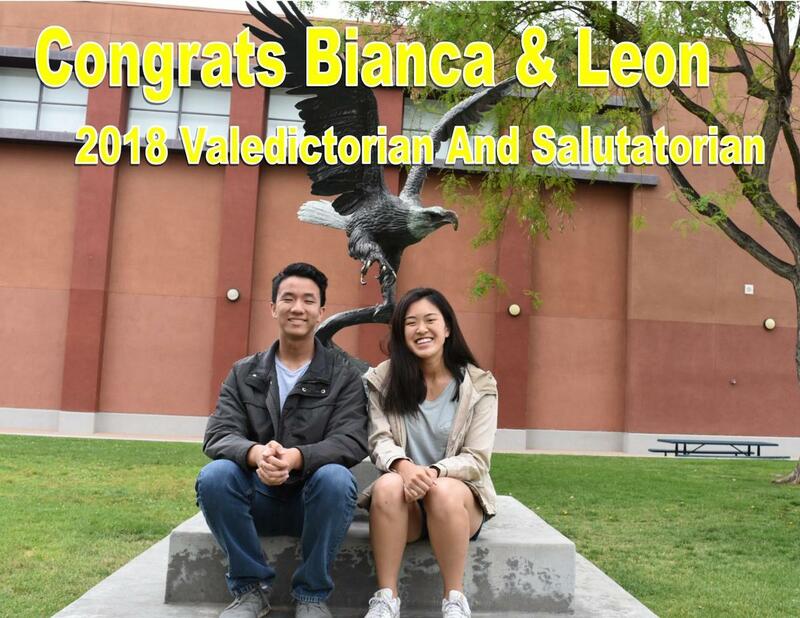 The Screamin’ Eagles are proud to announce a close-out in Gabrielino’s Senior Class of 2018 because team members Bianca Lee and Leon Tran have been named the Valedictorian and Salutatorian, respectively, for this year. Both seniors are 4-year speech and debate members. Bianca, our 2018 Valedictorian, competes in Expository and Oratorical Interpretation. She was a named All-State in Oratorical Interp. at the 2017 California State Speech Championships last year at Arcadia High School. Leon our Salutatorian, competes in U.S. Extemp and Impromptu. He is a National Academic All American Scholar and the 2018 State Champion in U.S. Extemp--the first State Champion the team has had in that event. Leon will be traveling to the National Speech and Debate Championships this summer in Ft. Lauderdale, FL. 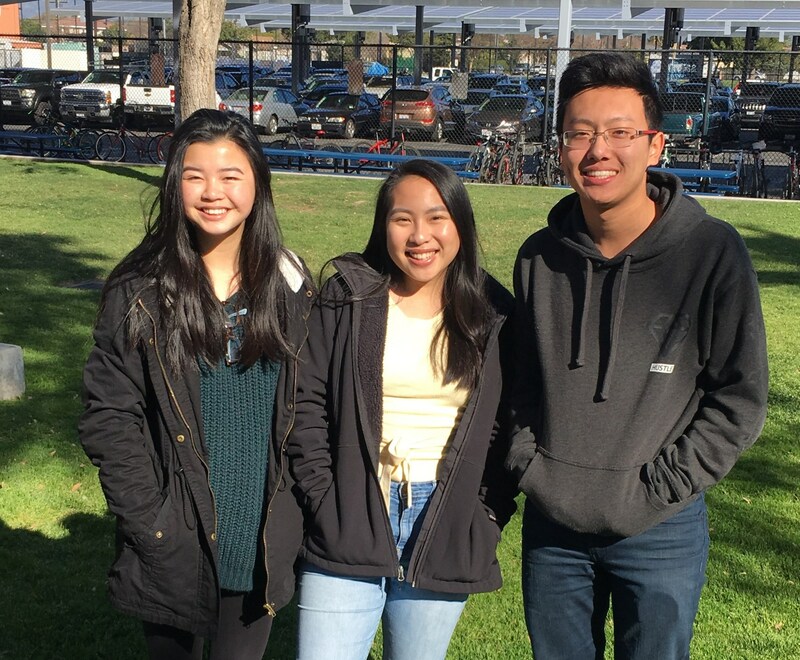 In an article by Angelina Liang, in the Tongva Times, the factors taken into consideration for the positions are students’ grade point average, rigor of classes, number of core classes, leadership, and the volunteer/community service. Bianca will be attending the University of California, Berkeley, in the fall as a pre-Haas business major. Leon will be attending Stanford University as a computer science major. 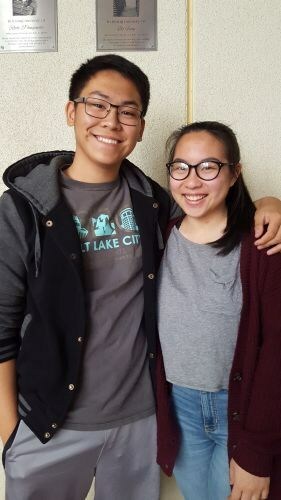 Best of luck to Gabrielino’s Valedictorian and Salutatorian in their future endeavors! 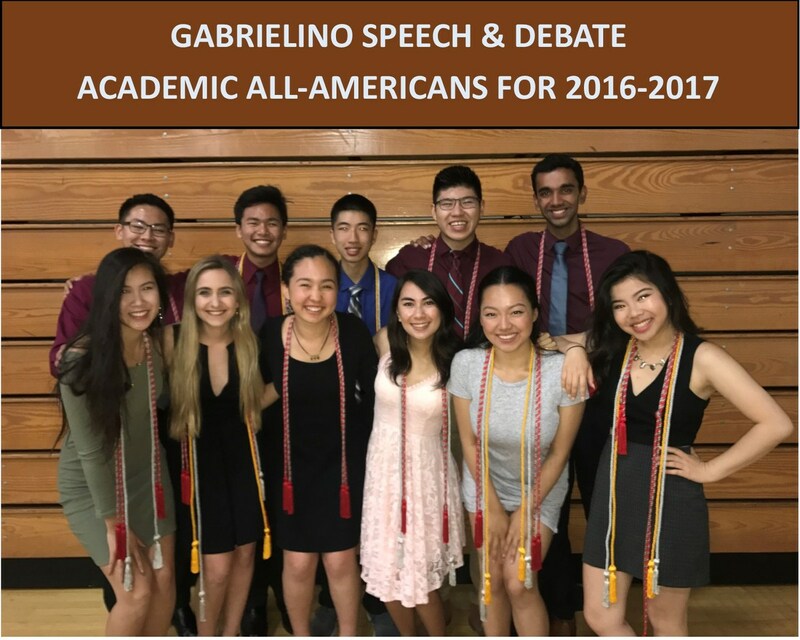 On Thursday, May 31, the annual Gabrielino Senior Awards Night was held to honor students’ academic achievements throughout their high school careers, and 13 of the Screamin’ Eagles Speech and Debate team students were recognized as National Speech and Debate Association Academic All Americans. To achieve the title of an Academic All American student, one has to complete five semesters of high school, earned a grade point average (GPA) of 3.7, or a 3.5 GPA with a minimum ACT score of 27 or an SAT score of 1300, and attain at least 750 National Speech and Debate Association (NSAD) points in competition. The NSDA is the second largest honor society in the United States next to the National Honor Society (NHS). 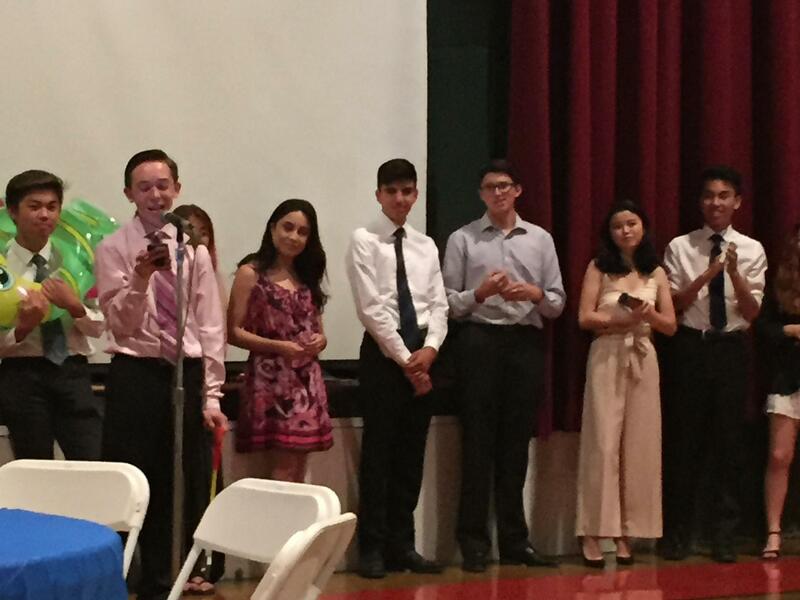 Speech & Debate members Annabelle, Janelle, Michael, Ethan, Jason, Kaylin, Leon, Wendy (not pictured), Stanley (not pictured) and Meng including team captains Angelina, Josh, and Richelle were honored at the banquet with cords for their achievements. The students will proudly wear their cords at graduation to display their academic successes. Students not only have to meet the requirements of the academic aspect of the award, but also have to demonstrate outstanding character and leadership. 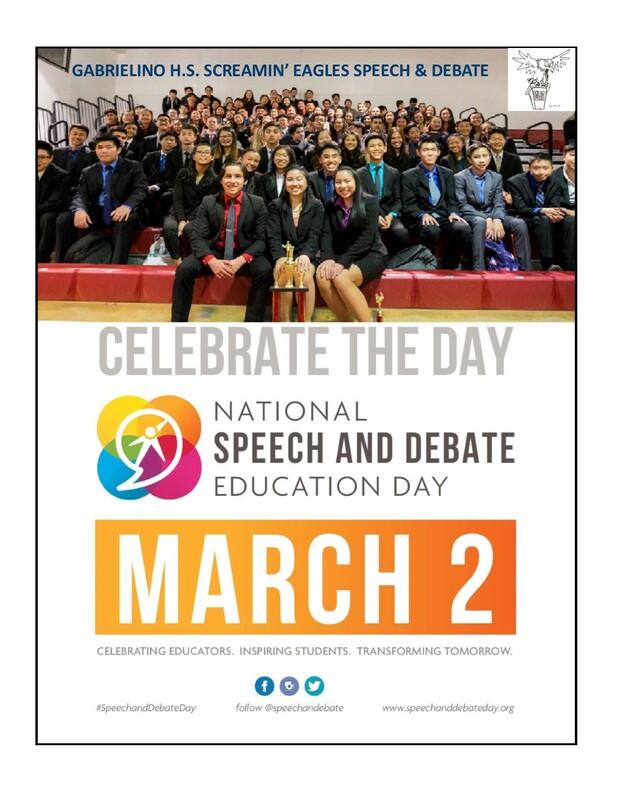 By attending multiple practices after school, actively competing in tournaments, and helping not only themselves but others gain better performing skills, 13 members of the Screamin’ Eagles Speech Team have demonstrated this, all while achieving academic success in their other classes. The team is proud of the work our seniors have achieved, and we wish them luck as they embark on their college journeys. These are the characteristics often associated with an Eagle Scout, the highest rank attainable in the Boy Scouting program of the Boy Scouts of America (BSA). 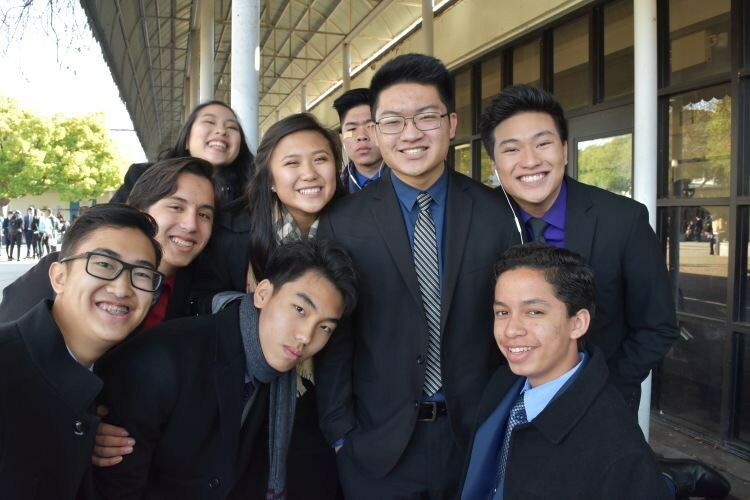 This year, Gabrielino Speech and Debate members Felipe Acosta, Rodin Batcheller, Joshua Raymundo, Ethan Tan, and Matthew Wong were awarded the title. The Boy Scout program administers advancements through seven ranks: Scout, Tenderfoot, Second Class, First Class, Star, Life, and Eagle. The first four ranks are designed to teach a Scout how to participate in groups and learn self-reliance while developing the citizenship and ideals of the Scout program. The last three ranks are centered on leadership skills and community service. Requirements for each rank increase in difficulty, beginning with tying knots and showing Scout Spirit, to eventually serving positions of responsibility and completing a set number of community service hours. Each advancement requires the Scout to undergo a Scoutmaster conference, where the Scout shows how they have grown, and pass a board of review where a committee gives the final approval for the advancement. Eagle Scout is an honor given to less than four percent of all Boy Scouts. In order to achieve it, Life Scouts must earn at least 21 merit badges, be active in a troop for at least six months since achieving Life status, receive seven recommendations, and organize and complete their own service project. Josh’s Eagle project consisted of fixing the staircase in Arcadia Wilderness park. He spent four months fundraising and working in order to complete the task. 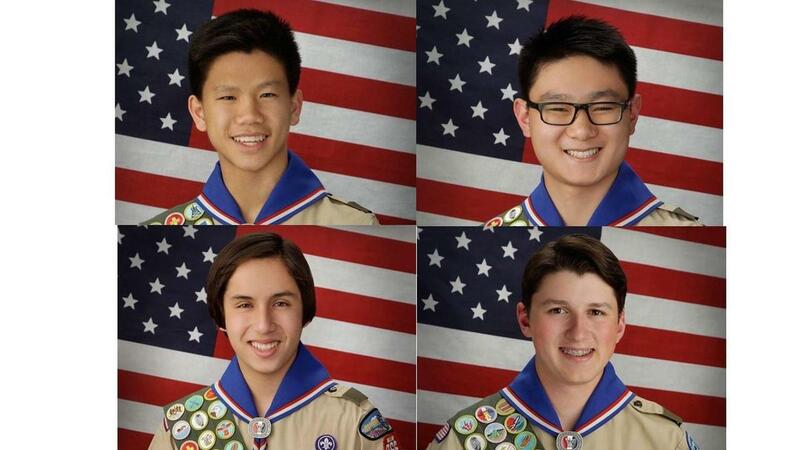 The seniors this year have set the standards for other Scouts in Gabrielino to follow. Felipe, Rodin, Joshua, Ethan, and Matthew will all leave Gabrielino knowing that they have left a legacy behind. A whole year to prepare. The first year Screamin’ Eagles waited all year for their day. 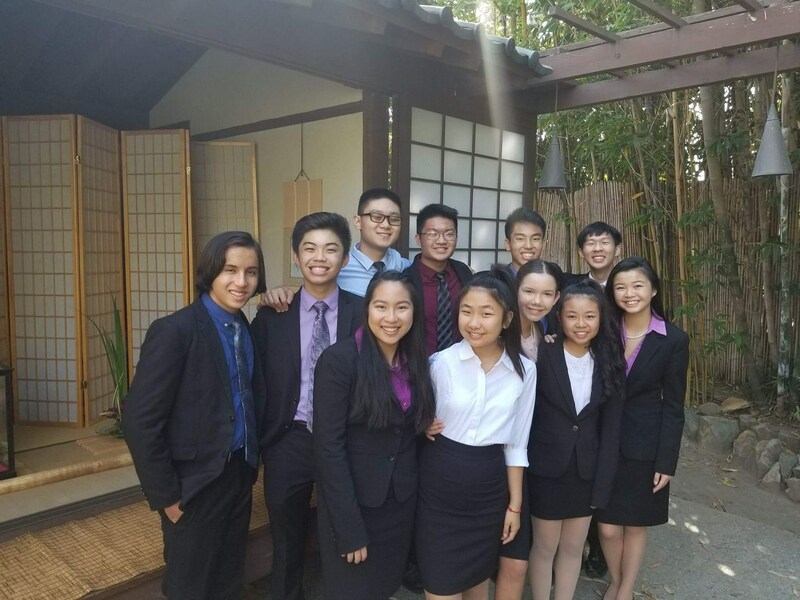 The novices performed their speeches at the Southern California Debate League Novice Championship tournament on May 12. As the tournament was strictly for novices, varsity members were barred from performing. Instead, they ensured that the novices on the team were prepared by regularly practicing with them each week and spectated them during rounds of the tournament in order to give moral support. Grateful for the support, novices dedicated their performances to the varsities who helped them. Many described this experience as tough because it was the final meet of the year but also stated that the competition was fun and rewarding. Memorizing my speech was really hard, but someone once told me that in the end, the payoff would be worth it,” stated Halle, freshman. “Keeping this in mind, I was able to do my best in my rounds.” Halle placed first in both Expository Speaking and Oratorical Interpretation. She dedicated her performances to senior OI event leaders Kaylin and Joshua and senior captain Angelina. The novices have now graduated to junior varsity status as the tournament closed out the school year. 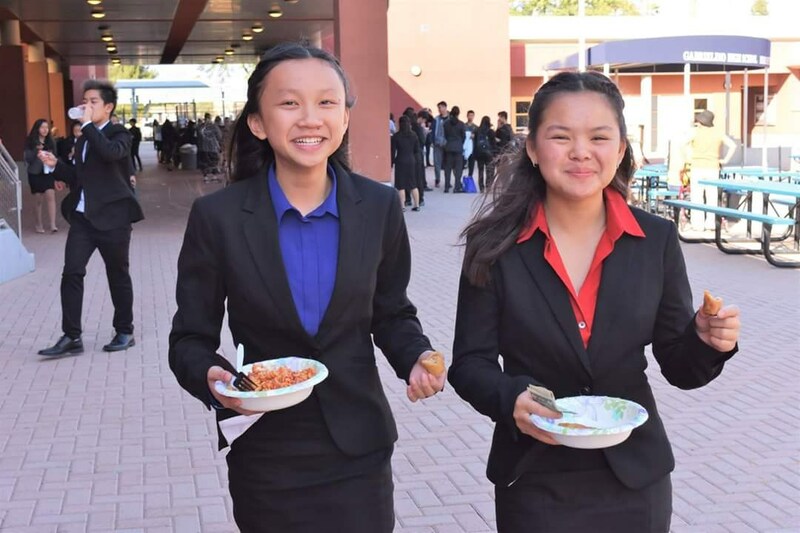 Although wrought with nerves, they put forth their best efforts, receiving a glimmer of what their time in Speech and Debate will consist of next year. After the three preliminary rounds concluded, 54 novices qualified for final rounds and seven were named champions of their event. 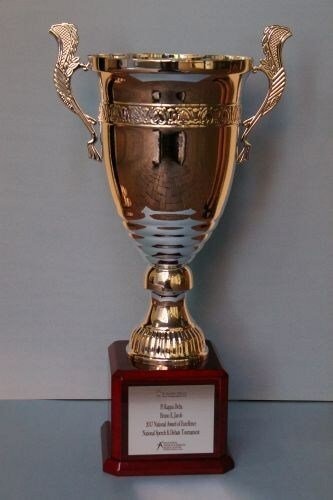 The Screamin´ Eagles won the tournament for the 21st year in a row. Since all the rounds ran at the same time, the tournament concluded at 4 p.m. A whole year to prepare and an entire evening to celebrate a successful tournament. Joshy Goes in World Debate! 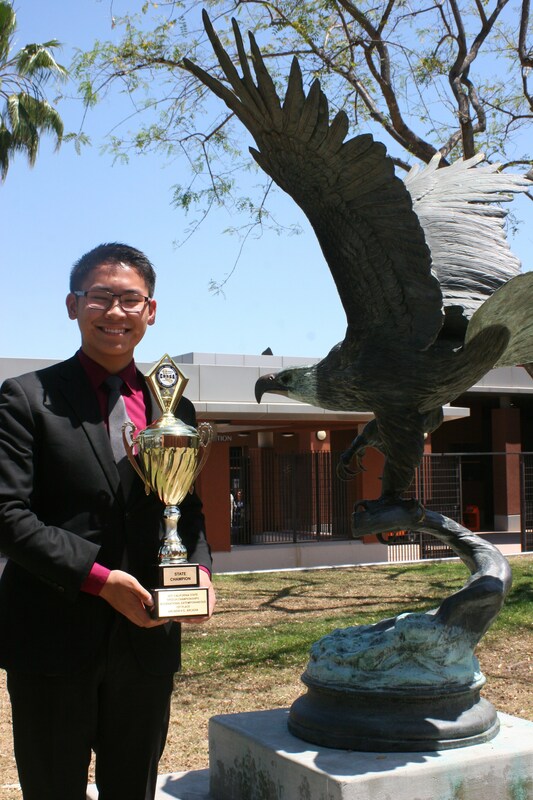 Senior Joshua, one of the captains of the Gabrielino Speech and Debate team, is going to the National Speech and Debate Tournament this June in World Debate. Hand-picked by the head coach to represent GHS, Joshua or as the team calls him, Joshy, is the 17th and final member of the team the Screamin’ Eagles will send to the National Championships in Ft. Lauderdale, FL. 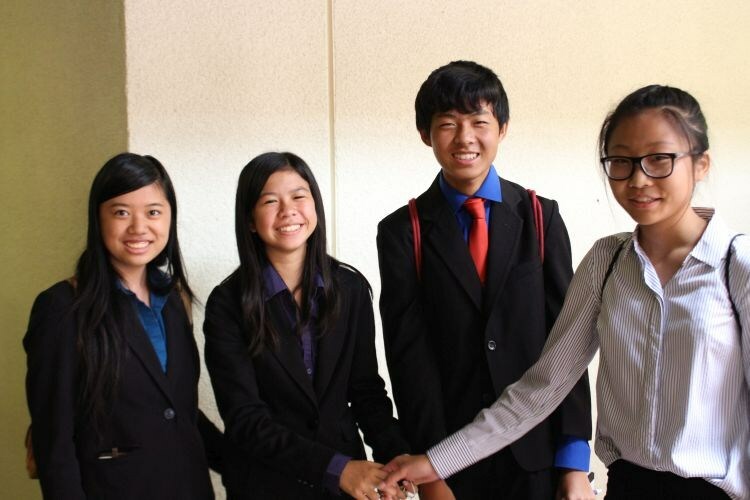 The World Debate Team is comprised two teams of five students from schools in the East LA County/Orange County District of the National Speech and Debate Association. This is the fourth year in a row Gabrielino has been represented on the teams. As Joshua ends his high school speech career this summer in Fort Lauderdale with his 16 other teammates in Florida, we know he will continue to impress. Senior Andy, also known as Schmandy, is known for his iconic phrase: Let us embark on a journey. 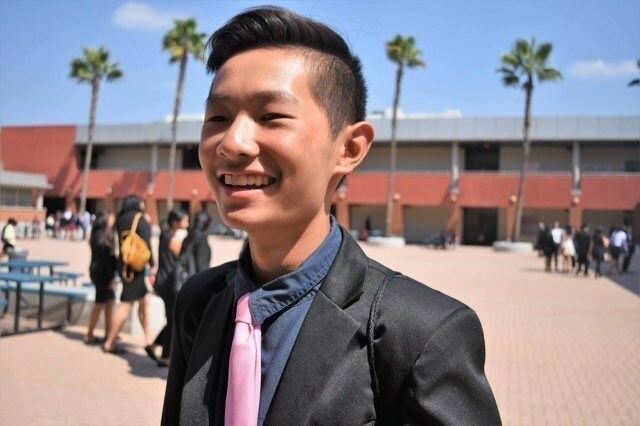 He will soon be embarking on a journey of his own, where he will be recognized nationwide as a competitor in the National High School Speech and Debate Championships. After a student from another school dropped the tournament, Andy was bumped up and will be competing at Nationals in Congressional Debate this June in Fort Lauderdale, Florida. “Representative” Andy will be the 16th member of the Screamin’ Eagles team to be heading to the National Championships. Commenting on Andy’s success, teammate Ethan said Andy is a, “diligent worker, hardworking leader, and great researcher.” In Congressional Debate, Andy will be researching 25 different topics and preparing arguments for and against each topic. With the help of his teammates and friends, the road to Fort Lauderdale will be paved with hard work and diligence. Joining 15 of his friends and teammates, Andy will be competing with the top congressional debaters in the nation. Where is Mountain House? Not, “good luck.” Not, “have a good trip.” Where is Mountain House? It was the number one question the Screamin’ Eagles received before departing on a four day trip to the State Championships in Northern California. There are no hotels in the city. There is, however, a lot of traffic on the nearby freeway leading commuters into the Bay area some 60 miles away. The town also has a high school; appropriately named Mountain House High School. The beautiful four-year old site hosted the 61st annual California High School Speech and Debate Championships. The freeway carries so many vehicles daily it has quickly fallen apart. Unfortunately, for the Screamin’ Eagles, construction crews closed the road down to one lane for each of the nights the team traveled from the school back to the hotel. The 11-mile trek lasted almost an hour. It made the normally long, grueling days of competition all the more tiring and draining. The road from the Interstate to the school looked more like a zoo than a speech tournament. In the front yards of the homes stood horses and llamas. Or maybe they were alpacas. It’s hard to tell the difference driving by at 50 miles an hour. There were probably other furry creatures lurking behind the barns and bushes surrounding the old dwellings. No one was sure if they were traveling to a speech tournament or the Coachella Music Festival. Both are located in the middle of nowhere. After a very odd state qualifying tournament, the Screamin’ Eagles found themselves with the smallest group of State Qualifiers they have had since 2001. Statistics over the past 21 years show the team scores over 30% fewer points, on average, at the State Championships, when the tournament is held in the northern half of the State. To add to the challenge, GHS’s additional course requirements greatly shrank the size of the junior class and reduced the number of sophomores and freshmen. All of these challenges were too much for the team to overcome. After three preliminary rounds, the team advanced only 12 students to the Semi-Finals and only five to the Finals. Low numbers like these haven’t been seen by the powerful Gabrielino speakers since the early 2000s. After all the awards were handed out late Sunday night, the Screamin’ Eagles got on the bus with the 8th place trophy. The last time the team finished that low, most of this year’s members weren’t even born. To add to the disappointment, the team placed third out of all the schools in the southern half of California. At the same time, both feats seem highly exceptional given the upper socio-economic demographics of the majority of the 180 schools who joined GHS in the wide open ranges of Mountain House. In the middle of nowhere town of Mountain House, that boat didn’t come. The S.S. Screamin’ Eagle took on an enormous amount of water, but it didn’t sink. Hopefully, the team will find smooth sailing and have a successful voyage on the coast of Florida at the National Championships this summer. Until then, the team thought about the song Quint sang in JAWS, “Show me the way to go home. I’m tired and I want to go to bed.” After an exceptionally long and draining four-day trip, the song rang true for all the team members. Keep on sailin’ Screamin’ Eagles. Senior Leon is known for his intense work out regime. The 2018 California High School Speech and Debate Championships provided Leon with nice gold dumbbell/trophy to use. 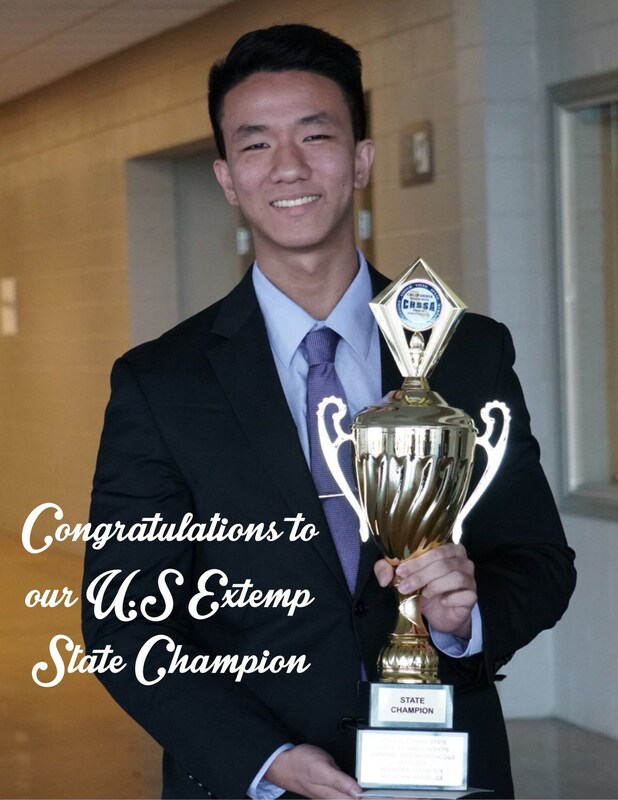 Only one year after Tim Chung became the first Screamin’ Eagle to win the State Championship in International Extemp, Leon became the first GHS competitor to win U.S. Extemp. After the three preliminary rounds, Leon was in 4th place. In semi’s he moved up to 2nd and was only behind by one point. Leon gave a really solid speech in the finals and followed it up with excellent cross examination to win the State Championship by one point. Four years ago, Leon was competing in Duo Interpretation, dancing around and doing characters. Now, he’s discussing trade agreements, senate appointments and health insurance laws. He was in the final round of Fall Varsity in Duo his freshman year. And now, he’s the State Champion in United States Extemporaneous Speaking. Excellent job Leon. Screamin’ Eagle Nation is so very proud of you. These are only some of the key characteristics attributed to freshmen Bianca when she performs, “Prissy Thomas” during tournaments. Entered in Dramatic Interpretation, Bianca captivates her audiences with her stage presence and ability to portray realistic emotions. In her speech, Bianca depicts the story of a girl who faces the challenge of losing her best friend and a compassionate mother who must deal with the outcome. Through this, she shows her audiences that traumatic experiences can often play tricks on one’s psyche as nothing is what it seems. With this in mind, Bianca enters every round with a positive mindset, reminding herself that improving and developing her characters is more important than winning. She gains motivation from the varsity members on the team who have helped her take steps in perfecting her speech. 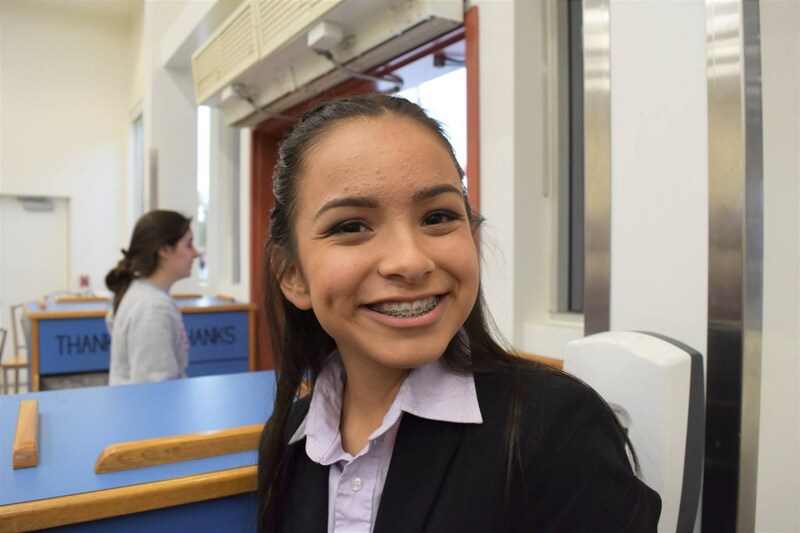 This year, Bianca is one of three freshmen on the Screamin’ Eagles Speech and Debate Team to qualify for the State Championship tournament. Freshman Eric surprised everyone on the team when he qualified for the 2018 State Championships in Oratorical Interpretation. “I’m a very shy person when I’m not confident in what I’m saying, which made Speech and Debate hard for me in the beginning,” revealed Eric. “I finally started to enjoy performing when I stopped thinking about what others thought about me.” He has made tremendous progress in developing his speaking abilities. As the varsity member who has worked with Eric the most, Kaylin cannot be prouder of how much Eric has grown. Eric appreciates her sentiments as he cited her as the main reason why he has the motivation to practice. At the State Championships, Eric hopes to have fun and learn from watching his competitors perform. This will be the last time he can ever perform this year’s speech, so he wants to give his final performances his all. 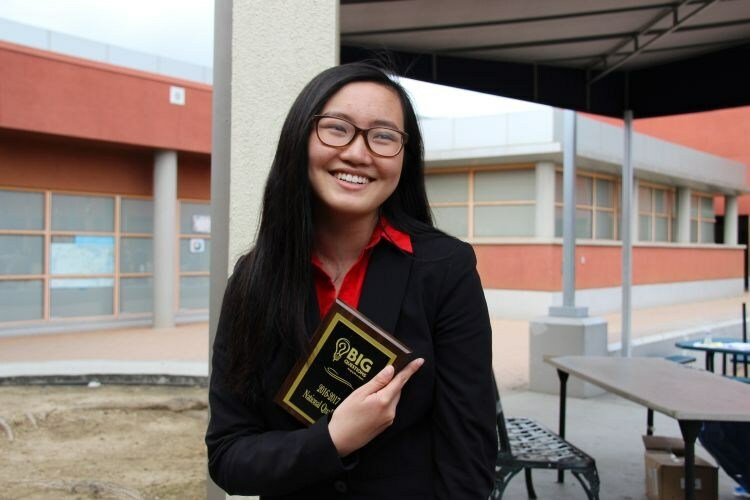 Freshman Chloe began her Speech career as a novice in the Beginning Speech class at Gabrielino. As the school year comes to a close, Chloe is now in the advanced class as is one of the 26 GHS students who qualified for the State Championships. 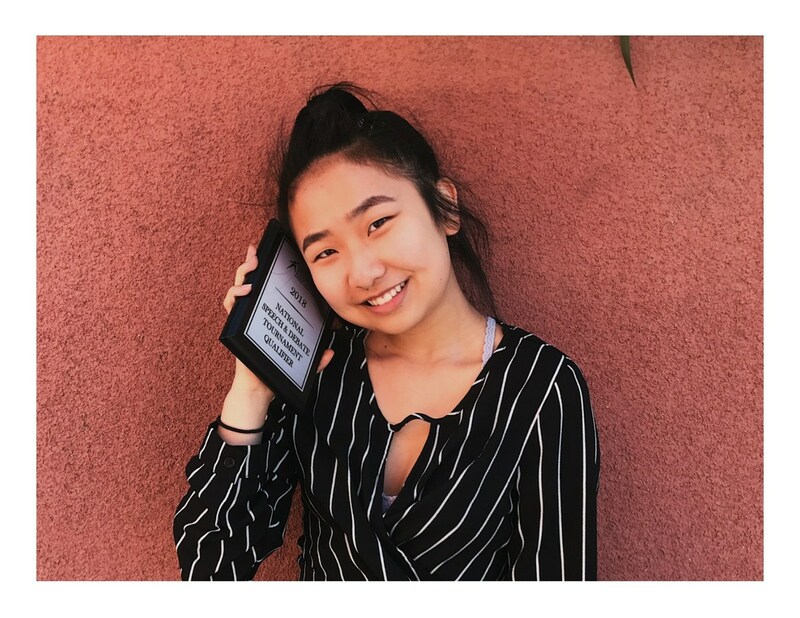 Qualifying in Humorous Interpretation, Chloe showcases the tale of Fred, a customer at a grocery store who encounters difficult cashiers when he attempts to check out 10 items in an express lane that only accepts nine. She garners laughter from her audience when she displays the shenanigans that ensue. Chloe plans to make the most of her experience by performing what she believes to be the best version of her speech. She hopes draw her spectators into her performance so they can feel the same amount of joy she feels on the stage. In the seventh grade, Annabelle followed her sister Caitlyn’s footsteps when she joined the Speech and Debate team at Jefferson Middle School. 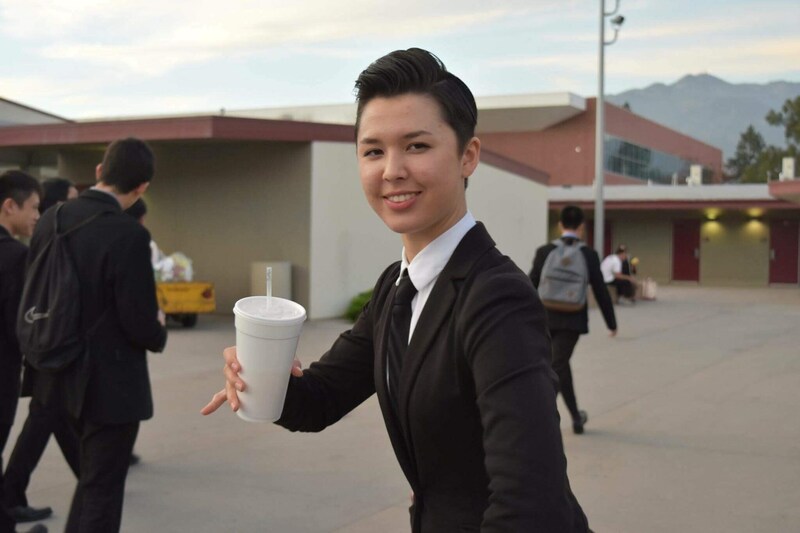 Now a senior and the co-event leader of Original Prose and Poetry of the Screamin’ Eagles Speech and Debate Team at Gabrielino High School, Annabelle has forged her own legacy as she is set to return to the State Championship tournament on April 19 for the fourth year in a row. Often compared to her sister, Annabelle made it her goal to deviate from what others expected of her, opting to exceed their expectations in her own way. She strives to leave a unique impression on those who witness her perform. Annabelle’s current speech focuses on the topic of gender roles in society. 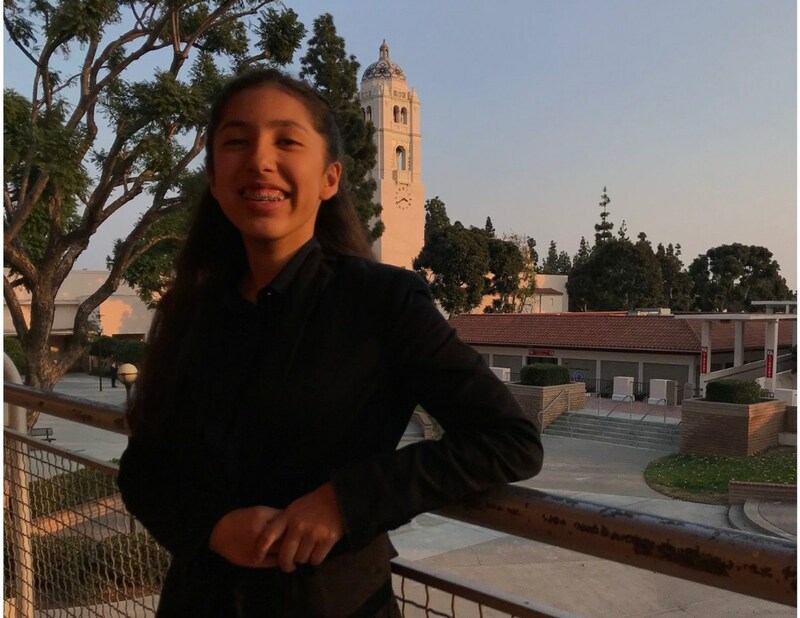 As president of the Gay Straight Alliance (GSA) club at Gabrielino, Annabelle wanted to create a speech that captured her experience with issues regarding the public’s ideals. Acting as multiple characters, she tells the tale of a father who discovers a dress in his son’s backpack. Annabelle’s role as co-event leader puts her in a position to be a leader to those in her event. She not only focuses on improving herself but also helping her teammates develop their speeches as well. Annabelle takes pride in the fact that she is allowed to have a direct impact on the future of OPP at Gabrielino. 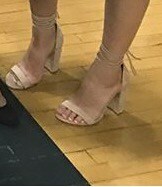 Annabelle is the only member of the seniors on this year’s team of to qualify for State every year of her speech career. Her greatest accomplishment this year was automatically qualifying for the tournament. In order to do so, she had to place first or second at both the Fall Varsity and Spring Varsity tournaments held earlier in the year. In previous years she was just shy of meeting the requirements by one rank, so being able to automatically qualify this year was particularly satisfying. Annabelle hopes to do well at the State Championship tournament but is not focused on winning. Instead, she simply wants her spectators to remember her and her speech. Her coaches and her teammates wish her good luck when she travels to Mountain House, CA with the 25 other students who also qualified for the State Championships. During a rare rainy weekend in Southern California, the Sunshine State of Florida was on the minds of the Screamin’ Eagles. Puddles and downpours were nothing compared to the powerful speeches delivered in the rooms of San Marino High School. 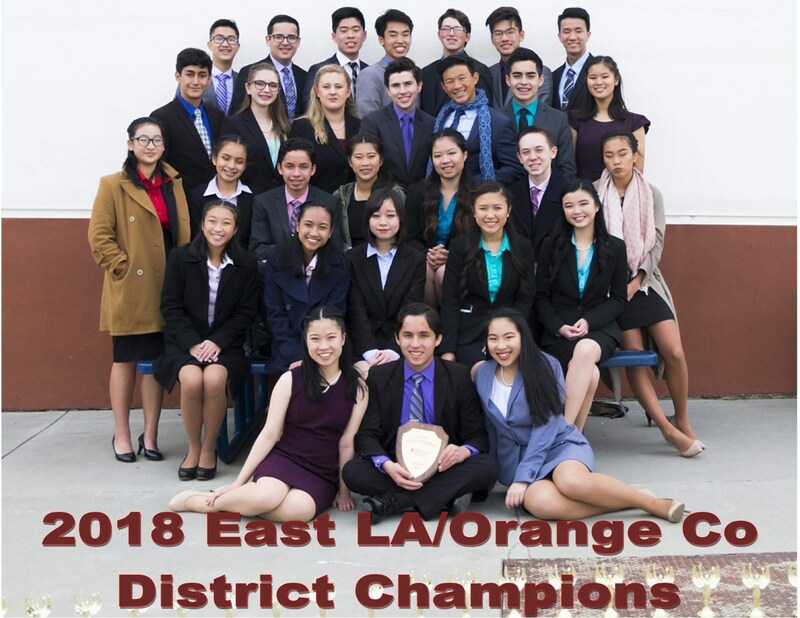 The little school just north of Gabrielino recently hosted the National Qualifying Tournament for 150 competitors from the East Los Angeles County/Orange Country District of the National Speech and Debate Association. To anyone walking on campus, there wasn’t much going on. However small the meet may have seemed, the importance of the competition was crucial. The area is home to some of the best speakers in the nation. One room at San Marino might have three students who will place in the top 15 in all of America. Everyone knew only the top three in each event would qualify for the National Championships this summer in Florida. The rain only added to the drama of the weekend. Commercials airing during sporting events often show athletes in the rain trying to find the strength to continue, to find the will to give everything they have. If the film crews were at Nat Quals, they would have gotten great footage of young adults in the rain and cold, dressed in suits, trying to focus before a round and preparing to pour their hearts and souls into delivering the best performances of the year. Competitors endured three preliminary rounds. They learned if they made the semi-finals by looking for their numbers listed on eight and half by eleven inch white pieces of paper. The process was repeated for the announcement of the six finalists in each event. A little piece of paper, dampened by the rain and leftover humidity, told the students if their dream of going to Nationals would continue. After five highly intense and emotionally draining rounds, the Screamin’ Eagles walked into the small high school cafeteria for the awards. A day earlier, the students at the high school were eating lunch on the same chairs. Today was different. The tables didn’t hold textbooks and packets of milk. They held elbows cradling heads lowered from exhaustion. One by one; event by event, the top six competitors in each event were summoned to the front of the cafeteria. Each finalist was presented a small trophy for their accomplishment. The names were read in the same order as they originally appeared on the white piece of paper. Finally, there was a name and a school associated with each of the code numbers that were posted on print outs. Gabrielino had 24 of the 48 finalists. An even two thirds of the entries the Screamin’ Eagles had made it all the way to the final round. Before moving on to the next event, the most important announcement was made: the names of the three students representing the area, the National Qualifiers. With a few words from the announcer, dreams would either be realized or come to a screeching halt. For many Gab seniors, this was their last chance to perform. It was the conclusion of a long, exciting four-year journey. When all the awards were handed out, The Screamin’ Eagles found themselves with 15 National Qualifiers. 24 spots were available and Gabrielino took well over half. The numbers are remarkable in what has been a down year in Screamin’ Eagles terms; after all, the team has the smallest team going to State since 2002. Four of the top five in half the events, 3 of the top 5 in another, and excellent showings in the final three categories led to the team winning the tournament again. In fact, after 14 judge scores, only two tiny points kept the team from adding another 3 students to their squad going to Florida. By the time the tournament ended, the sun had pierced through the remaining clouds; however, it was still cold. For many walking off campus, they, like the rain clouds earlier, realized their time here was over and their journeys will take them to new places and let them see new things. They may be focusing on the upcoming State Championships or next year’s competitions. Some will be moving on to college and their speech memories will be all that remains. 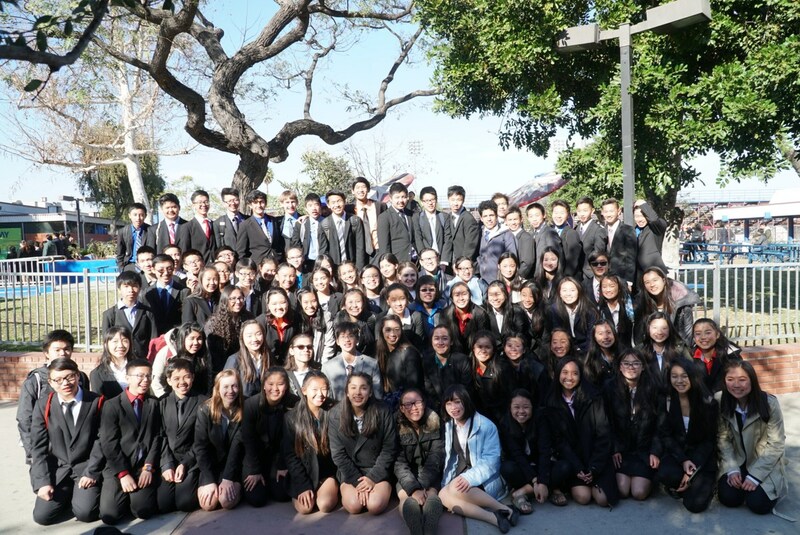 For the 15 Screaming Eagles going to Nationals, they will take to Florida the hopes and dreams of their entire team wishing to find the same exciting adventures and experiences that almost 250 previous Gabrielino students had when they went to the largest academic competition in the world. Rain or not, the Screamin’ Eagles shined bright at Nat Quals!!! Best of luck at Nationals. Thank you to everyone for making this fundraiser a success once again. 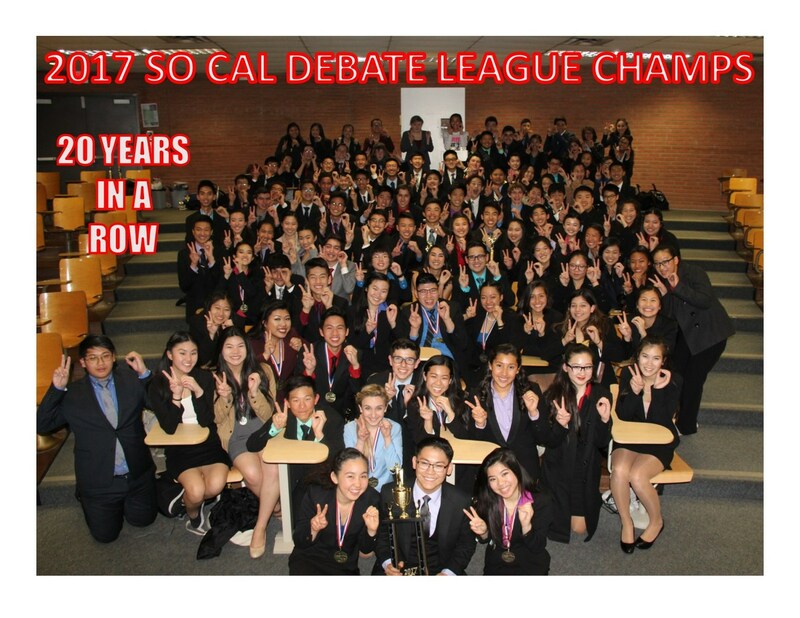 In 1998, Gabrielino High School’s Screamin’ Eagles Speech and Debate Team won their first Southern California Debate League championship. 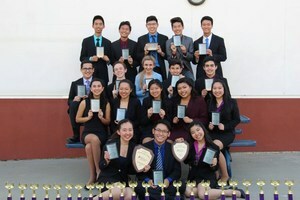 This year, the team remains the reigning champion as they claimed the title again at the State Qualifying tournament at California State University Long Beach on March 3. The tournament consisted of three preliminary rounds, semifinals, and finals. Each round began almost immediately after the previous, leaving no time for rest before students had to rush to the next room in order to perform their speeches once again. Given that this tournament was designated as the last in the league, students felt the pressure to perform well in order to qualify for the State Championship competition held in April. For those who did not qualify, this tournament was the last time that they would ever perform the same speech again. 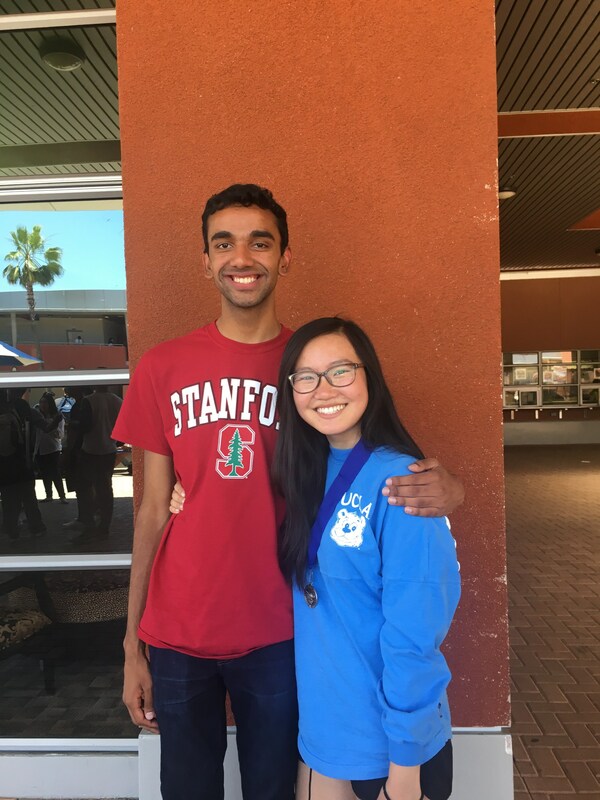 Taking Josh’s words to heart, co-Captain Angelina, senior, put her best efforts into every performance and placed third in Expository Speaking. 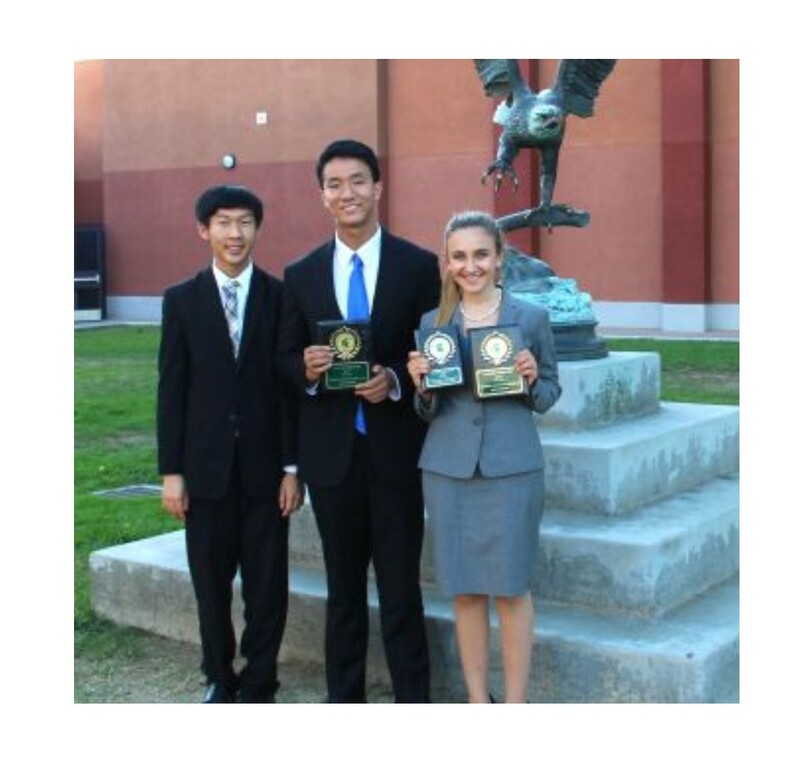 Both Angelina and Josh are four-year Speech and Debate members and will be moving on to the State Championships. The Screamin’ Eagles competed against 18 teams with over 500 students in the area. With seven finalists in 14 events, only the top four or five in each category were able to qualify for State. Out of the 22 students from Gabrielino that entered the final rounds, 20 were able to qualify for State. These competitors will join the six students that automatically qualified for State by placing first or second in both the Fall Varsity and Spring Varsity tournaments earlier in the season. Gabrielino also scored over 200 sweepstakes points, marking this year as their twenty-first league championship win. Several baseball announcers have commented over the years, “I thought I’d seen everything. And then I came to the ballpark today.” It seems there is always something new in every game even though America’s Pastime has been around for over 170 years. The Screamin’ Eagles have been speaking since Gabrielino opened its campus in 1994. In that time frame, almost 250 students have qualified for the National Championships. Only 5 of them were in the event of Lincoln Douglas Debate. And none of them were freshmen. Until now. The elite group of people who have their pictures hung in the speech room after competing at Nationals will welcome into their club a little freshman named Monie. She beat several older, more seasoned debaters in route to a spot on the 2018 GHS team going to Ft. Lauderdale, Florida this summer. After all of the debates were done at the National Qualifier, Monie was one of only two students from public schools who earned the right to go to Nats. Every other spot was awarded to a competitor from a private school. Monie is a testimony to how Gabrielino is beating the odds and the students continue to overcome obstacles and achieve success on a grand scale. Team members will now be shifting their focus on the upcoming League Championships where they hope to win the championship trophy for the 21st straight year. Then, the Screamin Eagles will compete in the speech portion of the National Qualifying Tournaments. Cold weather and an early call time could not deter the Screamin’ Eagles from delivering their speeches. 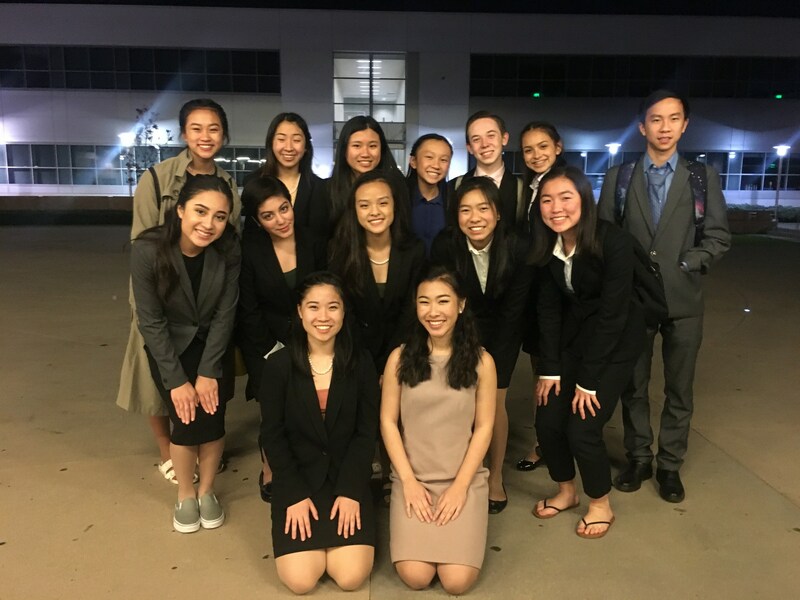 Team members had to be on the bus by 6:30a.m.on Saturday to perform at the Southern California Debate League’s annual Spring Novice tournament at Garfield High School. Unlike a typical tournament, this competition was designed specifically for novices and junior varsity speech members to compete in. Three rounds were held for each round. Chloe was entered in Novice Humorous Interpretation and JV Duo Interpretation and walked away as the champion of HI. She stated that although she received a trophy at this tournament, she knows that there’s always room for improvement and will continue to refine her speech for upcoming competitions. As a novice, Chloe still has another year to perform at Spring Novice because she can come back as a JV member next year. Fellow teammate Sarah, sophomore, on the other hand, cannot say the same. Competing in this tournament as a JV, Sarah wanted to give her performances her all because she knew that it would be the last time before she would become a varsity member of the team. Her efforts paid off when she received a trophy for Expository Speaking. 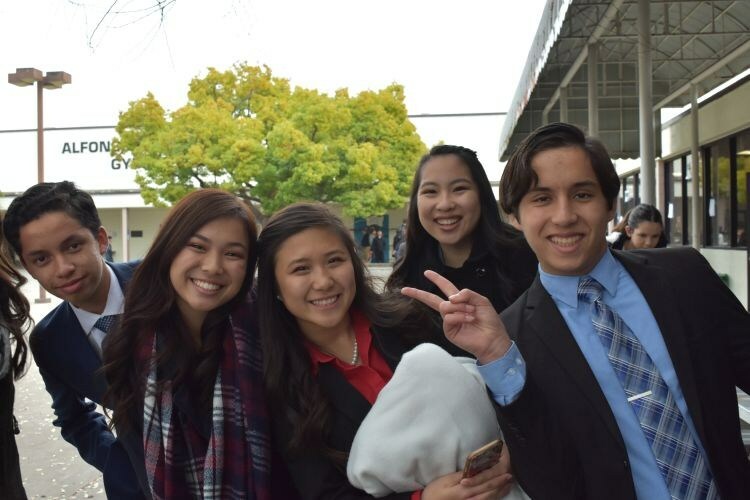 While the novices and JV members were competing, varsity members were judging rounds, running the ballot room, and keeping the event organized. When they had time, they spectated different events. With no final round, the Screamin’ Eagles were able to head home early at 3:30 p.m. There wasn’t a press conference. There were no cameras. There wasn’t a rally. No articles were written in the Pasadena Star News. It came in the form of a simple announcement on the Gabrielino public address system. Seniors Jannelle and Chris along with Screamin’ Eagles Team Co-Captain, Angelina were named National Merit Finalists. Gabrielino High School is once again home to students recognized on a national scale for their academic excellence. And once again, they are speech and debate team members. Of the 1.6 million students, on average, who are considered for the award, only the top 1% become finalists. Later this spring, the three will learn if they are in the top half of that elite group to earn a $scholarship from the National Merit Scholarship Organization. To be a part of The Screamin’ Eagles is to be a part of something special. Students compete with some of the best speakers in all of America. They share the success and understand the hard work that goes into being the best at their craft. The pride, honor and tradition of the program requires all of Screamin’ Eagles Nation to salute these three members for their dedication to the pursuit of excellence. The media and general public may focus on athletics and the shortcomings of schools, but those who have put in the work, endured the stress, overcome the obstacles, and are now reaping in the rewards fully understand and respect what these three young adults have done. Congratulations to you. We are not surprised, but very proud. 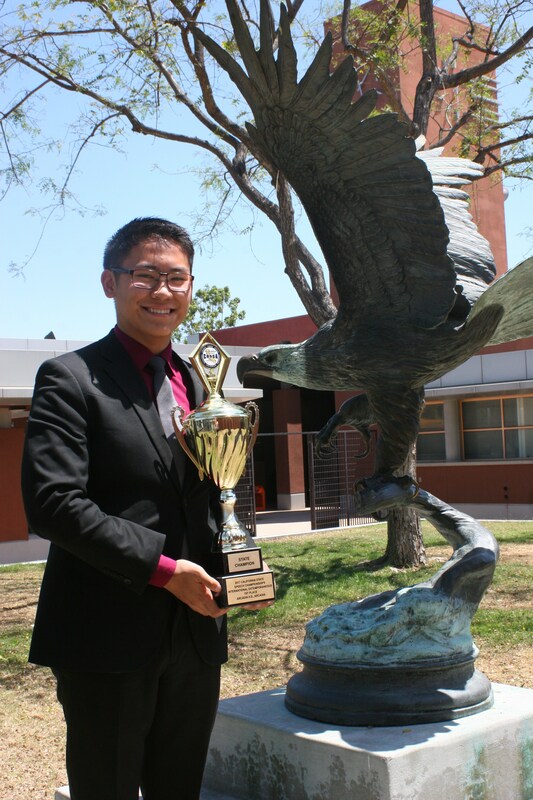 On Feb. 3, The Southern California Debate League’s second varsity tournament of the year brought on fierce competition for the Screamin’ Eagles. Spring Varsity at Arcadia High School was where students who were first or second at Fall Varsity could automatically qualify for the State Championships in April. In order to do so, these students had to place first or second in the final round of the same event at Spring Varsity meet. Out of the ten Screamin’ Eagles who had the chance, six qualified for State. The rest of the team will be competing at the State Qualifying Tournament/League Championships on March 3rd for their spot on the team. Sierra’s efforts paid off when she placed first in Expository, earning her the second leg needed to qualify. For the handful of senior team members choosing not to compete next month in the league championships, this tournament was the last time that they had the privilege to showcase their speeches. With this in mind, many went into their rounds with the only goal to deliver their best performance and walked away proud. Gabrielino took first place out of the 22 schools competing at the tournament scoring over 200 points. . The team has won the tournament for the past 20 years. Along with his duo partner, sophomore Sam, Gabriel took first place in Duo Interpretation. He was also named the champion of Humorous Interpretation. Although Spring Varsity marked the end for some, for others like Gabriel, Sam, and Sierra, their journeys seem to be merely beginning. They practice vigorously every week to prepare for State as they wait to find out who will be joining them. Overall, the Speech and Debate team pulled off another successful tournament. 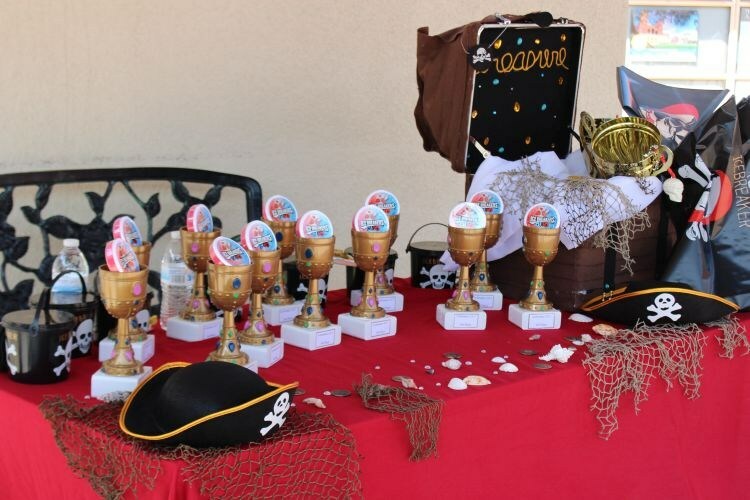 76 Gab students qualified for the semi-finals and 39 were in the final round of the competition. The Screamin’ Eagles won half of the events at the meet. The team will now shift its attention to prepare for the upcoming State and National Qualifying Tournaments and the League’s Spring Novice Tournament. The Martin Luther King Jr. Center for Nonviolent Social Change explains the meaning of MLK Jr. Day, “is not only for celebration and remembrance, education and tribute, but above all, a day of service.” The alumni of Gabrielino proved, yet again, how much they value the experiences they learned as members of the Screamin’ Eagles. They gave up most of their holiday weekend to coach, support, and judge for the GHS students on the program they hold so dear to their hearts. Even though the alumni on the coaching staff have a combined fifty plus trips up to the Bay Area, they once again sacrificed their time and sleep to make sure this year’s Logan team had an incredible learning experience. One of the coaches took a flight up to Oakland so she wouldn’t miss a day at her work or a night of practice with her students. Another coach didn’t let her third trimester of pregnancy keep her from working with this group of incredible kids. Over the years, the assistant coaches have skipped their college classes, missed work, forgone holiday weekend getaways and parties to provide their invaluable service to Gabrielino’s powerful and passionate speakers. They continue to make a difference in the lives of the students they coach in hopes they too will go out and do great things as well as come back to help future team members. ﻿The weekend was a wonderful reunion for the expository students and their former coach, Eileen. At the end of last season, she accepted a job in San Francisco and said leaving the team was one of the most difficult things she’s had to do when switching career paths. Her former students were highly motivated by her presence and assistance--most every one of the 10 entries made it to the quarterfinals of the tournament. Four made it to semis and two made it to the final round. The Screamin’ Eagles have grown to become one of the top programs in all of America. Many of the successes and experiences are because of the sacrifices, dedication and support from the alumni. Most people outside of the activity have no idea how much of an incredible impact The Screamin’ Eagles have on the lives of the students on the team; however, the alumni of Screamin’ Eagles Nation fully understand the benefits. Once again, they stepped up and made the experience even more amazing. MLK said, “life’s most persistent and urgent question is, ‘What are you doing for others?’” Thank you alumni, coaches, and judges for your continued service to our program. You have done and continue to do and incredible job of helping the speakers on the Screamin’ Eagles . Dr. Martin Luther King Jr. would be exceptionally proud of your efforts and your accomplishments. Dr. Martin Luther King Jr. used his incredible speaking abilities to inspire change in the minds of people and government policies around the world. 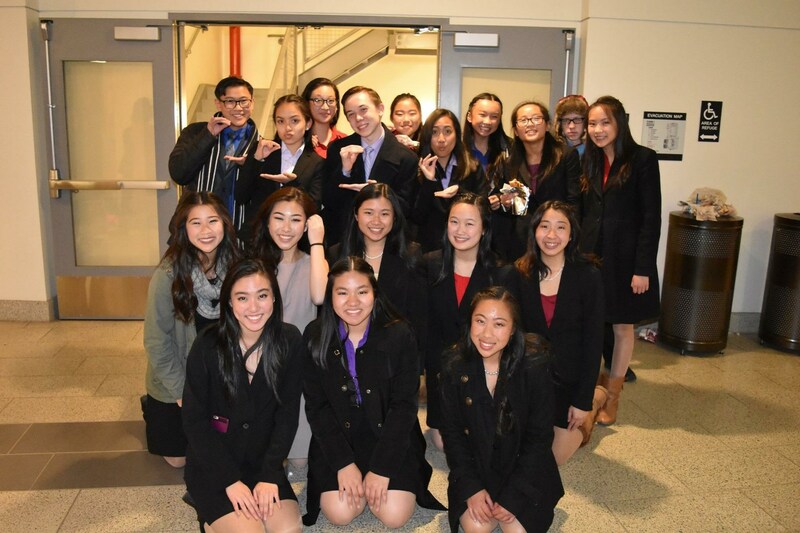 The Screamin’ Eagles’ annual trip to the James Logan High School MLK Jr. National Invitational Speech and Debate Tournament provided a perfect opportunity for the team members to communicate their messages to competitors and judges from all over America. One can only wonder what the great MLK would say if he could be in attendance at the tournament in his honor. He would probably be amazed at the level of talent and passion young people have for their messages. He would have great admiration for the adults who sacrifice so much because they understand the impact of this incredible activity. He would’ve been very impressed by the Screamin’ Eagles. Senior Co-Captain Angelina’s Informative speech on Virality provides insight into how media becomes viral and the powers they bestow. Josh, also a co-captain, delivered a speech on how hate and racism in our communication should instead have hope and unity as its cornerstones. Richelle, the third captain, told the true story of a woman who lost a loved one in the Charlie Hebdo terrorist attack three years ago. Dr. King most likely would have great commentary on how most people ignore the high level of intellectual rhetoric, oratory and interpretation present in the rounds of competition. Instead, many get caught up in the fervor of Presidential tweets, idiotic name calling, reckless and stubborn discourse, and protests which are anything but peaceful. He would’ve been encouraged to watch teenagers sit respectfully in rounds and listen to their peers explain their ideas. The great paradox in our society is that the young people in speech and debate communicate with great poise, respect and maturity while our adult political and media leaders act and argue like children. “My speech is about how the power of handwriting comes from the time and energy you put into composing it. So if you care about something, write about it,” said sophomore Felicia, who placed 2nd in the Informative category, “Written and oral communication is just as important today, if not more so than it has ever been. It was an honor for me to get to perform in the final round of this prestigious tournament on such a meaningful national holiday”. The Civil Rights Movement was filled with passionate speeches. Dr. King spent countless days detailing his dream to his followers and non-believers. Town after town, leaders spoke their messages over and over again. They would not quit. The Screamin’ Eagles deliver their speeches weekend after weekend. They become better speakers and develop valuable skills which will help them throughout their lives. They learn from each other. They support each other. On this particular weekend, The Screamin’ Eagles competed against some of the best speakers in America. As the weekend progressed, the pool of students was narrowed down based on their scores. 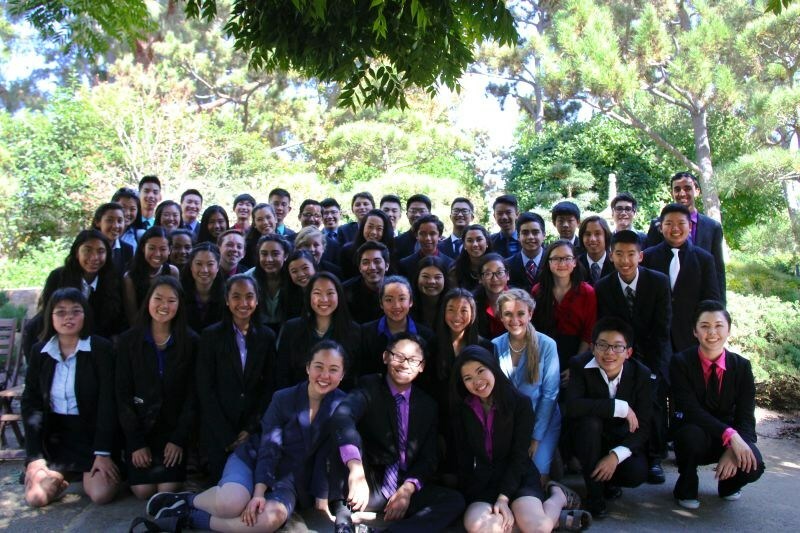 After a long drive up to the Bay Area and two long days of competition, GHS placed 4th out of 84 schools. Hands shivering from the cold, the Gabrielino Screamin’ Eagles bounced in excitement as they prepared for the first varsity league meet of the year at Schurr High School. Event leaders gathered their groups for the traditional morning pep talks before everyone rushed off to run through their speeches and squeeze in their last moments of practice before the first round. As this was his last year competing at Fall Varsity, Jason stated that thinking about the larger importance of his speech motivated him to do his best. His efforts paid off when he was named the champion of Original Advocacy. Between rounds, students met with other competitors in their event in order to update them on their performances and give each other support. These short intervals of roughly 10 minutes were their only times to rest before delivering another speech. The Speech team put 42 members in the finals. 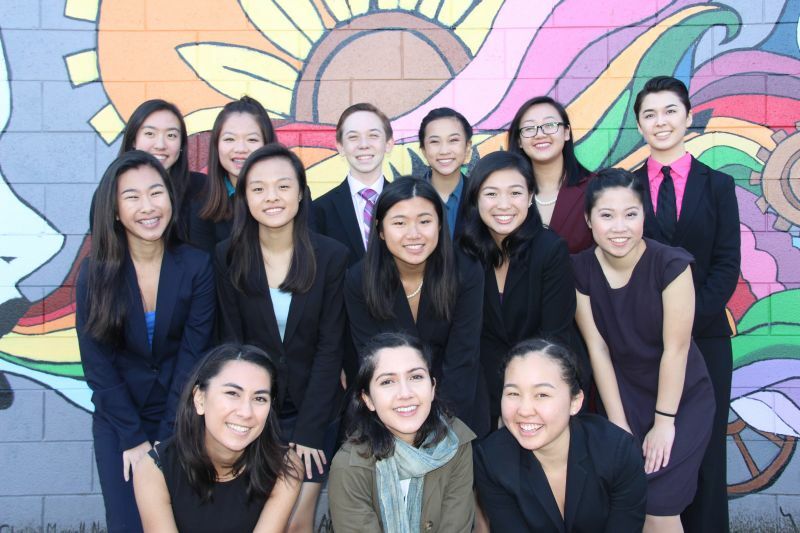 Of the finalists, eight students were able to partially qualify for the California Speech and Debate Championship by placing first or second. Spring Varsity, a tournament scheduled to be held in February, will be their chance repeat their results in order to fully qualify for the State Championships, which will take place in April. Overall, Gabrielino won the tournament for the 18th consecutive year, beating the 15 other schools competing. The team still has a long way to go before the season ends, but the Screamin’ Eagles continue to practice and are ready to take it all in stride. Hosting a speech tournament is a challenge many schools will not attempt. The Screamin’ Eagles have hosted almost 100 over the past quarter century. This year, the team did something they had never attempted: host an invitational and a league tournament in just over two weeks. 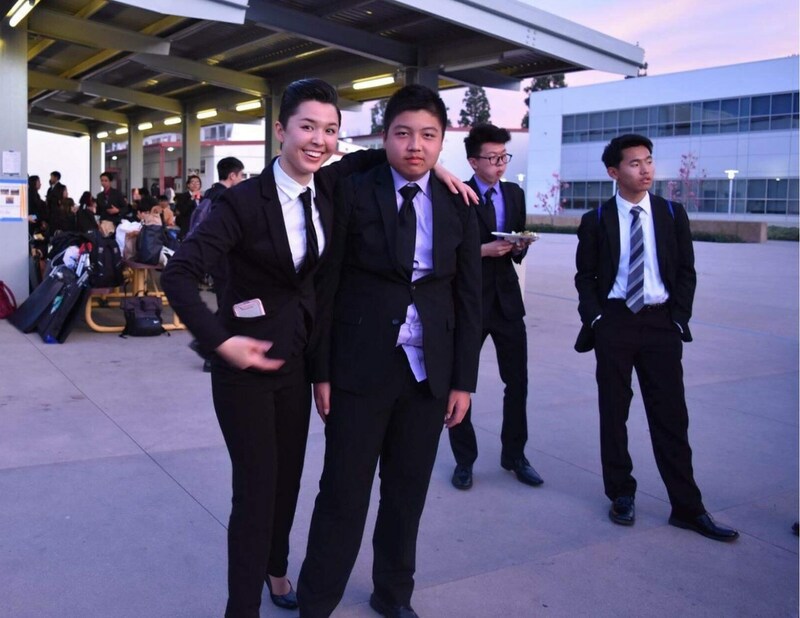 The school year started with November 4th marked as the date the team would host the Southern California Debate League’s Fall Novice Tournament. As the challenges presented by the annual tournament at CSU Long Beach arose, the team decided to host its first-ever Varsity Invitational Meet. The school calendar dictated the date to be just 15 days before running the Novice competition. It wasn’t really a surprise. It isn’t any breaking news. The Screamin’ Eagles are one of the best programs in all of America. The students, parents, alumni and coaches have proven time and time again they can make amazing happen. Thank you to everyone for putting on two fantastic, well run tournaments in an incredibly short amount of time. Way to go Screamin’ Eagles Nation. This truly was a great whole-team effort!!! 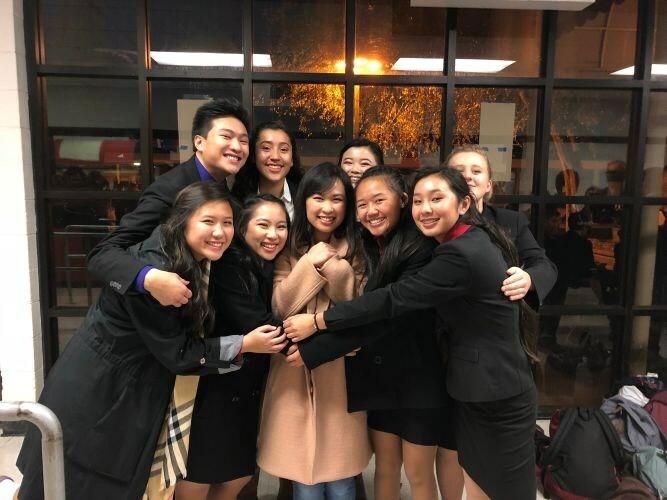 This year’s annual Southern California Debate League’s Fall Novice took place on Nov. 4 at Gabrielino, a tradition that has lasted over 20 years. Novice and Junior varsity (JV) members arrived on the scene no later than 7:10 a.m. to compete while varsity members gave moral support and judged the three rounds of 14 different events against 15 area schools. Halle, a novice, was entered in the JV division, unlike at the previous tournament, the Screamin’ Eagles Invitational. She revealed the experience allowed her to hear higher level speeches, and while slightly intimidated, it gave her a goal to strive for in the future. As the underclassmen performed, varsities could be seen either trailing behind, watching them in order to give feedback after rounds, or judging the rounds. Jaycob compared the novices and JV members to babies, stating he speaks for all varsity members when he says they want to protect those who compete and ensure they are prepared no matter what. He confessed nothing was more satisfying than seeing the lower levels perform and knowing he played a role in helping them develop their speech. The tournament concluded at a very reasonable time of 4 p.m. Combined, the novice and junior varsity members won well over half of the awards. 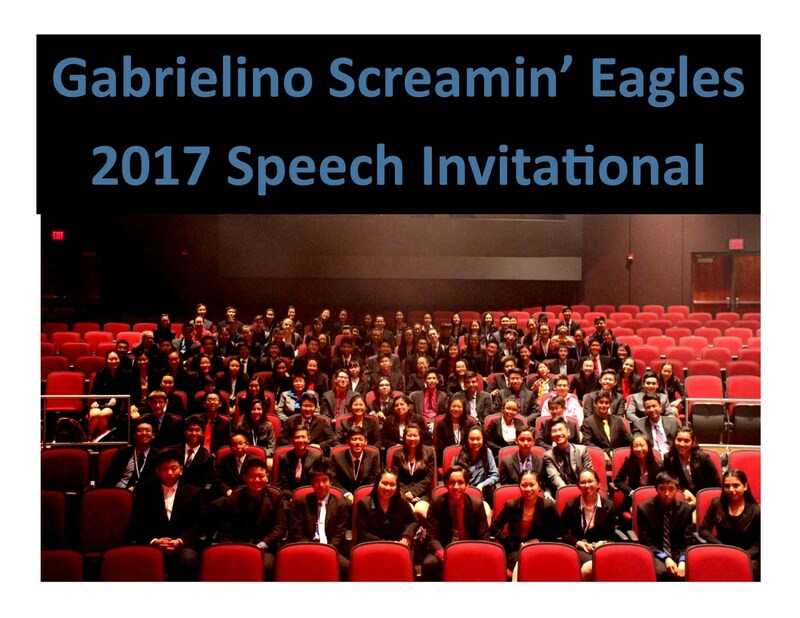 On Oct. 21, the Gabrielino Speech and Debate team hosted its first Screamin’ Eagles Speech Invitational against several area schools. As the only varsity tournament the school had ever held, this competition was to replace Jack Howe, the original event that started off the season years before. Team officials revealed that this tournament had been in the making for years now, but the timing was never correct. Now that it was, their ultimate goal was to make this meet shorter, faster, and cheaper than many others while still creating a fun and competitive environment for the students. As the day began, students arrived on campus at 7:15 a.m. to check in and prepare for the competition. Captains and event leaders gathered their groups together to reassure and uplift their members with pep talks. With three preliminary rounds and one final round in each event, students who signed up for multiple events had to perform in one room only to rush off into another to deliver another speech. Senior Sydney was entered in four different categories which meant she talked for almost 120 minutes, two full hours before the final round was even posted at 1:30pm. “At the beginning I was nervous because I didn’t know if I could pull it off,” said senior and cheer captain Sydney, “but as I entered into each of my rounds, I was greeted by friendly faces and encouraging smiles. That gave me the confidence I needed to perform, and I had a lot of fun”. The rounds started almost immediately after one another, and the finals began after the judges met to deliberate the six in each event who were chosen to move on. 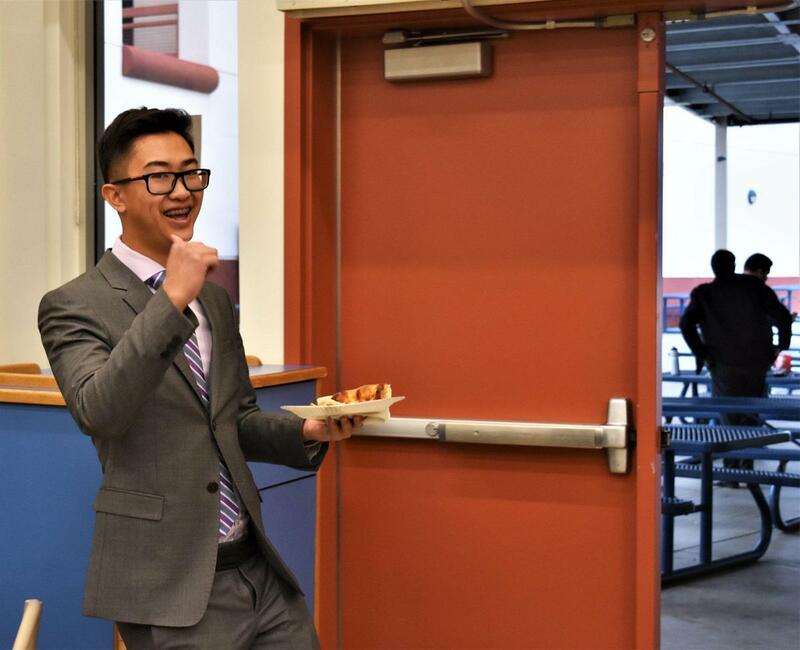 Between rounds, students were able to go to the concession stands where food and drinks were being sold. They also chatted with one another in order to update each other on how they were doing, creating a sense of community. For awards, students were directed to head into the Goodson Theatre where the six finalists of each event were invited onto the stage to receive their awards. Places fourth through sixth were given medals while first through third were awarded trophies. 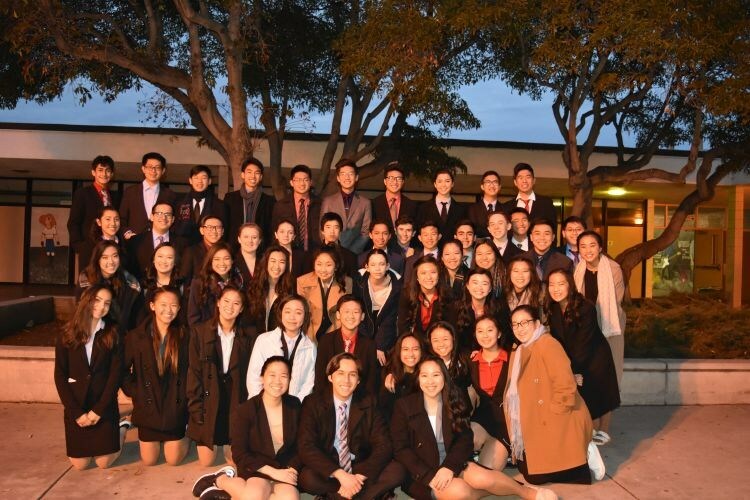 The tournament concluded at the record-breaking time of 4 p.m. Based on the success of this year’s competition, the Gabrielino Speech and Debate team officials hope to turn this invitational into an annual tradition. Four-year speech seniors Felipe and Andy were named National Hispanic Recognition Program Scholars by the College Board. They are among the top 2% of the 250,000 students of Hispanic heritage who took the 2016 PSAT. Way to go Felipe and Andy. Tournament costs and an unnecessarily complicated registration were enough to keep the entire Screamin’ Eagles Team from competing in the annual tournament at Cal. State Long Beach. The debaters, however, managed to endure the process. Twelve of the team’s members debated for two long days and nights at the campus just a few blocks away from Pacific Coast Highway. After several rounds of competition, senior Ethan made it to the Octo-Finals in the Lincoln Douglas Debate event. Sophomore London was named one of the top 10 speakers in her debate category. London also made it to the semi-finals of Original Oratory. Senior Co-Captain Josh was in the finals of Oratorical Interp. Senior Jason qualified for the semi-final round of Extemp. The team, although vastly smaller than in previous years, made the annual trip to the Japanese Garden on the far side of campus to keep the tradition alive (and send pictures to their teammates back in San Gabriel). 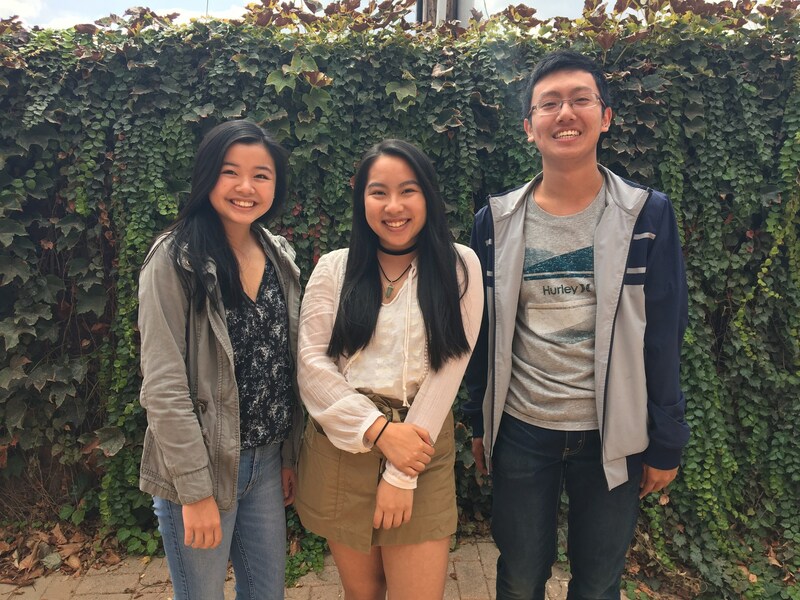 This year, three Speech and Debate students, Jannelle Dang, Angelina Liang, and Christopher Lung, were named National Merit Scholarship Semifinalists. A highly regarded academic competition for recognition and scholarships, the National Merit Scholarship began in 1955 and about one in every six Finalists receive $2,500 scholarships every year. In order to be considered a Semifinalist, students must meet or exceed the set standard for their state. At Gabrielino, students enter the competition with their PSAT / NMSQT scores obtained in their junior year. Although many of his peers remained unshocked when discovering that Christopher Lung was named a Semifinalist, the same could not be said about Lung himself. 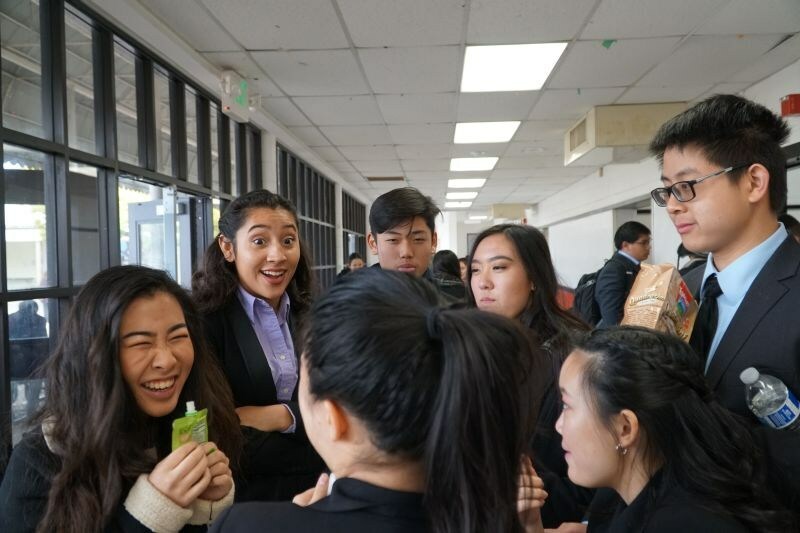 Similarly, event leader for expository Jannelle Dang and Speech captain Angelina Liang also faced the same emotions when finding out they were Semifinalists. While walking to Speech practice after school, Dang and Liang passed by school’s marquee at the front entrance where they saw their names flashing on the board. Confused, they waited for the next slide where it announced that they had been named Semifinalists before crying out in surprised excitement. All three students were formally notified of their status via their counselors the next day. Currently, the three have sent in their Finalist applications and are lying in wait for the day in February where the list of Finalists for the scholarships are set to come out. Dang, Liang, and Lung are doubtful of their chances to win but hope for the best. “I’m just grateful that all our hard work seems to finally be paying off,” stated Liang. 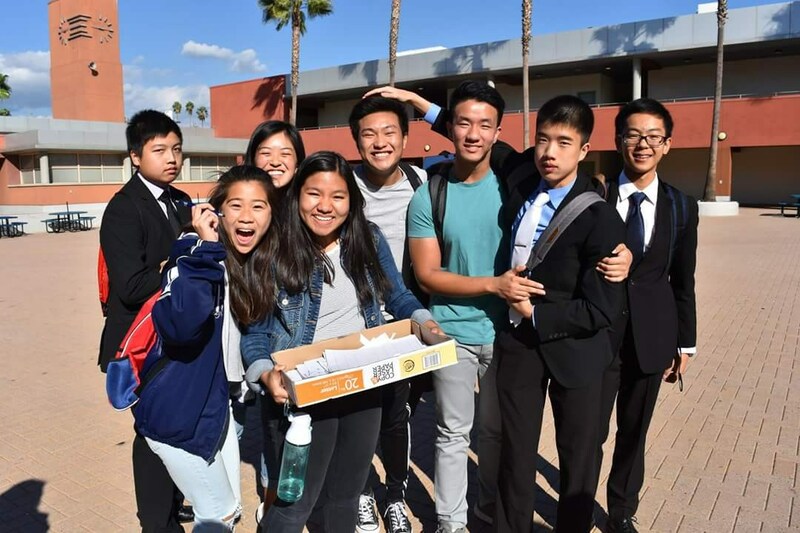 While most students would be sleeping at home, the Gabrielino Speech and Debate team arrived on campus at 7am on a Saturday to compete at the annual Icebreaker competition. Open to everyone, the Icebreaker is a speech tournament that enables speech students and non-speech students alike to work together and create great memories. In teams of two, with one veteran Speech member pairing up with a novice or a non-speech student, students entered a total of four impromptu rounds. This way, experienced Speech members were able to teach another Speech student the ways of Speech and Debate. More than this, the Icebreaker was dependent on student participation in almost every other aspect too. In contrast with a normal judging system in which adults were invited to judge the students, the seven pairs who competed in each round ranked each other according to their own preferences. In the end, the highest and lowest score was dropped, creating a final score with the average of the two middle scores and ensuring that biases were eliminated. 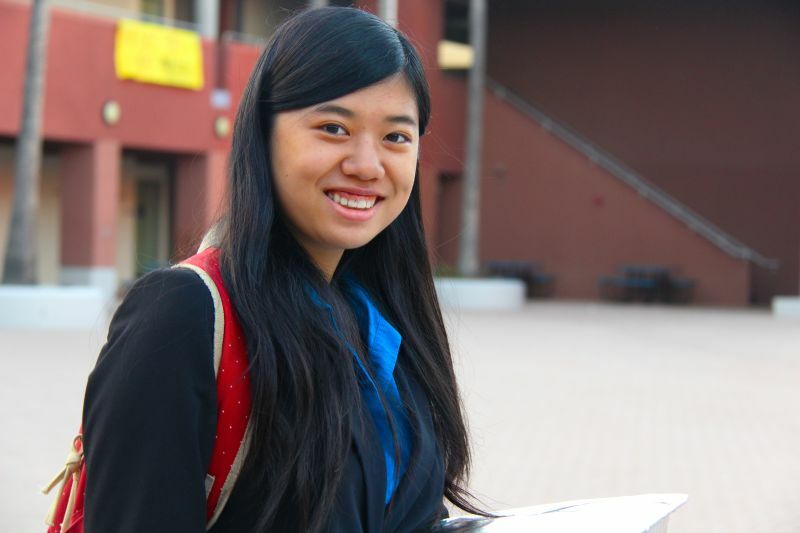 “Just keep calm and everything will be fine,” advised senior Janice Chen. The competitive nature between Gabrielino and the other schools involved set a serious tone, but the intensity was downplayed by the privilege of having a mentor. As the first tournament of the year, the Icebreaker was designed for students to get acquainted with the speech environment. 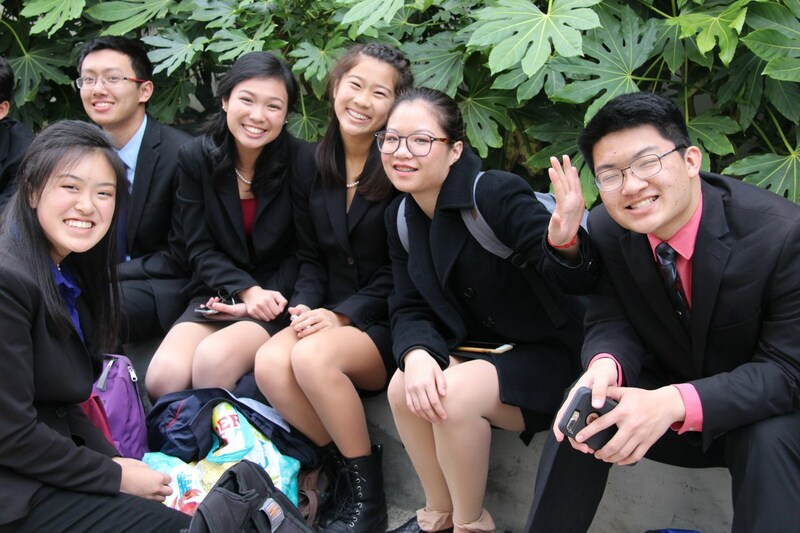 With two interpretation events and two debate events, students were able to obtain a sense of all aspects related to Speech and Debate. Overall, the Icebreaker allowed students to simply have fun before the rush of league and other higher level meets. With 24 awards handed out to semi-finalists and finalists, the tournament concluded early at 2pm with all participants content and proud. “This experience made me wish I was in Speech for real,” confessed senior Anna Sam. "The Best, The Greatest, THE TOP TROPHY"
People’s perceptions of winning are interesting. If a team loses, there is analysis of the “why”. If a team wins, the analysis is replaced by elation. If a team wins a lot, people lose interest. If someone or some team wins all the time, it can’t be that difficult. Ho hum, what else can you do? 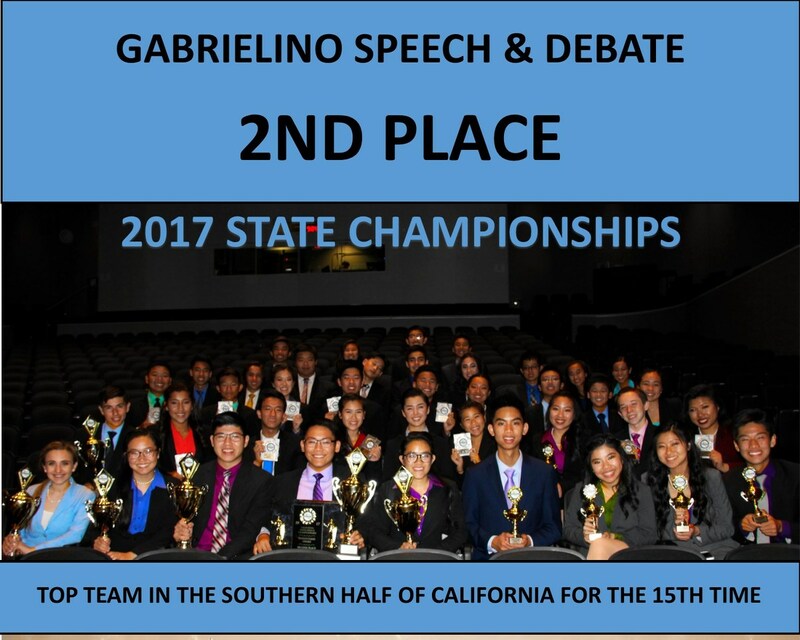 Speech and Debate success has become so commonplace at Gabrielino that the school yearbook completely forgot to include the team in this year’s edition. How can a society allow consistent excellence to become commonplace? If you have a savings account paying you five times as much as any other savings account, wouldn’t you want that to continue? I know I’ve been making a lot of money in my bank account, I wish the bank would give me less. Do you wish your car would break down if it gets you around consistently year in, year out? After all, a well-tuned engine over the long time is boring, right? Well, here is something new and exciting - like a brand new Ferrari with all the fixins’ to get around town: the only major speech award the Screamin’ Eagles have not won in their brief 23 year history…just got checked off. For the past 87 years, the school with the most number of accumulated rounds in the main events at Nationals has been awarded. 86 schools called in 86 years. This June was year number 87 and award number 87 was Gabrielino High School. It is called The Bruno E. Jacob Award. It is named after the founder and the Director of the National Speech & Debate Association (NSDA, formerly known as the National Forensic League) for more than forty years. The NSDA describes the award as, “the best, the greatest, THE-TOP trophy at the National Tournament...it is awarded in Bruno E. Jacob’s honor, to the school who has earned the greatest number of cumulative rounds in main events at the National Tournament”. A team official was alerted personally by a phone call coming from NSDA Director Scott Wunn just a few hours before The Awards Ceremony. He said, “The students need to be dressed in full competition attire for Awards tonight. They will have VIP seating at the very front of the auditorium. You’re getting The Big One”. The Screamin’ Eagles Coaching Staff was briefed on the honor prior to leaving the hotel for the ceremony. The entire team was kept in the dark until they were summoned onto the stage to receive the most special of awards. A few of the Screamin’ Eagles knew the team was in contention for the award, GHS was in second place after last year’s tournament, but most were completely unaware. 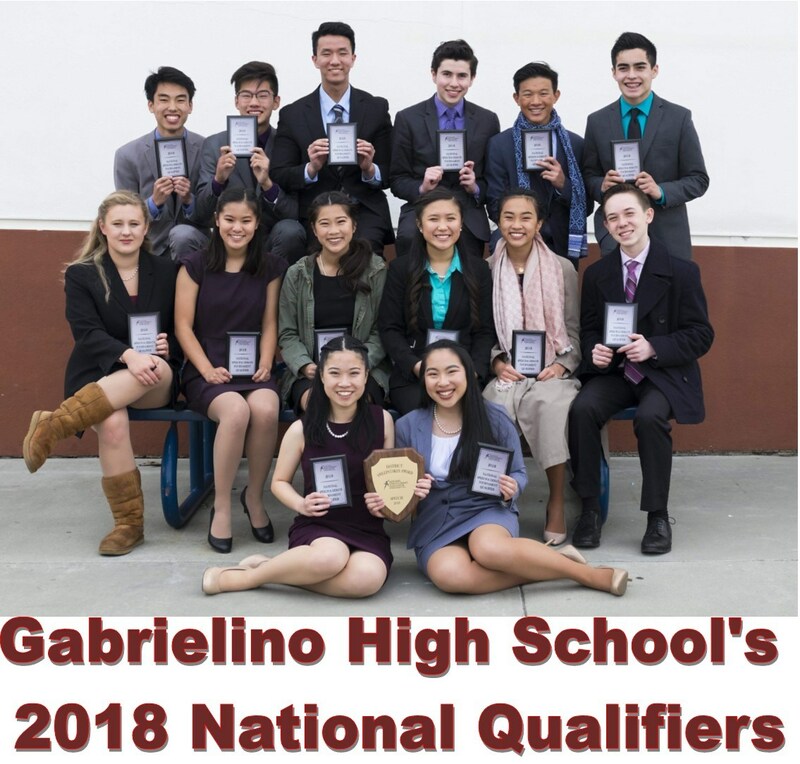 After qualifying almost 250 students to the National Championships over the past 21 years, Gabrielino became only the sixth school in California to win the award. It had been since 1978 that the only other Southern California School won it. Over the years, The Screamin’ Eagles have fared exceptionally well at the National Tournament. Each event at Nationals has over 200 competitors. Thousands more compete at over 100 local tournaments across America, its territories, Taiwan, Saipan, China and South Korea to earn one of the few spots allotted to each district. GHS places an astounding 68% of its qualifiers in the top 60 in America. 37 students, or 15%, have made the National Semi-Finals. A student qualifying for Nationals from Gabrielino has a 1 in 14 chance to be in the National Finals. 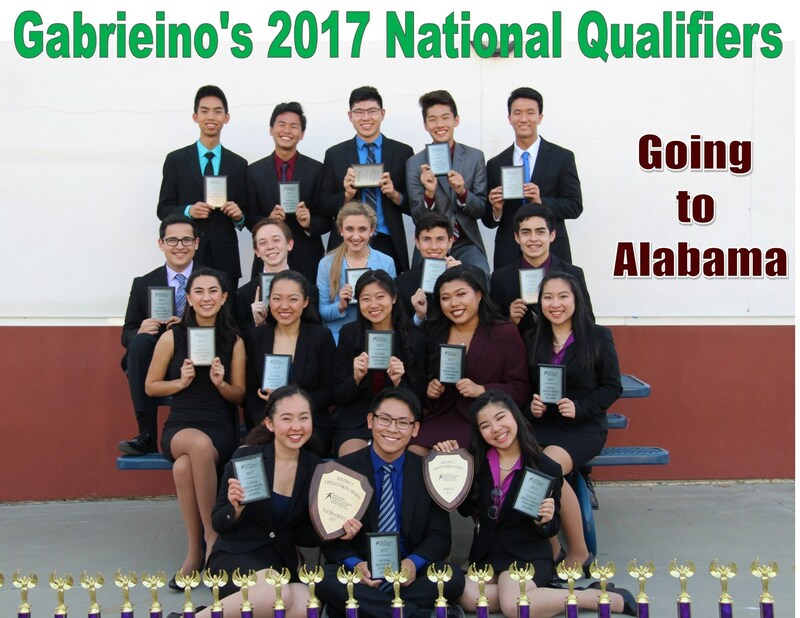 This year, like the past five (and 6 of the past 7), Gabrielino has been represented in one of the final rounds at Nationals. The 5 kids who qualified for the 1998 Nationals in Phoenix all the way to the 20 that qualified for the Birmingham Nationals this year. The students who practiced outside a small portable classroom on what was once an elementary school campus for the first nine years of the program. All the alumni who constantly donate time, money, and resources to the team in order to keep the program operating at the highest level. All the coaches who have given countless hours of their time, working for little or no money, to give back to the activity, which provided them with so many valuable skills, incredible experiences, and wonderful memories. Everyone has contributed and should rejoice in the honor. The four different principals who led Gabrielino since the opening of the school in 1994 are also part of this award. GHS’s first principal, Dan Mooney, gave the team a personal loan for the first ever trip to Nationals. The late principal, Gene Murphy, was in a constant search for the script that would “win Nationals” and was exceptionally proud when his school sent students to the 2001 Nationals held at his alma mater, The University of Oklahoma. Principal Dave Crist made almost daily trips to the speech room to check in on their progress and try to convince the team he should still be considered part of the “novice” team. Current principal, Sharron Heinrich, started the speech team in ’94 while she was the Director of the Social Studies Department. This award is a tip of the hat to all the parents who have gotten up early to drive their children to tournaments or picked them up in the early morning hours from overnight competitions because the team doesn’t have enough money to afford an extra night of hotel and bus expenses. The family members and friends who have given up their weekends to judge round after round. The parents like Carol Nakatsui, who started the Screamin’ Eagles Parent Booster Organization at the turn of the century, and Georgia Singleton, who has served with never ending energy and enthusiasm as the SEPBO President for most of the past decade. They all contributed. Gabrielino’s custodial staff is constantly raving about their Speech Team and they are the ones who, often times, have to clean the squad room more than once a day due to the number of students and room hosts and the hours it is in operation. The support staff at Gab is having to keep track of the speech bank account, which spends more than any other activity on campus, athletic or academic. They must write the students out of class for tournaments and keep track of the calendar and public relations for the team. We received this award because of so many people working exceptionally hard for the past 24 years. Anyone listening carefully to any awards ceremony knows speech and debate, like so many things in life, favor those students in high socio-economic brackets. The Gabrielino campus has a majority of students on free and reduced lunches. The Screamin’ Eagles do not have the money or means to attend summer camps or travel all around America to compete. One competitor from Minnesota commented to a Screamin’ Eagle team member, “You look familiar. Did you compete at the Harvard Tournament? The Yale Tournament? The Glenbrooks (Illinois)? Catholic National Tournament (Kentucky)? The Tournament of Champions (Missouri)?” The response to all the above was a simple, “no”. 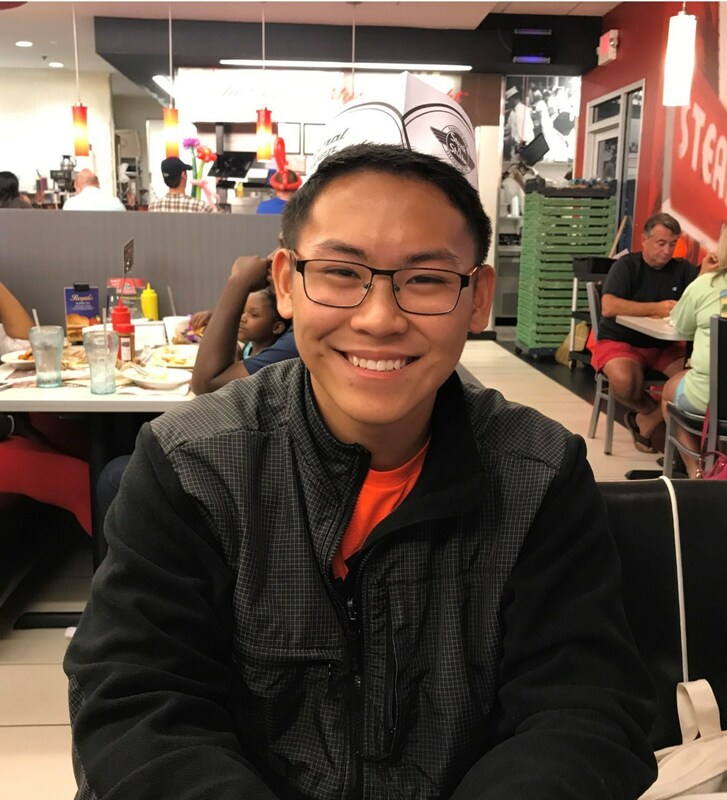 Senior Co-Captain and National Finalist this year, Tim Chung, commented, “The other speakers in the final round [of International Extemp] all knew each other because they compete against each other at tournaments around the country. I [like prior Screamin’ Eagle Finalists] was the outsider”. It’s also interesting to note Tim came to America in 2003. Even though English is not his primary language, he placed 5th in the entire country out of thousands of students. This makes a special award even more meaningful. 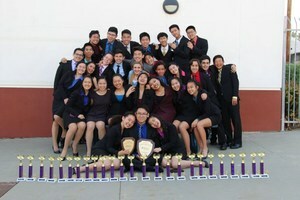 GHS Speech & Debate excels in spite of the odds. Jenny Vuong, in 2013, won the State Championship in April, became a U.S. Citizen in May and in June, won the National Championship in a language she had only been speaking for a few years. Yeah, this is boring stuff huh? The coaches, the administrators, the parents, the support staffers have all contributed. The students have overcome incredible obstacles and challenges to become champions. Yeah, they’ve been one of the top programs in all of America and the top program in the entire southern half of California for the better part of this century. Yeah, that may be boring, but The Bruno E. Jacob Award is something brand new, something that comes along once in a life time (if it comes at all) and is absolutely an amazing award in which everyone can share in the pride, joy, and honor that comes along with it. After an incredible year that saw the team win their 20th league championship in a row, place second at the State Championships for the third straight year, be named a School of Excellence at the National Championships for the 10th year in a row and win the top award presented by the National Speech & Debate Association, the Screamin’ Eagles finally ended their year at the annual awards banquet. Way back in 2001, then senior co-captain, Messiah Nakatsui, proclaimed, “you don’t really graduate from Gabrielino until the banquet”. Once again, this year’s banquet was the culmination of a great year for all the team members and a celebration of all the class of 2017’s accomplishments while they were competitors on the Screamin’ Eagles. All qualifiers to the State and National Championships were presented with certificates by Assistant Coaches Brando and Samira. The seniors in attendance were each given fun yet meaningful gifts. Assistant Coach, Water, explained the history of the varsity letter and then presented them to the members of the team who competed in a vast majority of tournaments and qualified for at least one varsity final round over the course of this year. Senior Alexandra Singleton, who qualified to State and Nationals each of her years in high school and is the team’s all-time point leader, was named the 2017 Dave “Psycho” Nguyen Award winner. The plaque was named after the 2000 graduate who had a legendary work ethic and was the original winner of the award. Alexandra’s mom, Georgia, was honored for serving as President of the Parent Booster Organization for the most part of the past decade. All members of the Executive Board of the Boosters were presented with gifts from the team captains. 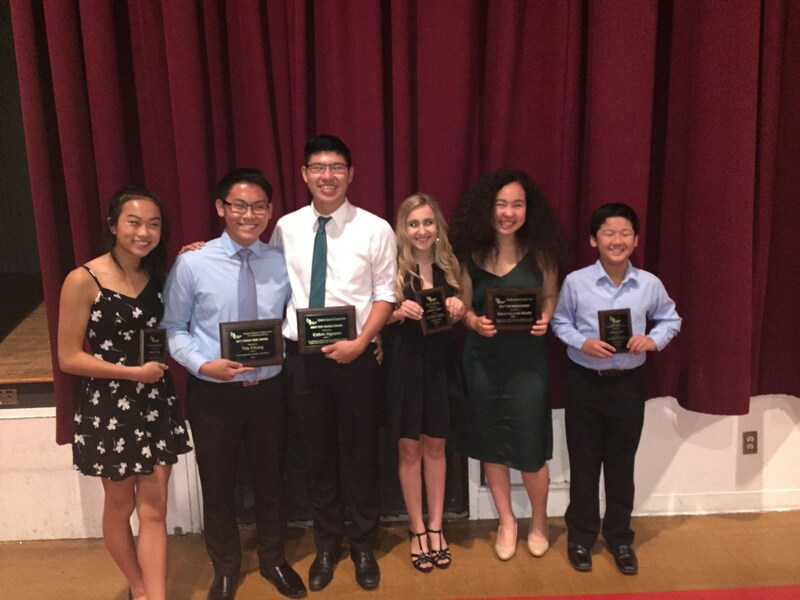 Other award winners were freshman phenom Felicia honored as Rookie of the Year and senior team co-captain, State Champion and National Finalist, Tim Chung, who won the Eagle First Award for excellence in speech competition. 30 members of the team were acknowledged for being nominated to receive the Top Eagle Award for being positive role models to the rest of the team. 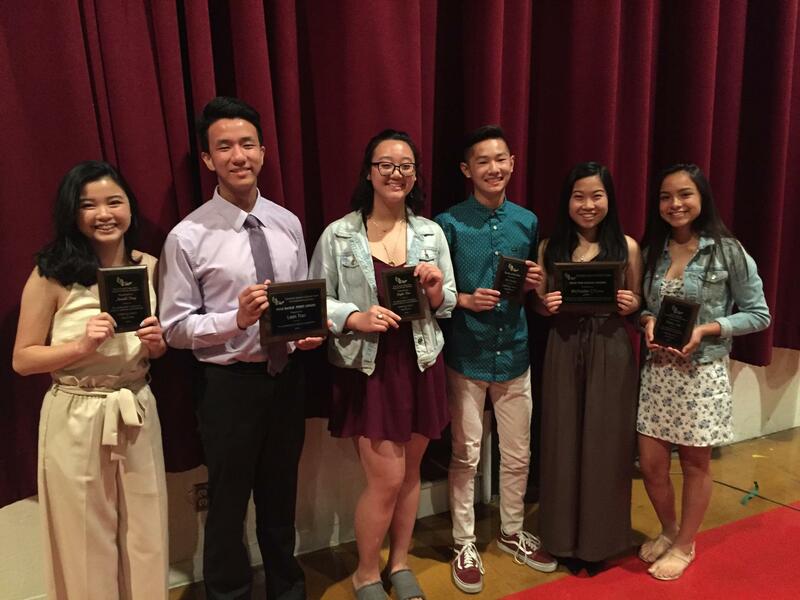 Seniors Maya K-Martin and Calvin Nguyen were the winners of the award. The night included a great meal catered by DiPilla’s Italian Restaurant and an amazing video tribute to speech put together by senior Hannah and freshman Brendan. The emotional peak for the evening, as it is every year, was the presentation of the Rode Panginda Award for freshmen. Rode lost her life at the end of her freshman year. Because of wonderful donations by her family and the Screamin’ Eagles Nation, an award in her honor is presented each year along with a scholarship to attend an overnight tournament the following year to the freshman who embodies all the vibrant energy and incredible attitude Rode brought to the speech room each and every day. Long time Gabrielino Assistant Coach, Water, presented freshman Samuel Adi with the high honor. This year marked the tenth year that has passed since the terrible event occurred on July 5th, 2007. It is certainly worth noting that each and every one of the freshman who have earned the Rode Award has qualified for the National Championships at least once during their time on the team. Original winner, Matt Basa, qualified twice and made it to the quarterfinals of Duo in 2011. The 2009 winner, Kyle DeCamp, made it three times to the top tournament in America. Hubert Tran was presented the award after he returned from the 2010 National Championship. He would also qualify in Extemp two more times. 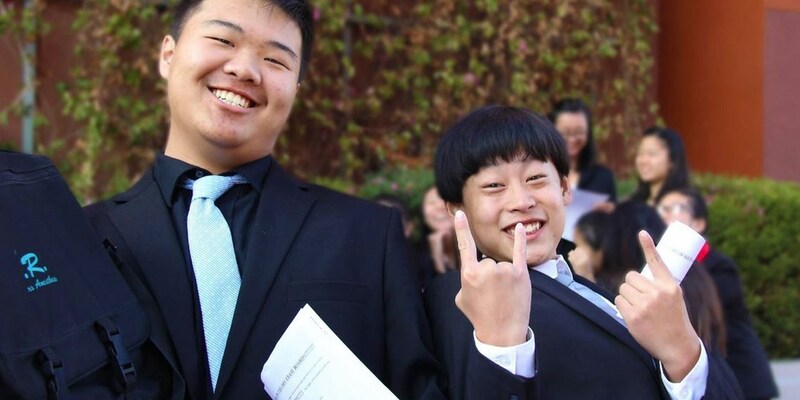 2011 and 2012 honorees, Garrett Chan and Jason Wong, had to wait until their senior year to make it to Nationals. In 2013, The Villalobos Twins were named the Rode Award Winners. They proceeded to qualify for Nationals four times where they advanced to the quarter finals, each year, the semis three times, the final round twice and were the 2016 National Champions in Duo. 2014 co-winners Alexandra Singleton and Claudia Yu have six trips to Nationals combined. 2015 winner, Wesley, has already qualified twice and 2016 winner, Gabe, was a member of this year’s team that just returned from the Championships in Birmingham, Alabama. The team also honored the life of Bo Feng who passed away in an accident in 2011. Because of a very generous donation from Bo’s family, the team has been able to greatly subsidize the costs for each student who has qualified for the National Tournament for the past 5 years. Congratulations Screamin’ Eagles on another wonderful year of learning and success. We celebrate the award winners, cherish the memories made at the tournaments this year, and honor the past, present, and future of this team. There is something about revisiting a destination that makes it feel more normal. For the 20 Screamin’ Eagles Speakers, their trip to Nationals this year in Birmingham will be completely new, but for some of the coaches taking the students, it will be their third trip to the placed dubbed, “The Magic City”, in the past 9 years. Before looking forward, we need to look at the past. The team attending the first Birmingham Nationals consisted of two sophomores, three juniors and nine seniors from the legendary class of 2009. The tournament was primarily held in the Southeastern corner of the city; however, student congress, registration and the Final Rounds/Awards Ceremony were held at the Convention Center on the North side; a nice 45 minute drive away from the other competition venues. Southern hospitality treated the Screamin’ Eagles well. 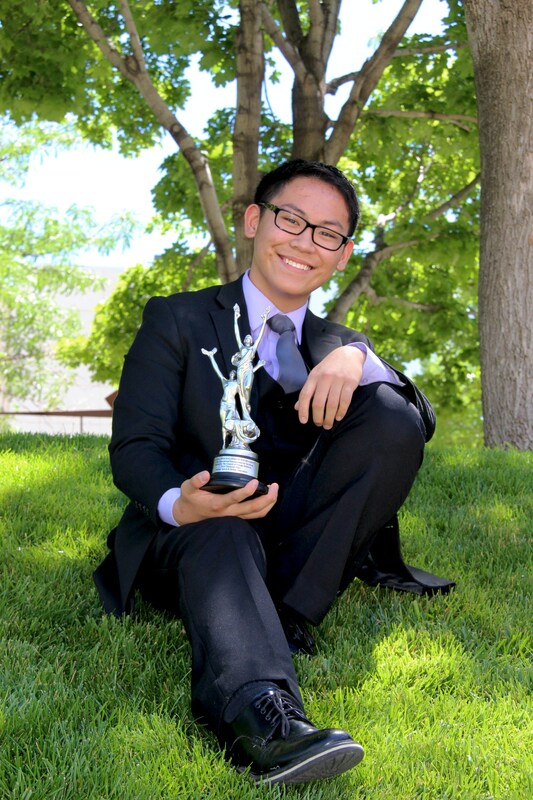 The team broke 10 of their 14 qualifiers to Octofinals, five to Quarterfinals, Tina followed up her 5th place in Oratory at the 2008 Vegas Nationals by placing 10th in the same event and a little sophomore by the name of Kevin Ye placed 16th in U.S. Extemp. The team placed 5th overall in all of America and won the School of Excellence Award for the 3rd time. Birmingham Nationals 2.0 featured 9 Screamin’ Eagles. This time the tournament was primarily hosted in the Southwest region of Birmingham in the town of Hoover. Sadly, the registration and awards were half over a half hour away in downtown Birmingham. Blok was honored for making it to Nationals each of his 4 years in high school. 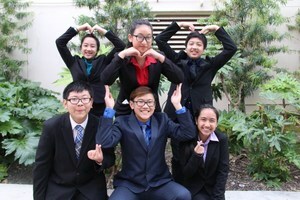 The team broke seven students into Octo-Finals and five into Quarters. 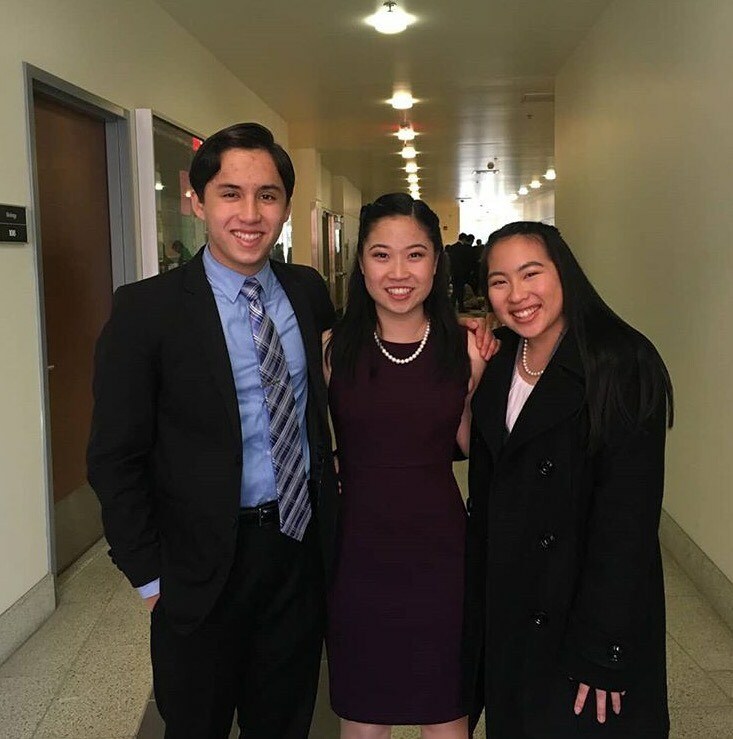 The Twins were in the Duo Semis as Freshmen and Senior Jenny “Hello Kitty” was the belle of the ball when she won the hearts of her audience members and was crowned National Champion with her impassioned Original Oratory. The team finished 13th overall (4th in the speech category) in America and won the School of Excellence Award for the 6th year in a row (7th time overall). Speakers often use analogies to best describe and relate various idea and situations to their audience. Many times, the stories are fictitious. The best way to describe The Screamin’ Eagles 2017 National Tournament is to detail the very real flight from Dallas to El Paso. After changing planes in the home of America’s favorite professional football team, The Screamin’ Eagles boarded a flight headed to LAX with a brief stopover in El Paso. Before takeoff the pilot told the capacity crowd on the plane the trip looked like it would be very smooth. Turbulence forecast apps on the phone echoed the sentiment. One hour after takeoff, the intercom came to life warning the decent and landing might be a little bumpy due to winds and thunderstorm in the area. Now the cost of a flight from Dallas to El Paso is over $100. It is around the same price as a Park Hopper Ticket to Disneyland. The last 30 minutes of the flight gave the passengers as many thrills as a full day at any of the greatest theme parks in the country. After circling twice waiting for the storm to pass and being tossed around in the sky, the plane leveled out and began the final approach to El Paso International Airport. As the altitude decreased, the turbulence and anxiety increased. As the plane was just over the runway and swaying heavily, not 50 feet off the ground, the engines came back to life. The aircraft accelerated and quickly gained altitude. It was just too windy and dangerous to land. Luckily there are not as many planes in the far corner of Texas as there are at airports in the Los Angeles area. After 10 minutes of being tossed around by the wind, the plane was back on approach again. The second time offered a slightly different path and angle to land and was ultimately successful. The flight was really tense but nothing majorly bad happened. It was the epitome of the entire trip. Nationals looked great on paper and in preparation. Because of a last minute drop from another school, Gabrielino was able to have an additional student compete in the tournament. The six different competition venues where the team would compete were on the North side of the city and thus closer in proximity relative to the past trips to Alabama. Weather forecasts called for rain which meant it might not be as hot as past years and could offer the kids from Southern California a chance to see actual rain for the first time in a couple months. 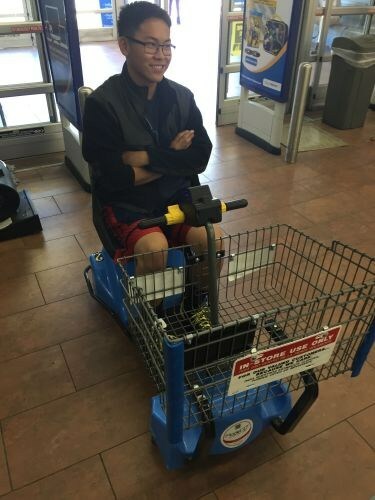 Senior Co-Captain Tim Chung’s ankle was healed enough so he would not need to lug crutches around with him across the country. Heck, when the team got on the plane at LAX, they quickly noticed former Dallas Cowboy Head Coach (and current defensive coordinator for the Rams), Wade Phillips, was on the same plane. Indeed, everything seemed in place for a good 10 days. And then the trip started. The flight from Houston to Birmingham was delayed almost two hours. It took 90 minutes to get the rental vans from the airport. Two of those vehicles had engine warning lights go on and/or tires lose pressure. Four students were sick and/or losing their voices. There were several technology and communication issues with the National Organization involving uploading and turning in the transcripts of the speeches performed by the team members. 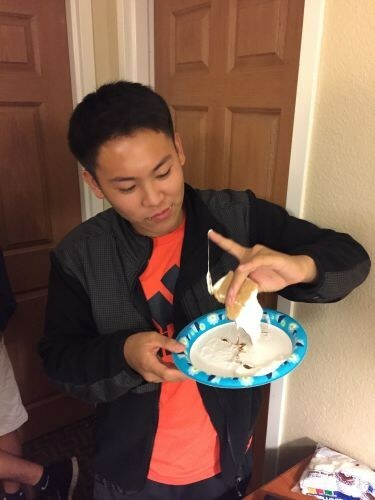 Almost every one of the student hotel rooms had its fire alarm set off because of students choosing to practice on becoming America’s Next Top Chef instead of Top Speaker. One student lost her wallet and ID less than 24 hours before the team was to go through TSA security at the Birmingham Airport. It was a turbulent trip. At some point during the travel to Birmingham, one of the coaches pointed out the possibility of a hurricane hitting Alabama during The Championships. No big deal. The Dallas 15 Nationals included Hurricane Bill coming through the metroplex with a lot of rain and not much else. This year’s weather challenge, Tropical Storm Cindy, never matured to a hurricane but did spawn several tornados. When senior co-captain Tim Chung returned from the sound check for finals, the California kids were in for some good ol’ fashioned southern storms. The team endured four different tornado warning sirens throughout the afternoon and soon learned one twister hit just a few miles from their hotel where they spent a few hours in the hallway of the bottom floor. 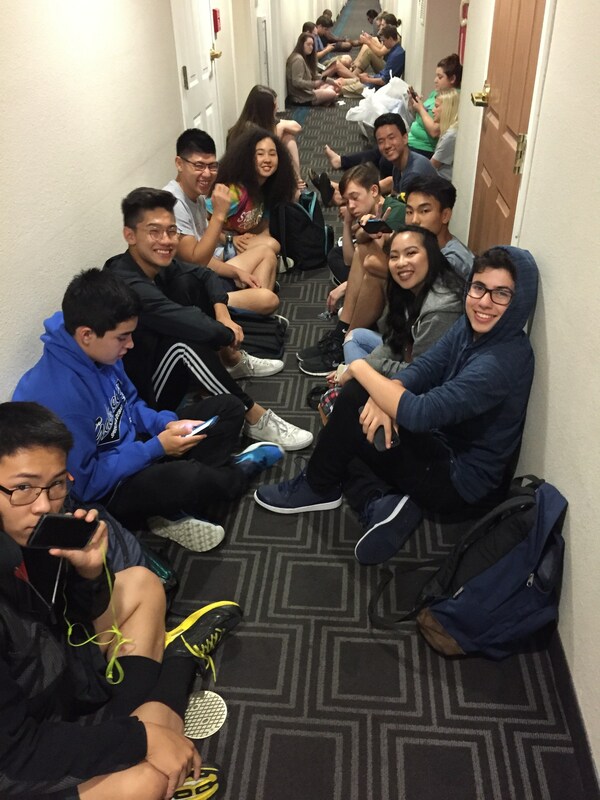 Being the steadfast competitors they are, the teammates sat patiently in the hallway, playing games with each other as they waited for the dangerous weather to pass and hoping the damage to their hotel would be minimal. Turbulence aside, the students performed at their normal high level of excellence. 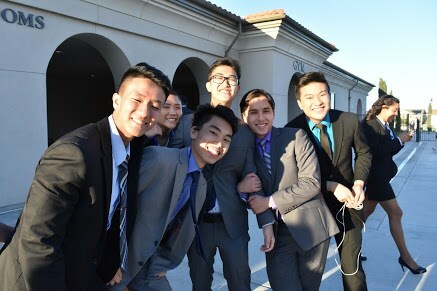 After advancing nine team members to Octofinals, six to quarters and watching Tim qualify for the Semi Finals and then Finals, the team, for the 10th straight year (11th overall), was awarded the National School of Excellence Award by placing 7th overall and 4th in the speech category out of over 2000 member schools. Regardless of it being was the first time for the students or the third trip for the coaches, not much about this trip felt normal. The 2017 National Championships will be remembered as the tornadic turbulence tournament. Unfortunately, that analogy was based entirely on fact. Birmingham might not have lived up to its nickname of “The Magic City”. The charm of the third time to the city provided a lot of trophies and success to go along with the turbulence and stress. Yet, everyone survived and The Screamin’ Eagles again, bumpy trip or not, excelled in their performances. Way to go Screamin’ Eagles. Congrats!!!! When Tim first joined The Screamin’ Eagles four years ago, the team voted him Rookie of the Year. He followed up an impressive freshman year with three trips to the State and National Championships. The 2015 Nationals in Dallas proved too much for him. He went to the tournament prepared to compete in International Extemp but let the magnitude of the moment get the best of him. Half of high school is mentally fortitude and Tim was too green for the situation. He qualified for the 2016 Nationals in Salt Lake City and met the challenge of competing against the best in America head on. He advanced out to the field of over 200 qualifiers in International Extemp all the way to the Semi-Finals, placing 13th, and thus, was automatically invited to return this year in the same event. Five days before boarding a plane to Birmingham, Tim severely sprained his ankle playing basketball. He spent the week leading up to the tournament in bed icing and elevating his black and blue lower leg. Tim limped into LAX with a walking boot and quickly found a wheel chair to help get him to his gate. If the Screamin’ Eagles were a football team from USC or UCLA, or if his uniform wasn’t a suit and tie but instead a purple and gold jersey with Lakers on it, ESPN would have had a camera crew to watch Tim go through security. Talk radio, TV shows and Twitter would have been blowing up with arguments about whether the team co-captain could recover from his injury quickly enough to make an impact in the competition. The team coaches would have had to give canned answers to hundreds of questions on his readiness for the tournament. Several area doctors with no knowledge of Tim or his specific ailment would offer professional opinions on the effect ankle injuries have on performance. Luckily, Tim was able to navigate long check-in lines, TSA security and a two hour delay in the Houston airport to finally arrive at Birmingham in relative peace. On Sunday night, just hours before he was to deliver his first extemp speech in the tournament, Tim was finally able to almost walk without a defined limp. Nothing like waiting until the last minute. Sometimes the stress of only having 30 minutes to prepare a speech is exactly what is needed to get the mind off of an injury. Nothing relieves pain more than the adrenalin of competition. Tim was able to make it up and down the floors of the Birmingham Sheraton to present each of his four speeches to the judges throughout Monday’s first day of rounds. Two more preliminary rounds on Tuesday morning and two more Octo-Final rounds in the afternoon were physically easier yet competitively more difficult. 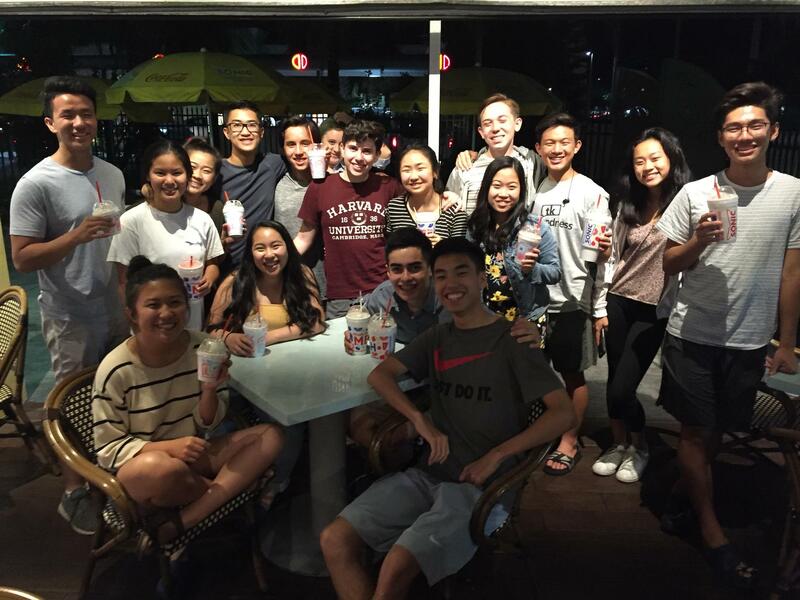 The team decided not to venture to the general posting area and instead Tim learned he made it to the Quarter-Finals while having a sweet treat at a local Sonic. Tim didn’t stick around the school for postings after completing t his 4 rounds in Quarters and Semis throughout the day on Wednesday. He was just sitting down for dinner at Steak-N-Shake when he learned he had made Finals. He put on one of the restaurant’s signature hats to celebrate being able to end his storied speech career on the big stage for the Final Round at the National Championships. Soon after Tim returned to his hotel from the sound check on Thursday morning, he would join his fellow Screamin’ Eagles in the hallway on the bottom floor waiting out, not one, but four different tornado warnings. He would quickly learn a tornado destroyed several buildings just a few miles from where he was sitting in the hallway eating popcorn popped by a nice coach from Kansas who was helping run his event at the tournament for the entire week. On Friday morning, during the ride to The Final Rounds, Tim discussed the previous night’s NBA draft results with his teammates. They discussed if De’Aaron Fox should’ve gone second to the Lakers instead of Lonzo Ball. You can’t help but wonder if Mr. Fox and Mr. Ball would discuss whether Tim should go second or fifth if they were to watch the final round of International Extemp. About the time most people were arriving for work in the downtown area, Tim was let out in front of the Birmingham Jefferson Convention Center. His limp was almost gone, the pain of his ankle had left, no doubt replaced by the exhilaration of The Finals. Flanked by his fellow teammates in Extemp, Tim walked the path that would allow him the chance to speak on the greatest stage in this activity--a stage that three other GHS extempers have graced. Heck, Tim was going to speak on the same stage that Jenny Vuong spoke on just four years ago and won the National Championship. Soon after Tim disappeared to the green room to draw his topic and prepare his speech, he sent his final text to the team, “I’m 5th speaker”. This was special. In 2011, Kevin Ye was 5th speaker in the Final Round of U.S. Extemp. 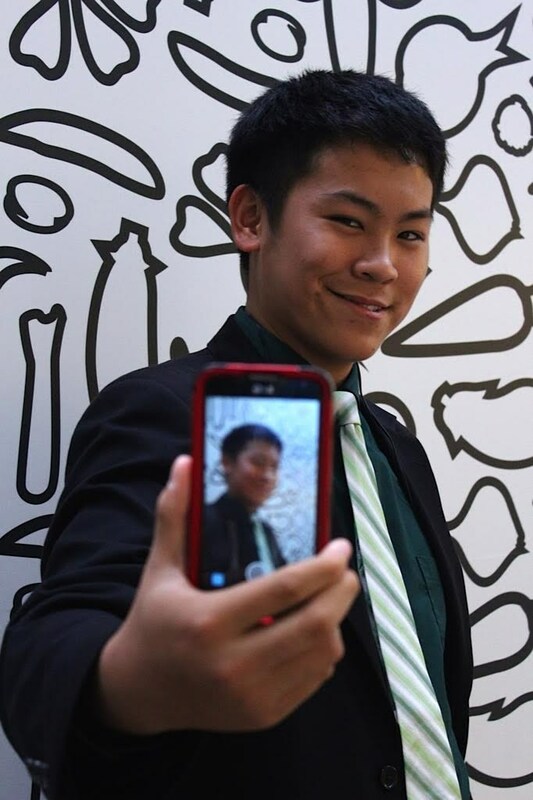 In 2015, Alex Ye was 5th speaker in the Final Round of International Extemp. Tim knew the history and understood he would soon write his own chapter in Gabrielino Screamin’ Eagle lore. 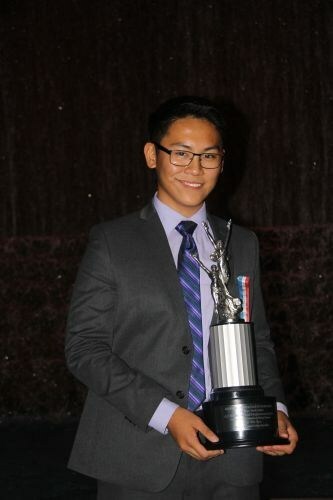 A few hours later, Tim was be called to stage to receive his trophy and be named the 5th best International Extemporaneous speaker in America. His career, one that started out promising and always got better, was finally complete. Way to go Timmy Chunga!!! 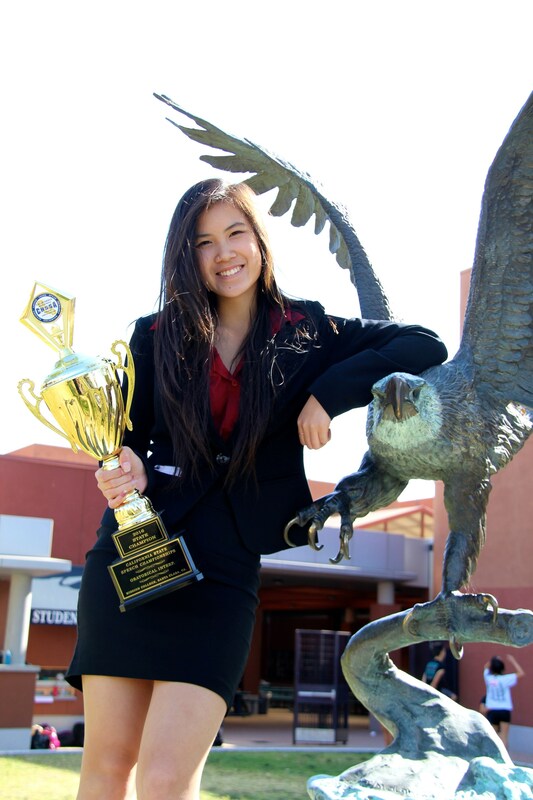 Out of the thousands of students who have been members of the Gabrielino HS Speech & Debate Team, senior Alexandra “Lex” Singleton is only the fifth student to qualify for the National Championships each of her years in high school. 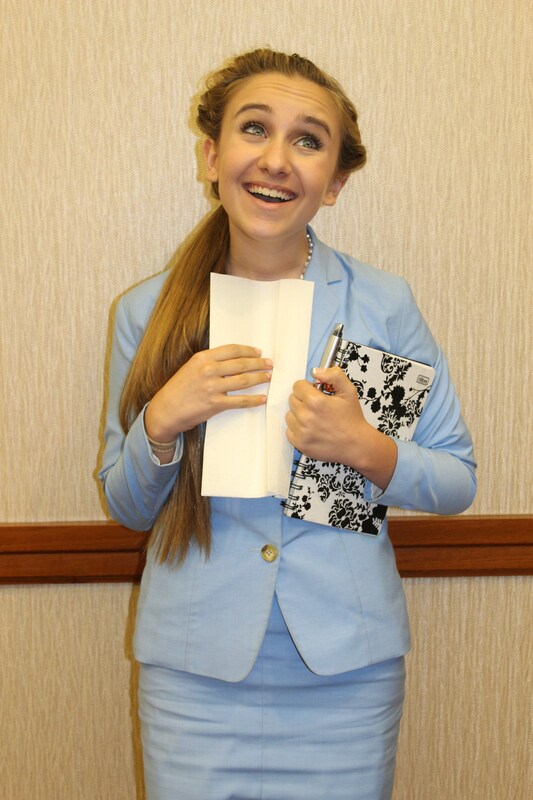 After making it to the Championships in Duo her freshman year, and qualifying for the Octo-Finals, she went as a sophomore in Humor where she advanced to the Octo-Finals again. Her junior year included another trip to the largest academic competition in America, again in Humor. She concluded her illustrious speech career by qualifying in Duo for the 2017 National Championships this past June in Birmingham, Alabama. Lex was honored on the Big Stage at the Championships for her accomplishment. Congrats Lex on an incredible career with The Screamin’ Eagles. Senior and Team Co-Captain Tim Chung goes through mic checks in preparation for his performance in the National Final Round on Friday at 9am (Los Angeles Time). For the 6th time in the past 7 years, The Screamin’ Eagles have a student in the Big Stage to compete in The Final Round of the National Speech and Debate Championships—the largest academic competition in America. Out of 1000’s of students across America, over 200 students qualify for Nationals in each event. The Final Round is reserved for the the top 6 in each category. Tim will perform in front of over 1000 people on stage at the Birmingham Jefferson Convention Center Concert Hall on Friday, June 23rd at 9am (Los Angeles Time). The awards ceremony will also be broadcast beginning at 4:30pm (Los Angeles Time) on the same site. Senior Captain Tim and the rest of the team are in preparations for the National Championships this summer in Birmingham, Alabama. After making it to the National Semi-Finals last year and winning the State Championship in International Extemp this year, Tim is excited about his potential against the best speakers in America. 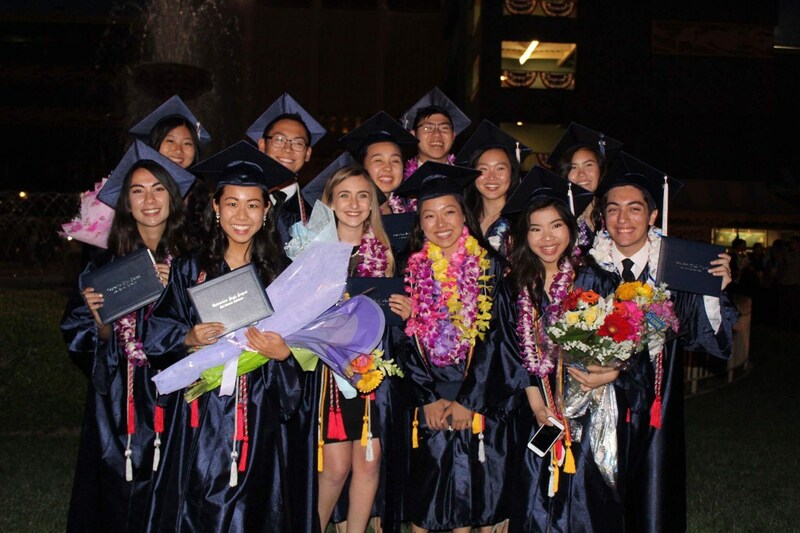 Just over a week after the 2016-17 edition of the Gabrielino school yearbook left out the speech team entirely, the Screamin’ Eagles took center stage at the graduation ceremony at the historic Santa Anita Racetrack. 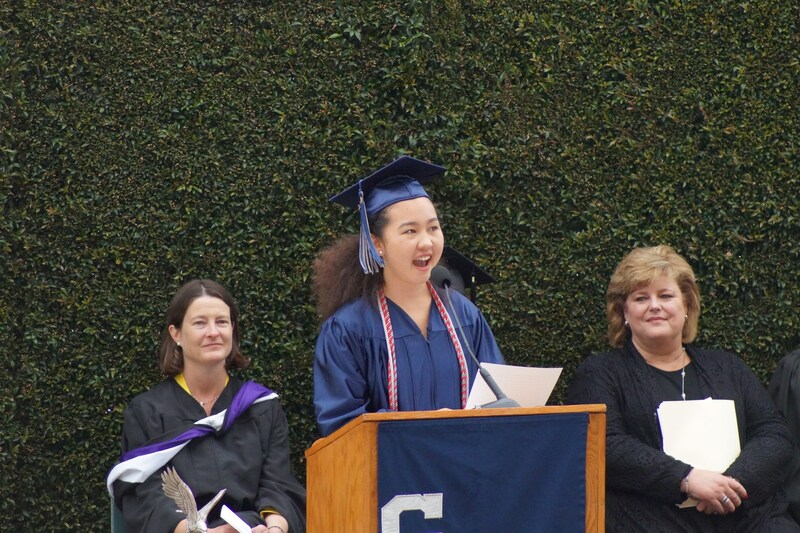 14 team members were awarded with honor cords for their successes over the year and team co-captain Maya was one of two students chosen to deliver the commencement address to her classmates. “MKM”’s message centered around the incredible environment Gabrielino has that encourages students to be inquisitive. The 2017 Screamin’ Eagles graduates will be attending, among other colleges, UC Berkeley, USC, Stanford, UC San Diego, UCLA, UC Irvine, UC Davis, UC Santa Barbara, CSU Sacramento, Grinnell and the University of Michigan. Again this year, the seniors can claim they were a part of the GHS Speech & Debate Team that never lost a league speech tournament in their entire careers at the school. They can also boast for the rest of their lives they were a part of the top program in all of Southern California for three of their four years as well as placing 2nd in the entire state the past three years. 20 of the seniors, at one point in during their speech careers, qualified for the State Championships, 14 qualified for the National Championships and 12 were named Academic All-Americans. A dozen of the seniors are a part of the team going to Nationals this summer in Alabama where they will try to be recognized for the 10th straight year as a School of Excellence and place in the top 20 in America out of almost 4000 schools . Even though the school yearbook forgot about them, the Screamin’ Eagles Class of 2017 will go down in the annals of Gabrielino Speech History as one of the greatest ever. Congratulations Screamin’ Eagles. Apply all the lessons you’ve learned and skills you’ve developed to go do great things in life. It’s hard enough to be named one of the best speakers in the country. It’s not easy to be named one of the best students in the country. To do both simultaneously seems nearly impossible. 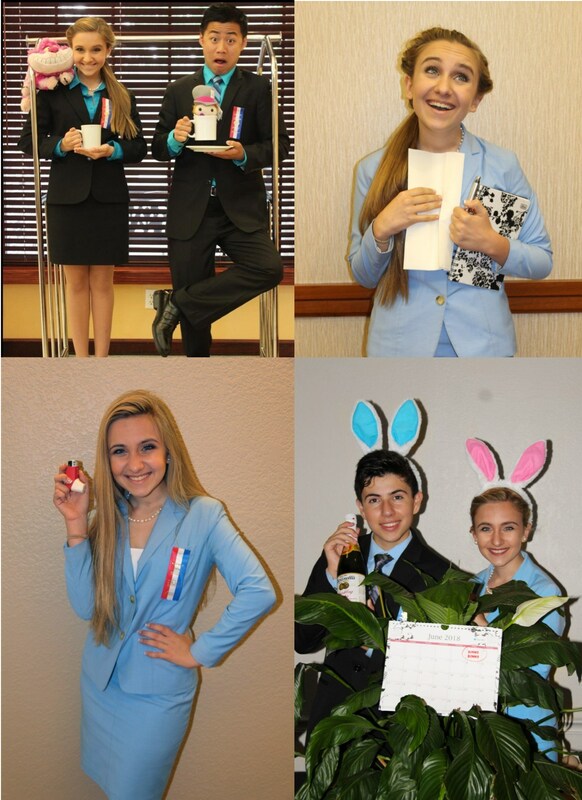 It takes years of hard work not only in the classroom but in speech & debate competitions as well. Earning a near-perfect score on the SAT and/or ACT is also necessary to be considered for the award. 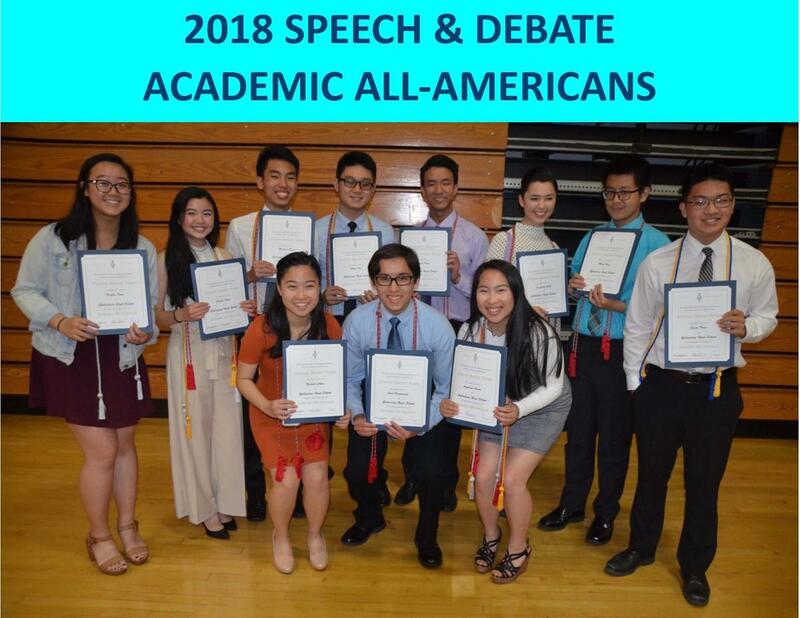 Despite the difficult requirements, a dozen seniors on the Gabrielino Speech & Debate Team were recognized this past week by the National Speech and Debate Association for the Academic All American Awards. The official statement from the team reads, “Once again, this year the Screamin’ Eagles have displayed excellence in competition and in the classroom. We are exceptionally proud of these 12 students. They have been able to take what they have learned in our program and at Gabrielino and cross-apply it to their studies and speeches. These students are great role-models for the entire student body to embellish”. Nine of the twelve students honored will be closing out their high school careers at the National Championships this summer in Birmingham, Alabama. Congratulations to our 2017 Academic All-Americans. This has been the “year of the kids” for the Screamin’ Eagles. Throughout the season, the novices on the team have excelled. 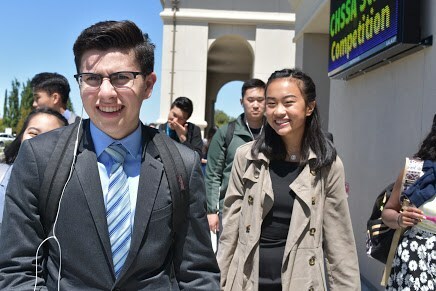 They continued their winning ways at the Southern California Debate League’s Novice Championships held over two days at Alhambra and Gabrielino High Schools. 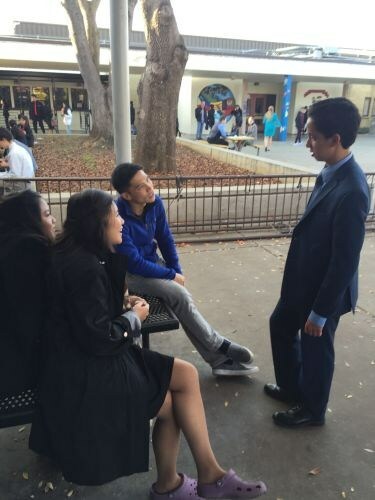 Friday was the time for the students to test their skills in the debate events at Alhambra. Many of the GHS competitors were trying out the events for the first time in their lives, yet they held their own and, after four rounds of debate, they came away with 14 trophies. 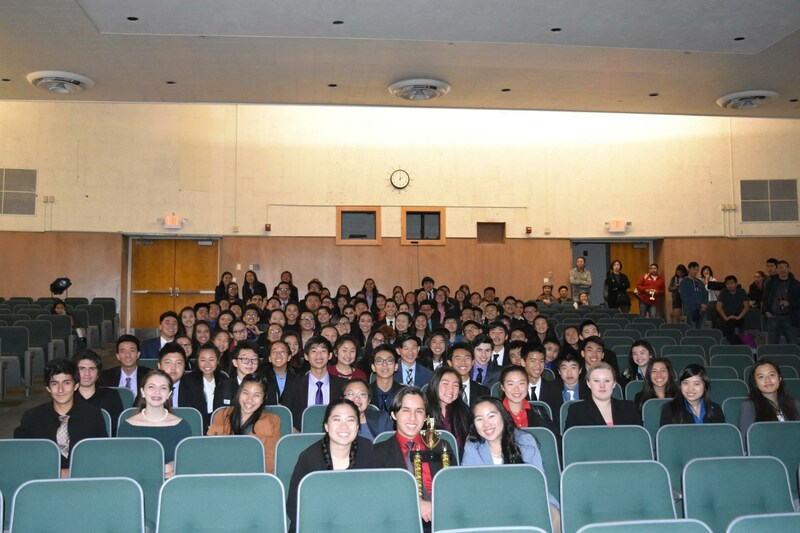 Gabrielino hosted the speech events on Saturday and almost all of the eligible students competed. Participants went through three preliminary rounds and the top seven from each of the 14 different events were selected to perform in the final round. 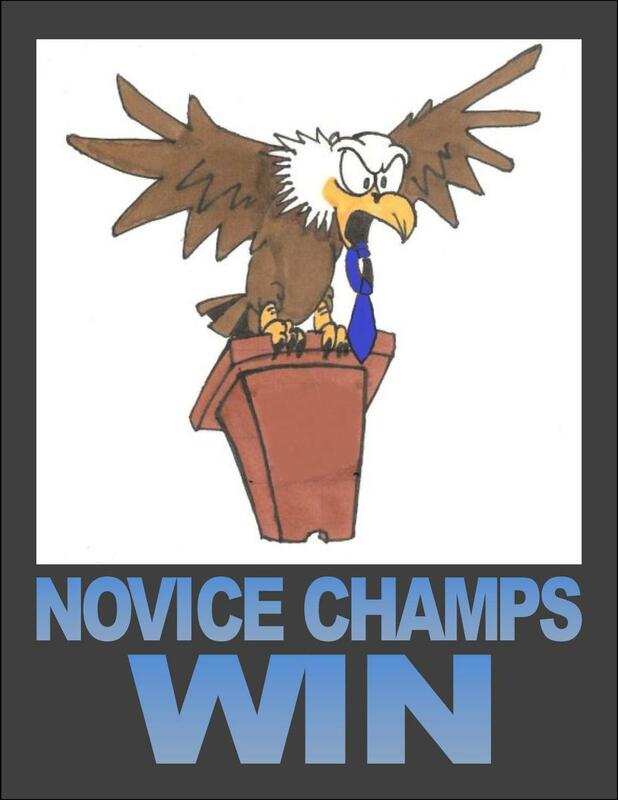 Even though six novice students were re-categorized into the varsity division because they qualified for the State and/or National Championships, the team managed to put 47 students in the final rounds, take first place in almost half the speech events and win the tournament for the 20th straight time by racking up almost 200 points. It has been an incredible year for our “kids”. Their numbers may have been depleted, but their energy, talent and performances are undoubtedly among the best in the history of the program. Way to go Screamin’ Eagles! The first six Speech Showcases at Gabrielino were held in a little cafetorium, which was originally built for an elementary school. After lunch ended on a Friday, the team would head down to the café and decorate the stage with trophies and banners. They would set up microphones on stage and folding chairs where lunch tables usually sit. With no air conditioning in the room, the 200 plus people watching would often sit in unbearable temperatures from the California heat in May. Unseasonably cold and wet weather for the 2017 Screamin’ Eagles Showcase would have been a welcomed event in the days of the old cafeteria/auditorium/hotbox. However, the elements outside were not able to dampen the performances happening on the inside of the Goodson Auditorium. 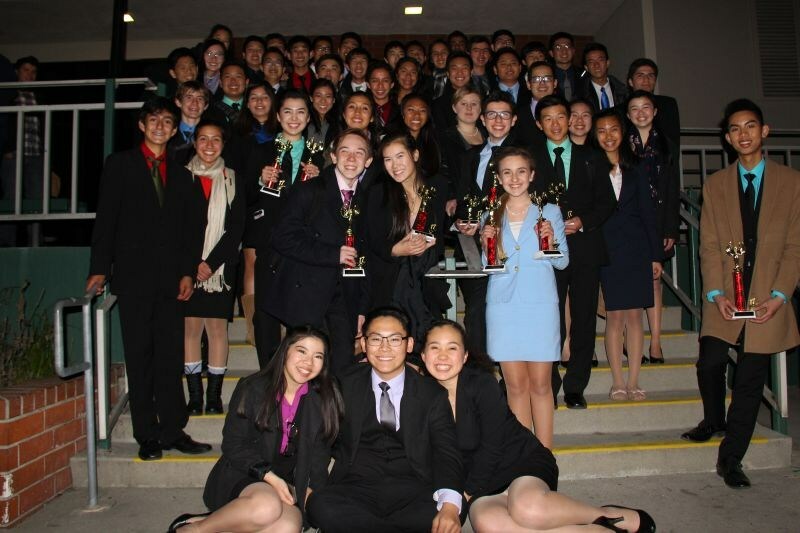 Speaking to nearly capacity crowds both nights, Gabrielino’s Speech and Debate Team put forth 16 different performances that left the crowd in awe. Friday night kicked off the Showcase weekend with an incredible performance of the Star Spangled Banner led by the outstanding senior singer, Calvin. The Captains then took the stage to sing a message of welcome set to the tune of Bohemian Rhapsody. When the curtains opened and the performances began, the audience was treated to an array of speeches: Jack and Beanstalk, building bridges, the dangers of milk, Middle East relations, conspiracy theories, school bullying, the price of happiness, and a woman with the ghost of her dead husband. Saturday night offered a completely different line-up of speakers. The performances of the second night included speeches about open mindedness when dealing with different species of dogs, how the rich get richer, and tributes to military soldiers, helping the middle class, monsters, comedy writers, the importance of quality over quantity, and how young students learned how to use brains over brawn. On Saturday, the Screamin’ Eagles Alumni were represented by Tony Law when he presented a generous donation on behalf of the alumni to the team. Both nights were capped off by a humorous and impressive speedy review interpreted by Gabrielino’s top policy debate team. The Showcase has come a long way over the past two decades from the old cafetorium to the Goodson Theater. 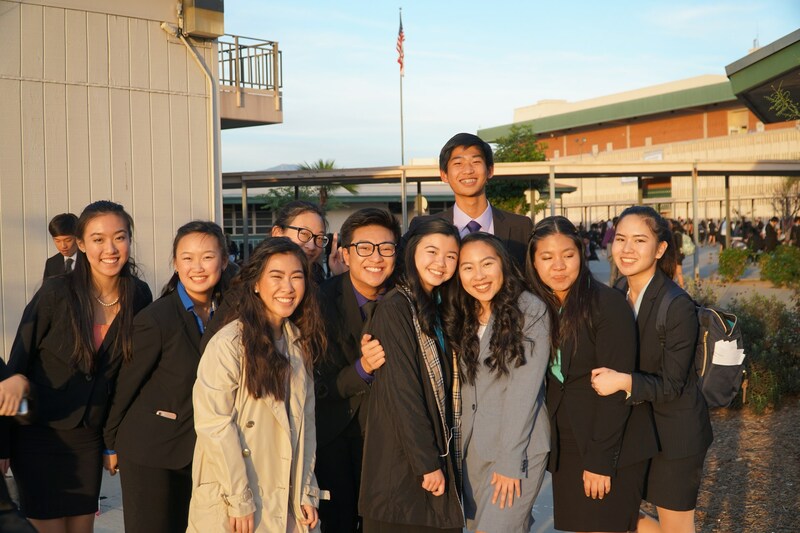 But, regardless of the venue, the speakers and performers on the Gabrielino Speech & Debate Team continue to be bright shining stars on any stage. 4-Year U.S. Extemper Sanjay won the National Merit Scholarship and will be attending Stanford University this fall. It hadn’t happened since the 1980’s. Back in a time when MTV actually played music videos and before Gabrielino was even a thought, the 1985 California High School Speech and Debate Championships were held at Alhambra High School. Since then, the San Gabriel Valley had not hosted “State”. Each of the teams the Screamin’ Eagles sent to the California Championships had the luxury of staying at a hotel during the tournament. Until this year. With Arcadia High School hosting the 2017 State tournament, Gabrielino had an opportunity to save some very valuable money and feel confident on their home turf. However, with the venue so nearby, it was a challenge to make sure the students were focused and prepared for the high level tournament. While staying at a hotel ‑ with bed checks and sleepless nights ‑ can be a burden for the coaching staff, the annual trip does allow the staff to work longer with students to ensure they are prepared for the competition. It provides the team members with opportunities to bond with each other and focus on the craft for which they have so much passion and have spent so much time. Every other year, the team leaves school on Thursday, has a team dinner that night at the hotel and sleeps in a little on Friday before leaving the hotel for the school around noon. This year, the team dinner was in the speech room at Gabrielino Thursday night and the students were sent home early to finish their homework for Friday’s classes. The students did not get to sleep in as many of them were back at school by 7am the next morning and attend their classes until finally departing for Arcadia after lunch. The California State Championships are the longest, most drawn out tournament of the year. 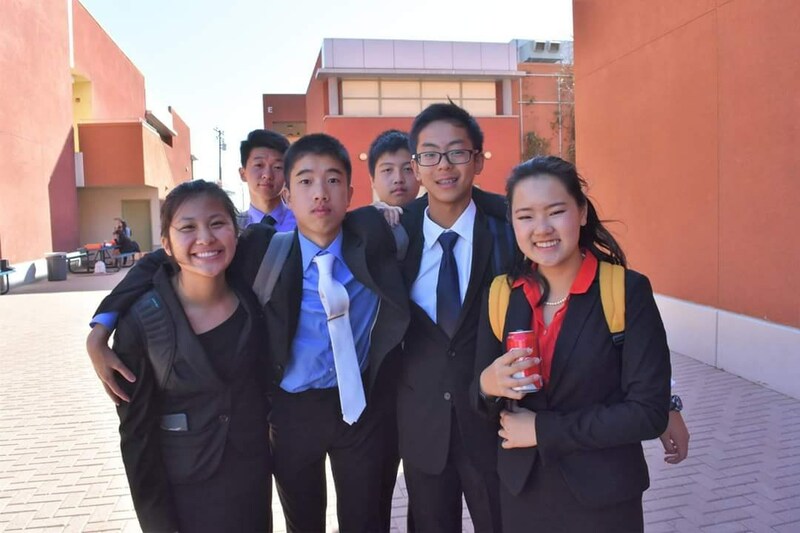 Friday, the first day of competition, only offered one round of competition for most of the team members even though they were on the Arcadia campus for eight hours. The tournament is too big to run all at once. There are three patterns of events. The GHS students who qualified in debate did get to have two rounds on the first day. After spending a night at home in their own beds, the Screamin’ Eagles came to perform their final two preliminary rounds on Saturday. The competitors qualifying for the semi-final round were announced very late Saturday night. The students were forced to celebrate “breaking to Semis” by themselves instead of in hotel rooms with their teammates. With the second most qualifiers for Semis out all all the schools at the tournament, the team was in a great position. Sunday brought extreme temperatures to the Valley. The small classrooms at Arcadia were packed and sweltering with competitors and observers. After the breaks for finals were announced, Gabrielino had more in the round than any other school in the State. The Arcadia Performing Arts Center hosted the Awards Ceremony. There the team’s 24 Semi-Finalists and 11 Finalists would be presented with their trophies and learn their places in the 60th annual tournament. 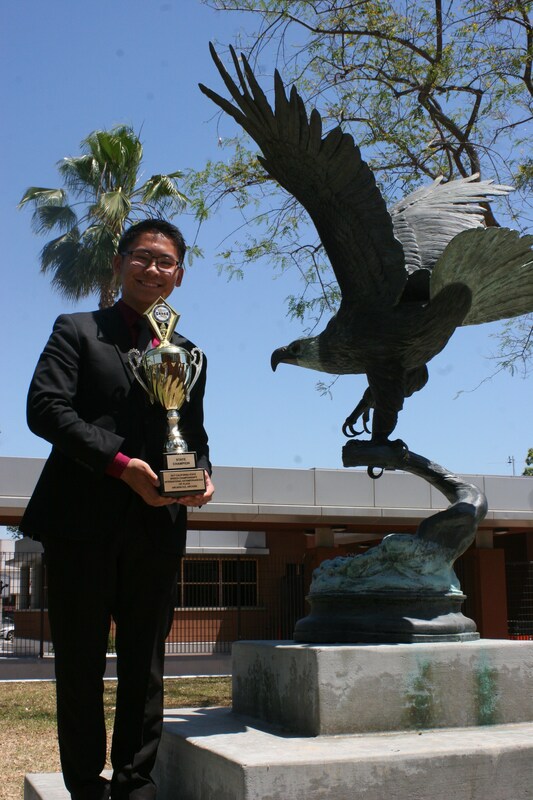 Senior Co-Captain Tim led all Screamin’ Eagles by winning the State Championship in International Extemp. Senior Calvin was the State Runner-Up in Humorous Interpretation. The team earned 68 points and placed 2nd out of the 160 plus schools that qualified for the competition. This is the third year in a row GHS has been the runner-up in the State and the 15th time in the past 17 years the team has been the top program in the entire southern half of California. It also marks the second time the team was the top public school program at the competition. The Screamin’ Eagles results and successes at the 2017 State Championships were incredible, record tying and came in spite of not having had a long bus ride or a hotel to fully prepare for the competition. Way to go Screamin’ Eagles. Senior Co-Captain Tim had a choice to make at the State Qualifying Tournament this past March at Cal. St. Long Beach. After qualifying for the State Championships in both of his speech events, Tim was forced to choose between International Extemp and Original Advocacy. 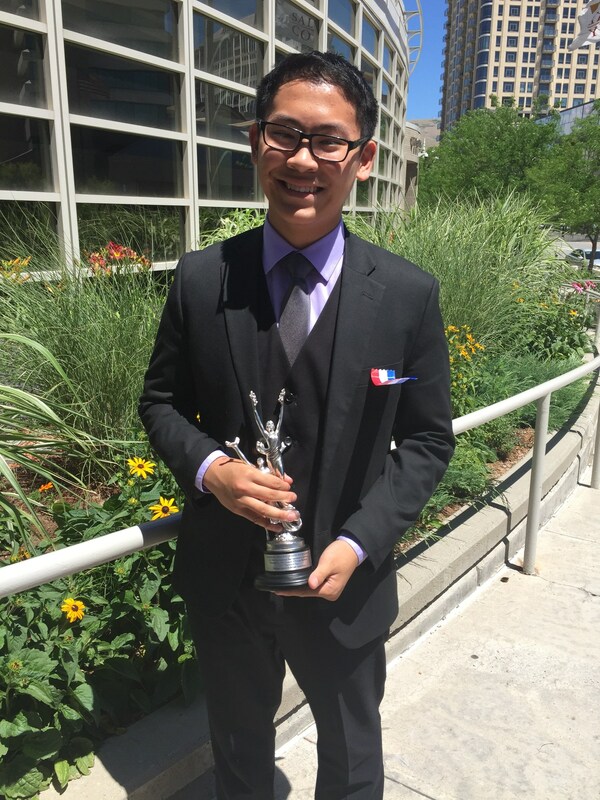 He had success throughout the year in both events and had already qualified to the National Championships in Extemp because he placed in top 14 in it last year at the 2016 Salt Lake City Nationals. Last year at State, Tim placed 5th in Advocacy while his good friend and teammate, Elysia was 4th . Both students qualified in Advocacy this year and Tim could have tried to close out State with Elysia by earning a 1-2 finish. Instead, he chose to drop his OA and try his luck with Extemp. One of the coaches commented, “he’s going to focus on one event to see what he can do at State and Nationals”. The entire state saw what Tim could do. After three rounds of competition, Tim was in fourth place going into the Semi-Finals. A decent speech put Tim in fifth place and 6 points behind the leader going into the final round. There, he gave a fantastic speech and performed remarkably during cross examination to make up ground and win the Championship. Tim commented, “it was not easy and certainly hard fought. There are so many exceptional speakers from teams throughout California. I respect them all very much. 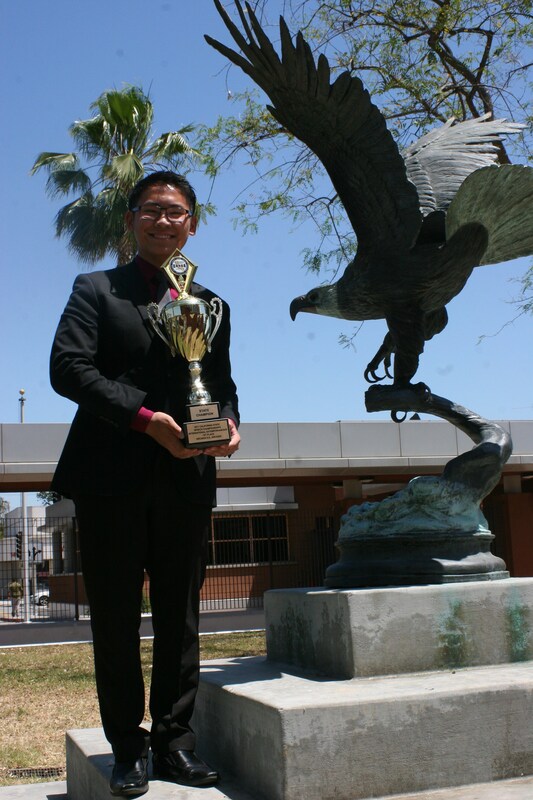 I’m proud I was able to represent Gabrielino and the Southern California Debate League in such a great manner”. 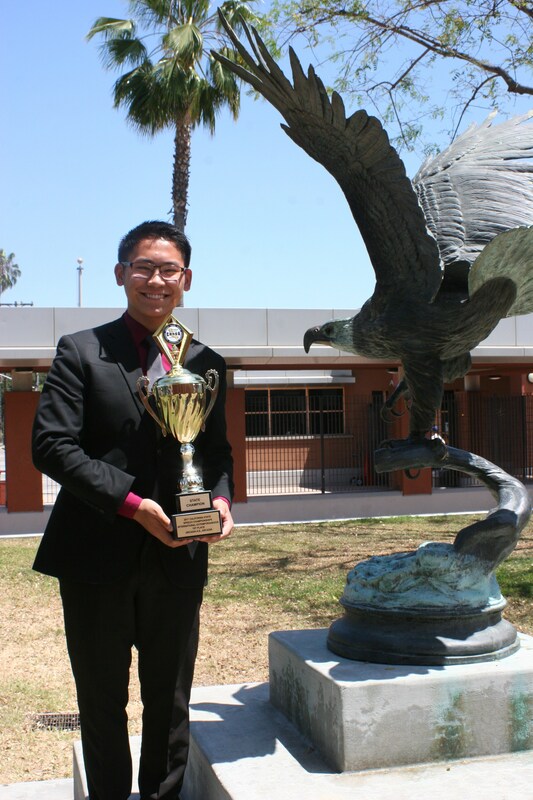 Up until this year, the highest placing Gabrielino Extemper had been Kevin Ye placing 2nd in U.S. Extemp in 2011. The best showing in International Extemp had been Alex Ye placing 3rd in 2014 and Patrick Wu placing 3rd in 2010. 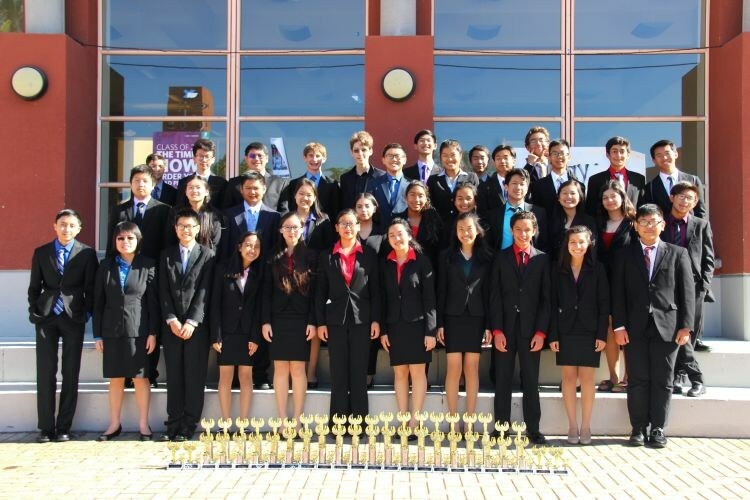 The top 56 speakers from 11 different leagues qualified in the event of International Extemp for the State Championships held at Arcadia HS during the last weekend in April. 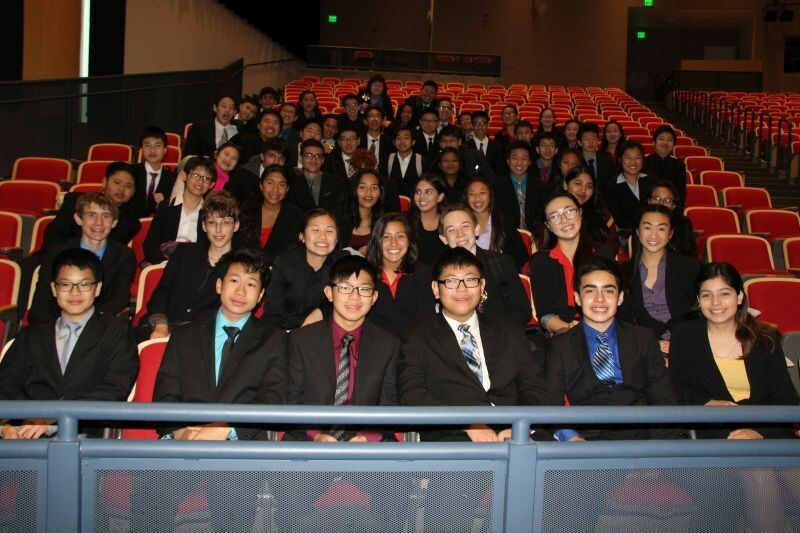 Over 300 students competed at the 11 state qualifying tournaments held across California. The entire Screamin’ Eagles Team, past and current, are proud of Tim and his record breaking performance. Way to go Tim!!! Saturday night at the State Championships was when the GHS parents made their mark on the tournament. 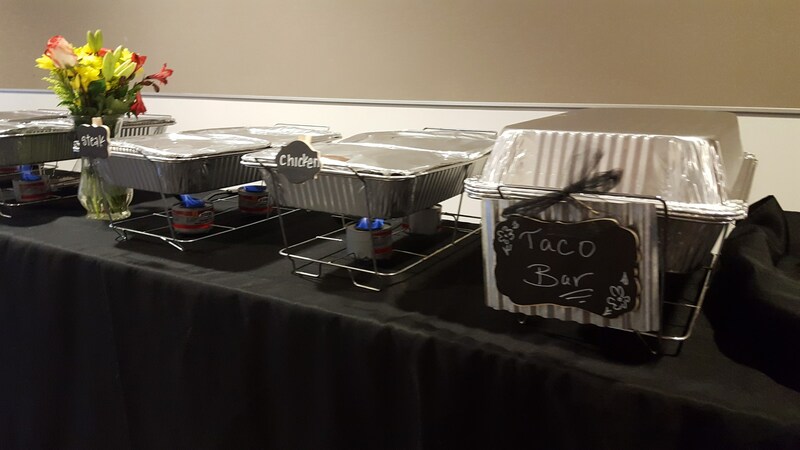 Armed with steaming sterno and warming trays, the Screamin’ Eagles Boosters delivered and served an incredible dinner to the 250 plus judges from across the state adjudicating the tournament. 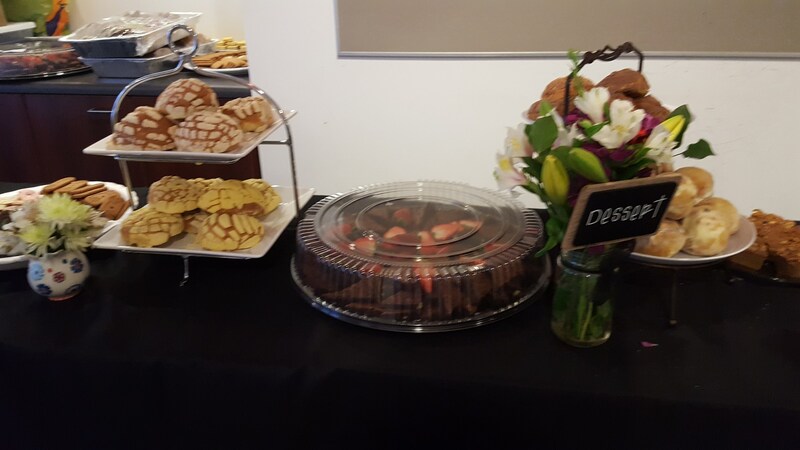 Led by Booster Vice President, Melissa Cook, the meal included handmade tortillas, chicken, steak and fajita vegetables as part of the taco bar along with fresh chips, salsa, and pan dulce sweet bread. Trader Joe’s cookies along with cookies and brownies from Dave and Busters were available as sweet treats to compliment the savory meal. 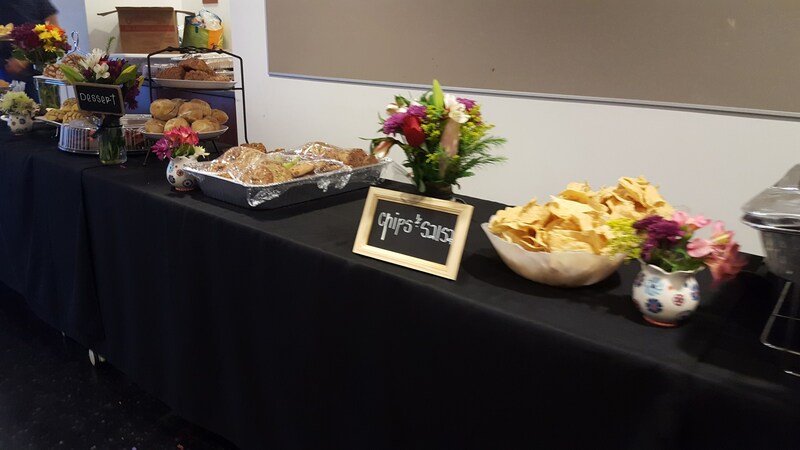 The entire spread was decorated in the same creative manner competitors are used to seeing at all tournaments at Gabrielino. Preceding the big night, the Parent Boosters solicited cash and food donations from the team’s parents and local businesses. Hundreds of dollars were collected and led to the awesome meal. 10 members of the booster organization were present at Arcadia High School to help serve the judges their final meal of the day before the final two rounds of competition for the day. 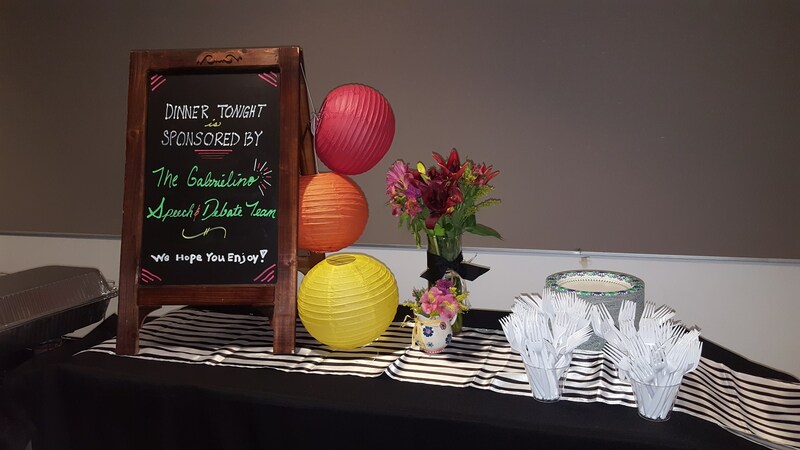 “The Gabrielino dinner provided by our Boosters at the State Championships at Arcadia HS was absolutely incredible. Coaches from around the state were very impressed. The GHS parents represented Gabrielino and our team with the same class, extra effort, grace and attention to detail our students do each weekend. 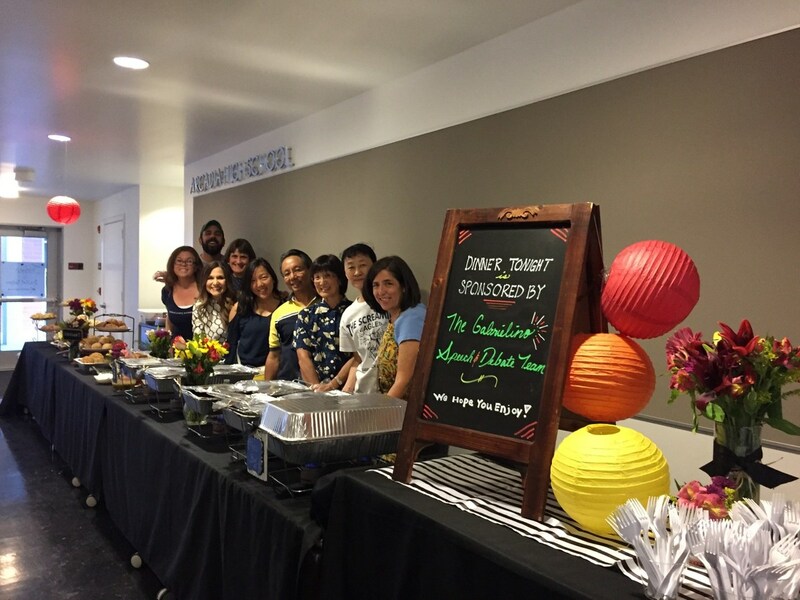 The Screamin’ Eagles students placed second at the tournament, but the parents were the clear dining champions!!!!!! We are exceptionally grateful to our Booster Organization and wish to extend heartfelt thanks to our parents for all their donations, time and efforts. We are so very proud to be able to say we’re a part of the same team as you. Thank you parents for your hard work and fantastic effort! Two Screamin’ Eagles recently combined to win over $400 from the 2017 Ramona Museum of California annual speech competition. 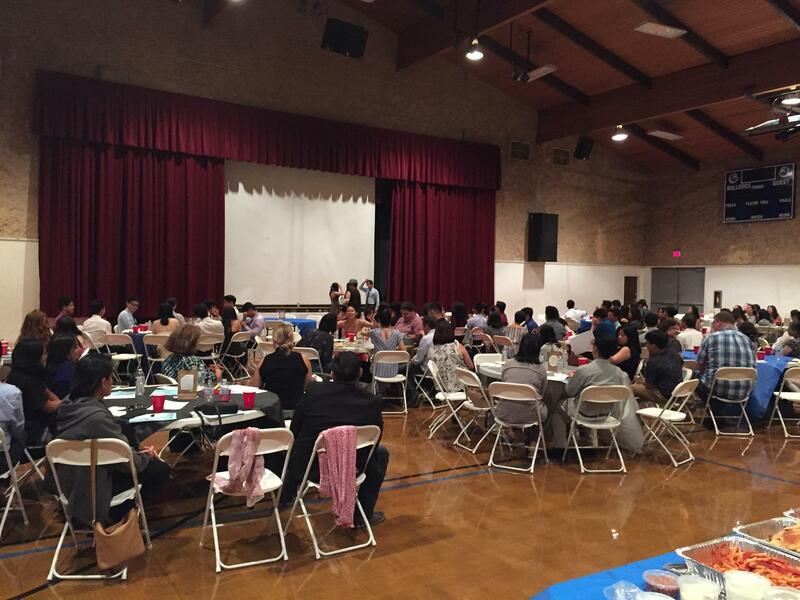 After having an amazing lasagna dinner, senior team captain Tim and junior Angelina presented their speeches to nearly 40 members of the San Gabriel Valley Community. Tim explained the history of the University of California system. Angelina talked about conspiracy theories that originated in California. After all the speeches concluded, the Ramona Museum of California awarded Tim and Angelina with $400 in prize money. Kobe Bryant is the Los Angeles Lakers’ all-time leading scorer. Cade McNown has thrown for more yards than any other UCLA Bruin and last summer, Kenley Jansen took the top spot in number of saves for the Dodgers. All-time leaders, all-time greats. To be on top for a year is one thing, but to have your entire body of work, your career reach heights never before achieved by someone from the same program is remarkable. In speech and debate, competitors don’t aim for hoops, throw balls or stand on a mound of dirt. They perform, speak and debate. Their points don’t come in the form of catches or jumpshots. The students accumulate points from the wins, losses and rankings they get in each round. Those who compete often and do well are rewarded with more points than their counterparts. In the entire 23 year history of the Screamin’ Eagles, no student has ever accumulated more than 2400 points. For the past four years, the top number was 2-3-5-8 held by legendary Debater/Extemper Anna Diep. This year, senior Alexandra jumped over the 2400 mark to claim the top spot on Gabrielino’s All-Time point list. Currently, “Lex” is ranked 1st in the East La/Orange Country District, 10th overall in California, 6th among all students in the Humorous Interp category in America and 79th among the thousands of students throughout the country. Lex has competed in almost every one of the 16 different events in Speech and Debate. She has done debate, speech, acting, judging, and showcase performances. If it is offered, chances are she has entered it. And she’s not done. Alexandra will compete in the State Championships later this month and will be making her 4th straight trip the National Championships this summer. It hasn’t been easy. Lex’s enthusiasm has not always been accepted by her peers and teachers. She often hears people say, “Speech Geek” or “why do you spend so much time in speech?” Lex just shrugs off the ignorance of others and lets it fuel her passion for the activity. The four year Screamin’ Eagle has successfully balanced her passion for performing and her school work. This year, she was named an Academic All-American by the National Speech & Debate Association. When Kenley Jansen broke the Dodger Saves Record, they gave him the ball. When Kobe became the Laker’s point leader, ESPN did a montage of Kobe’s Greatest Moments. When Lex broke the GHS Speech & Debate point record, no one said anything. In fact, she wasn’t even aware at the time she broke it. She went in to the next round and did what she loves doing, perform, speak and debate. Congratulations Lex, you’re our All-Time Point Leader!!!! For the second year in a row, Deandra waited for her final opportunity before she qualified for the National Championships. 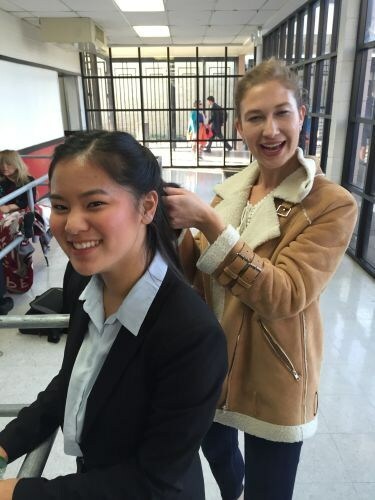 Even though she just missed qualifying in U.S. Extemp the weekend before, the four-year senior picked herself up, dusted herself off and gave it one more try. Deandra said, “I didn’t have any expectations going in but it was the first tournament where I actually believed in myself and my abilities wholeheartedly. Speech has its ups and downs, but if you continue to work hard, it usually works out in the end”. Her perseverance paid off and she qualified for the National Championships for the second, and last, time. It wasn’t easy. Deandra has been one spot away from qualifying for Nationals in her main event, U.S. Etemp for three years in a row. After repeatedly coming up short it is difficult to find the energy and drive necessary to make a run at qualifying. She had to defeat her teammates in prelims and in the semi-finals and then defeat one final student from another school in the final round. She will be joining 18 of her teammates in Alabama this summer. Great Job Deandra! When senior Calvin severely sprained his ankle playing for Gabrielino’s volleyball team earlier in the week, his first thought was, “how am I going to do my speech at Nat Quals this weekend?” He spent the next three days with his foot elevated every time he was in the speech room. This dedication and determination are testaments to the intensity and importance of this tournament. Calvin and 28 of his teammates were selected by the Screamin’ Eagles’ Coaching Staff to represent the team at the National Qualifying Tournament held again this year at San Marino High School. Each student had his or her own challenge to overcome; be it the expectation to qualify to Nationals again or the pressure to make it for the first time. The seniors, in particular, had to put the joy/sadness/excitement/suspense of college admissions on the backburner for a few days to focus solely on their performances. Only those who have actually participated in this activity truly understand the magnitude of the tournament. After months of practicing and attending competitions with no future implications, this one matters. This one opens the door to an opportunity to compete against the most talented performers in all of America. A select group is given an opportunity to spend a week submerged in an activity for which they have so much passion. For many students, this weekend was the last opportunity to perform their speech for the year. For the seniors, it could have been their last performance ever. The San Marino campus was much quieter and emptier than most meets. This weekend was limited to the very best from the top programs in East Los Angeles and Orange Counties. The stress and pressure was so high, even the first time observer can sense it. Most meets throughout the year have adjudicators who know less about the competition than the speakers. This weekend was different. Half of the judges at the tournament were, themselves, National Qualifiers, State and National Finalists and Champions. The other coaches know these veterans. They had great experience and success in the activity and are not easily impressed. Students competing in this tournament had to deal with the pressure of going against the best of the best from the other schools and performing in front of some of the most talented and awarded speakers this area has ever produced. Team Co-Captain Tim was there the entire weekend only to provide support. By making it to the Semi-Finals at Nationals last year in Salt Lake City, he automatically qualified for this year’s Championships. In spite of knowing he was already going to Birmingham, Tim felt extreme stress throughout the weekend. As any coach will tell you, the pressure builds when the results are entirely out of your control. Often times the fans on the sidelines go through a more violent emotional roller coaster than those who actually have a hand in the game itself. The first day of competition was on St. Patrick’s Day; however, there were no pretty rainbows and exchanges of gold foil wrapped chocolates. To some, it might have even been as unnerving as the classic horror movie, Leprechaun, starring Jennifer Aniston. Luckily, the first day only meant two rounds of competition. Saturday was the day where the memories are made. After a third prelim round, the tension was only heightened by disagreements between tournament officials that slowed the meet to a crawl. Nothing adds to the suspense and stress more than waiting…and waiting some more. The semi-final round was posted followed not so quickly after by the finals. Eventually, the day would end, several hours later than scheduled, with tears of joy or sorrow at the awards ceremony. Senior Sarah had never qualified for State or Nationals in her extensive career on the team. Down to her last chance to get to a post-season tournament, she made the most of the opportunity. She and her freshman partner, Sam, heard their names called, sending them to the speech equivalent of “The Big Dance”. On the opposite end, senior (and team photographer), Lex, became only the fifth Gabrielino student to qualify for Nationals four years in a row. She will be honored at the tournament with the other handful of competitors who made it to the Championships each year they were in high school. Co-Captain Maya, who will be making her second trip to Nationals, said, “I’m so excited. There is so much important history in Birmingham. It is the place where Dr. Martin Luther King Jr. wrote his famous Letter From a Birmingham Jail Cell. I’m so happy to get to go there and compete against the best in America”. The team won 5 of the 8 events and took 14 of the 24 available spots available for the National Championships this summer in Birmingham, Alabama. 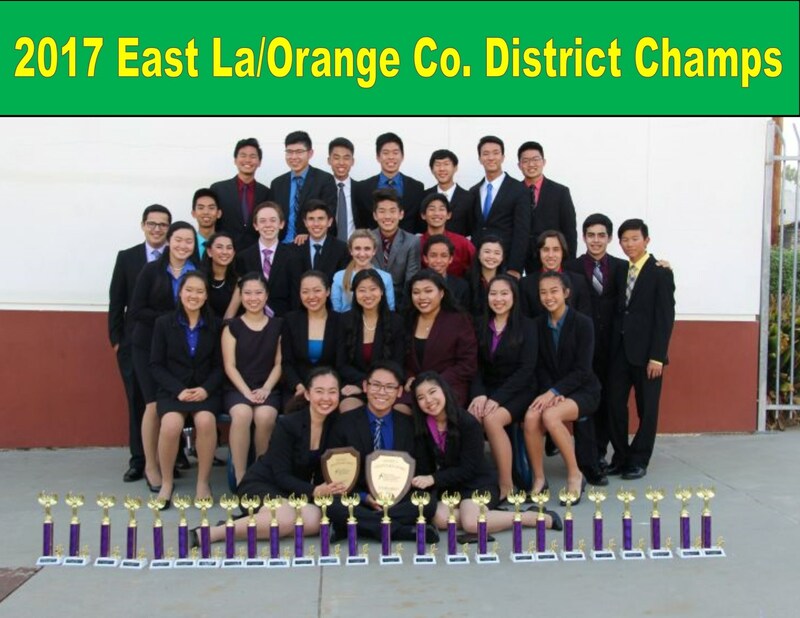 In total, 18 members of the Screaming Eagles will be representing the East LA County/Orange County District. The tournament team championship plaque was also awarded to GHS. Standing in front of everyone at the Award’s Ceremony, Calvin propped himself up on his crutches as he accepted his National Qualifier Plaque. His speech career will be extended into the summer as he gets to travel with 17 of his teammates to Birmingham to go to Nationals. Congratulations Screamin’ Eagles and Good Luck at Nationals!!!! 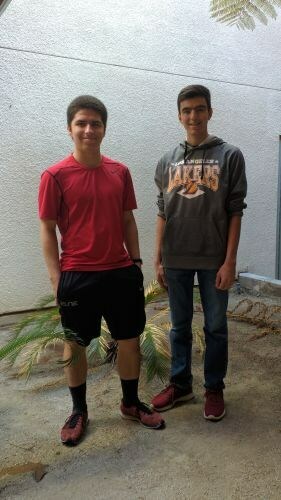 Juniors Michael and Ethan were interviewed on Tuesday by the program Take Two which airs on KPCC 89.3 in Pasadena. The two debaters offered opposing sides to the current constitutional amendment proposed in the California Legislature to allow 17 year olds to vote. 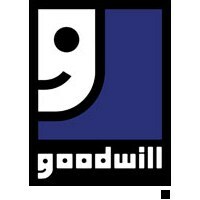 Thank you so much to all those who donated to help make the Goodwill Fill The Truck Fundraiser a success!!!! 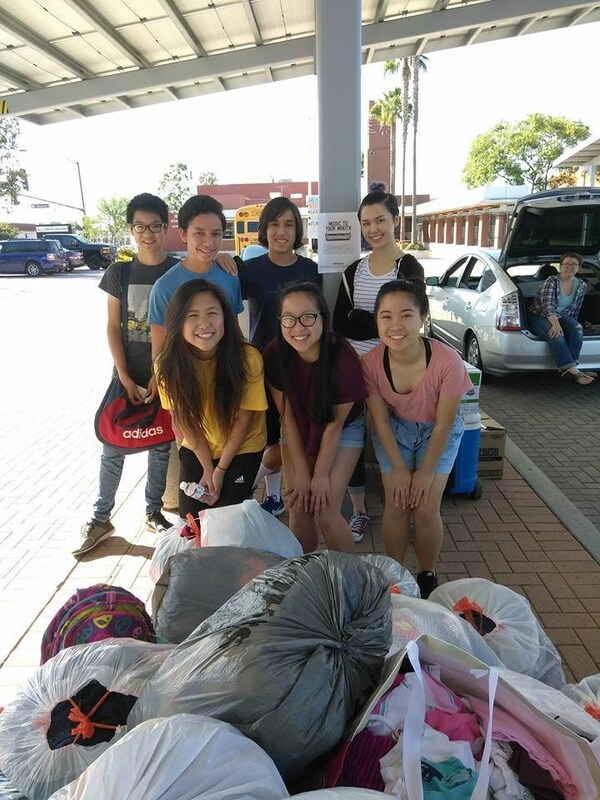 Save your items for the next opportunity to donate them this coming October. Thank you Speech and Debate Parent Boosters!!! In 1997, Great Britain turned over control of Hong Kong to the Chinese Government. The Dow Jones topped 7,000 for the first time ever. Titanic ruled the box office, the movie Contact was released and Seinfeld dominated television sets and office banter across the country. The Spice Girls were the queens of pop and their dolls were must haves for Christmas. 1997 was also the last year The Screamin’ Eagles were not the Southern California Debate League Champions. In 1998, Gabrielino’s League Championship team had 22 finalists, scored 62 sweepstakes points and had 11 State Qualifiers in route to their first ever league championship. Two decades have passed and as the sun set on the campus of Cal. 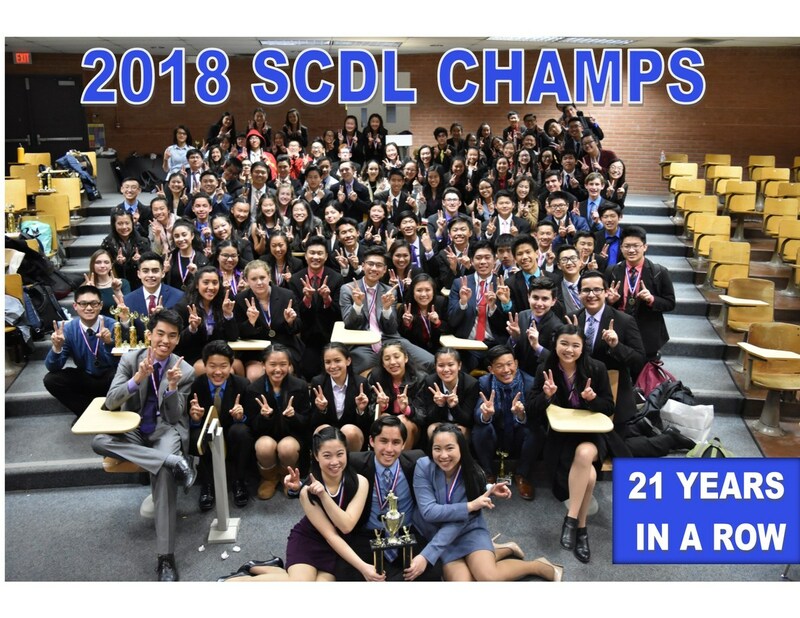 St. Long Beach, the members of Gabrielino’s Speech & Debate Team gathered in a way-too-small lecture hall to collect their 20th straight league championship trophy. The 2017 Screamin’ Eagles put 99 in semis and 51 in finals, accumulated over 300 points and ended up with 40 members of their team advancing to the California State Championships next month. Less than 24 hours before the team was to travel to the competition, coaches discovered the bus company scheduled to transport all the students was temporarily shut down due to safety concerns. In most circumstances, parents could step in and fix the problem. However, the vast size of the Screamin’ Eagles makes any trip a challenge for even the most seasoned travel agent. After some persuasive phone calls by twice retired bus secretary/czar Mrs. Solis and emergency purchase requests by Mrs. Ott and the SGUSD office, buses were secured and the streak looked like it would continue. A three week virus, however, had taken its toll on the students draining their energy and forcing some to spend time in the hospital. The one day schedule of the tournament meant some students would be giving 10 speeches-almost two hours of talking-in a span of eight hours. Yet, the speakers, dressed in their best power suits, willed themselves through the rounds. They persevered and extended their streak. Back in the late 1900s, Gabrielino High School was affectionately called, “Bungalino” because the former elementary and middle school buildings was dwarfed by the vast number of portable classrooms all over the campus. GHS was struggling for respect from the community and begging citizens in San Gabriel and officials in Sacramento for money so a school could be built to mirror the excellence the students and staff were creating. The Screamin’ Eagles quickly became the flagship of the school and would quickly grow to become the premiere program in the entire district. Principal and public relations genius, Dan Mooney, touted the success of the team to local newspapers and television stations. He even made sure the Los Angeles Country Board of Supervisors honored the team at a meeting. 20 years have passed since that first championship. 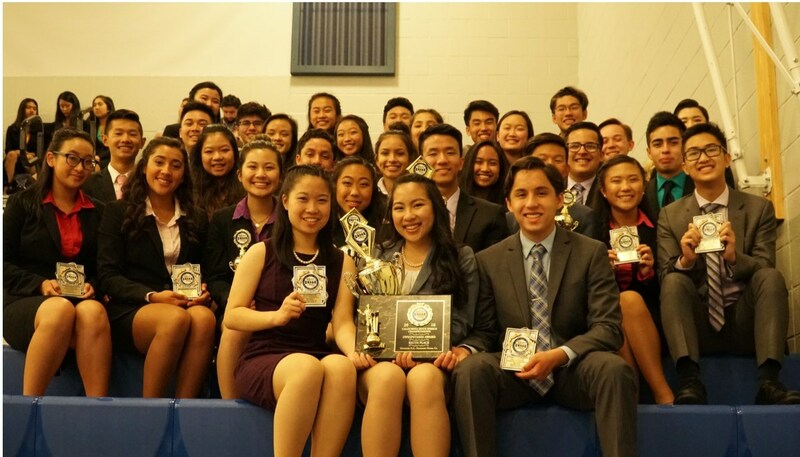 Every single Gabrielino principal has been able to claim their speech team was league champions. Every single student who has graduated from GHS was a part of a class that took home the first place team trophy from the campus just blocks away from Pacific Coast Highway. The Screamin’ Eagles were winning championships before any of its current members were born. The team is currently ranked as the 2nd largest team in all of America. The fanfare has faded. Winning has become as expected as traffic and palm trees. 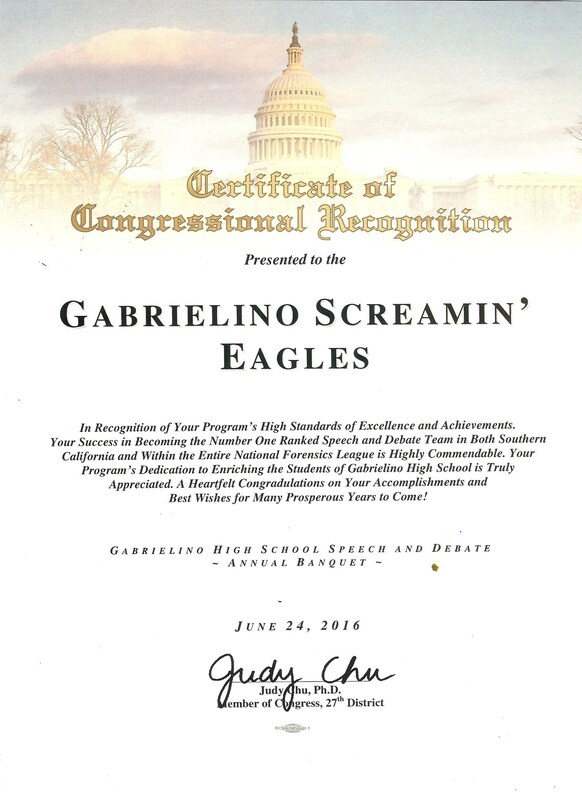 The Screamin’ Eagles Speakers have put Gabrielino on the map. All across the country, people who hear the name often mistake it for a private school, but there is no doubt they know GHS has a really good speech and debate team. The buildings have changed, staff members have come and gone and over 8000 students have received diplomas. Yet the team has continued to win and offer those willing to sacrifice their weekends some of the greatest opportunities high school students can have. Out Early? Why Would We Do That? Over the years, the Southern California Debate League’s Spring Novice Speech Tournament has become one of the fastest run tournaments of the year. Large numbers of rooms and judges allow for 6 rounds, tabbing and awards to happen in just under 7 hours. The meet’s speed is as amazing as the young adults performing at it. Leave it to adults to mess it all up. In a very close and contested vote, the league recently voted to add a final round to both Fall and Spring Novice Tournaments. In spite of the tournament organizers explaining three and a half hours (a 50% increase in time for a very small number of students to get a 14% increase in rounds) would be required to run the additional round, some coaches narrowly got the motion passed. Maybe they all needed a reminder of how wonderful a Saturday tournament can be when it allows time for all the participants to have an evening dinner with their families and loved ones. The 2017 running of Spring Novice at Garfield High School hopefully provided the necessary memory jolt. The tournament ran like clockwork thanks to hard working varsity students who judged and ran it. Overall, the team won half the trophies and used the meet as a final tune-up before their league championships/state qualifiers coming up in March. .Despite being the smallest class in team history, the sophomores held their own in the JV category. The novice team continued their trend of having new break out performers each tournament. Freshman Nolan who won both Oratorical and Advocacy commented, “It was a great tournament. I’m really grateful for it since it’s before State Quals”. This may be the last time Spring Novice ends while the sun is still up, and the Screamin’ Eagles made the most of their opportunity. 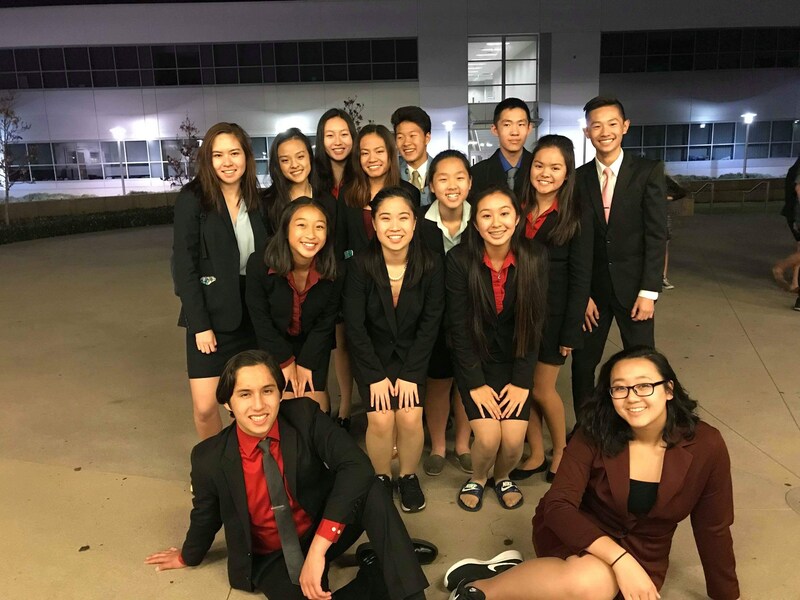 In a fitting celebration for Chinese New Year, The Screamin’ Eagles Class of 2017 let off metaphorical fireworks through their performances in the rounds at the Southern California Debate League’s Spring Varsity Speech Tournament. After the legendary Class of 2016 graduated, the team felt it was in great hands with the upcoming seniors. That belief was often called into question during the first few months of this season. A powerful novice crop of students seemed to be carrying the team through their performance, preparation and passion. On Saturday, the seniors let their collective voices be heard. Gabrielino won eight of the twelve events. Each and every one of those champions will be graduating this year. For some, it was their last time to perform since they will not be on the team competing at the League Championships in March. They all made the most out of their opportunity. The Screamin’ Eagles put 87 students in the Semi-Final round and had 45 in Finals. The team totaled 277 points while the other 18 teams combined garnered 233. The tournament also served as a partial qualifier for the State Tournament. 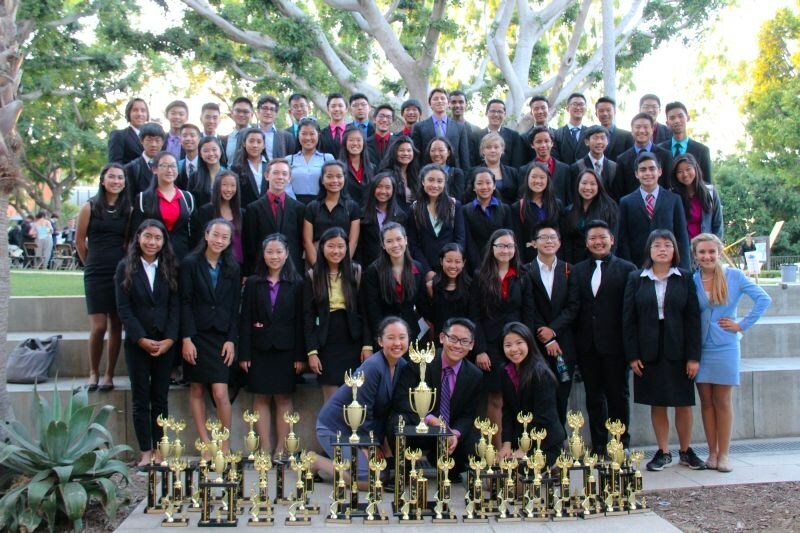 Any student who placed first or second at the league’s Fall Varsity Tournament last month would make it to the California Speech and Debate Championships with a similar showing at this tournament. Five of the team’s members placed high enough to earn their way to State. It was only fitting that four of those were seniors. The lone student not in the special class winning an early bid was freshman phenom Felicia who qualified in Expository Speaking. 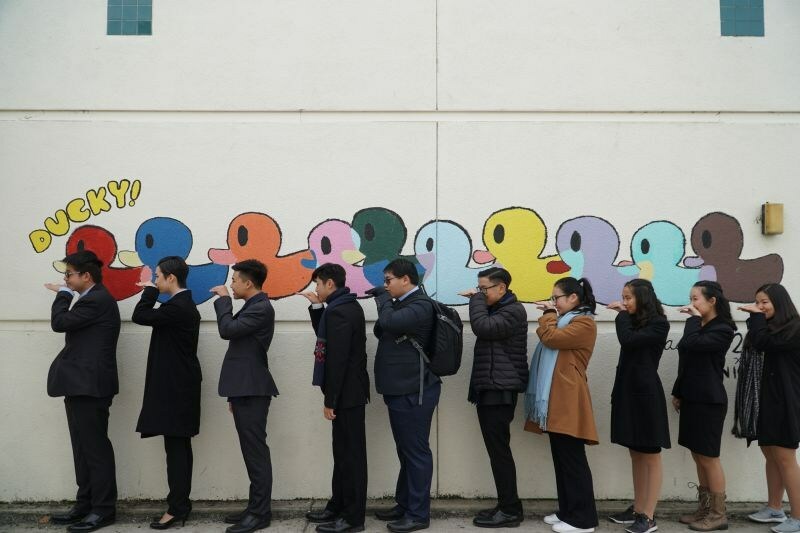 On the day when people around the world celebrated a new year of the Chinese Lunar Calendar, the Screamin’ Eagles’ Senior Class took that next step. They stepped up on the stage and represented their classmates, their team and their school in grand fashion. In the early morning hours, just before sunrise as the team was waiting to board the bus for the trip up to Oakland, there was one question on the minds of several coaches and parents of the Screamin’ Eagles: how would the weather be on the 5 Freeway be over The Grapevine? While the Los Angeles basin rarely dips below 40 degrees, the mountain ranges separating LA from Northern California often get snow and interstates through the higher elevations are completely shut down from time to time. According to early reports that morning from CalTrans, the roadway was safe and open. In less than two hours, the answer would be discovered first hand. It only lasted a few minutes, a couple of miles. Those sleeping or watching Captain America: Civil War missed it, but a handful people on the bus saw the snow falling on the interstate and the front windshield as they traveled over the top of the mountain. The team’s courageous driver, Portia, skipped the traditional rest area stop because of the rain and cold temperatures. However, before Remember the Titans had begun, the sun came through the clouds and stayed out for the rest of the trip. At the team meeting on Friday, the students were asked who was making their first trip to Logan. Over half the hands in the packed room went up. It was clear that while the bus had been filled with people and luggage, it had not brought a lot of experience. What was present was a new found energy, a will and determination. The team members worked hard and behaved exceptionally well throughout the weekend. 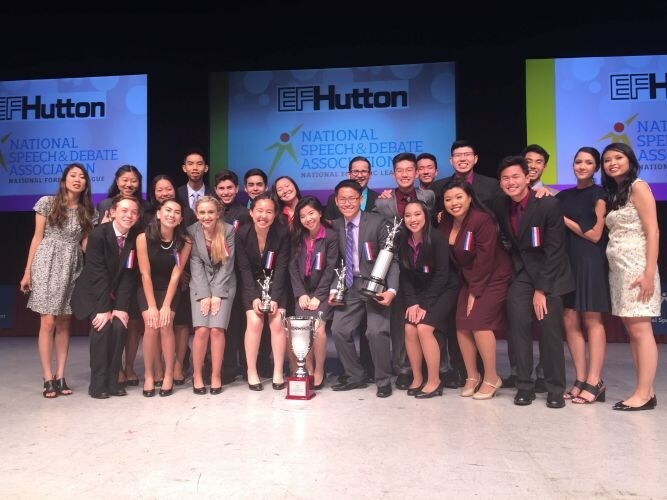 Included in the 84 teams from all over the country competing at 2017 The James Logan High School National Speech and Debate Invitational were no less than eight programs who had won National School of Excellence Awards. The tournament offered an excellent opportunity for the Screamin’ Eagles to perform for and compete against some of the best students in America. The 2011 team is the only one from Gabrielino to have won the prestigious tournament outright. This year, the awards ceremony on Sunday evening would not produce a second championship for the Eagles. The team placed fourth overall (3rd in the speech category) losing to two perennial private school powerhouses and Logan. Of the 45 students on the trip, 30 of them broke to out rounds totaling 47 entries in the Quarter-Finals, 17 in Semis, and 7 Finalists. Team Captain and Senior Tim won Advocacy and placed second in International Extemp. Freshman Felicia represented the newbies by placing second in Drama. 2017 has already delivered several rainy days and there will probably be more to come, but for one weekend, the sun shone brightly on the Screamin’ Eagles. This year, Los Angeles Lakers’ Coach Luke Walton has a young roster and many are chanting, "let the kids play". 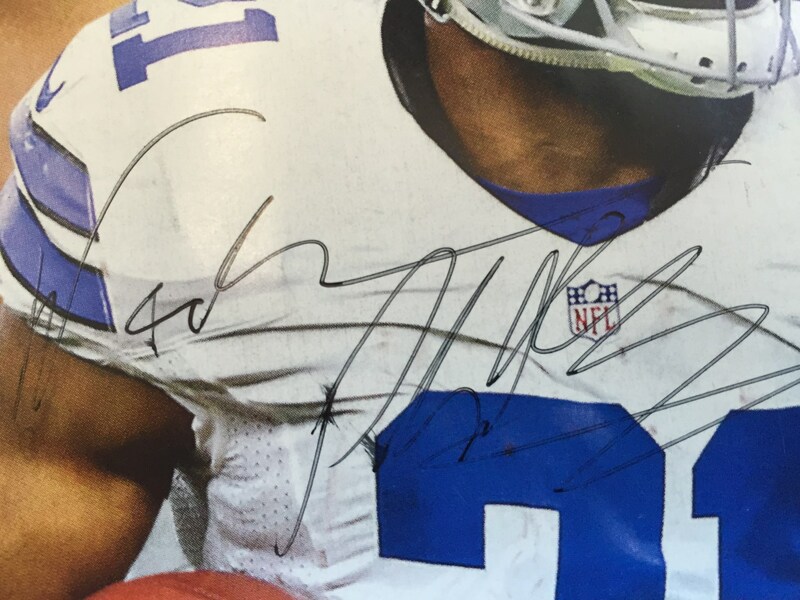 In professional football, the current top two vote getters for the Pro Bowl, football's All-Star Game, are a pair of rookies from the Dallas Cowboys. The Screamin' Eagles are falling in line with these two iconic teams. They're letting their novice students play, and so far, they have performed at an all-star level. 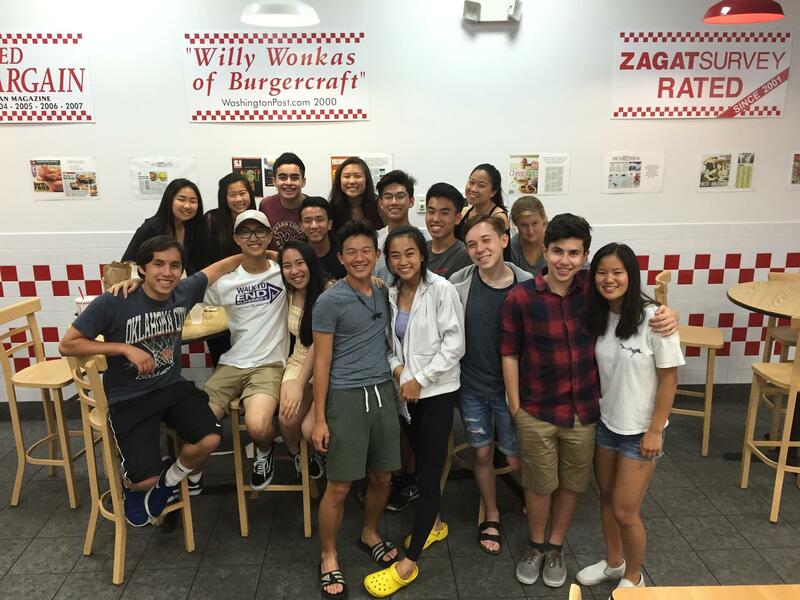 The Southern California Debate League's Fall Varsity Tournament provided an arena for the young-ins to compete against the seasoned varsity students from around the area. After four rounds of intense competition, the first-year students earned enough points to place 5th at the meet all by themselves. Combine their points with those from the rest of the team and Gabrielino won the annual event for the 17th straight year. 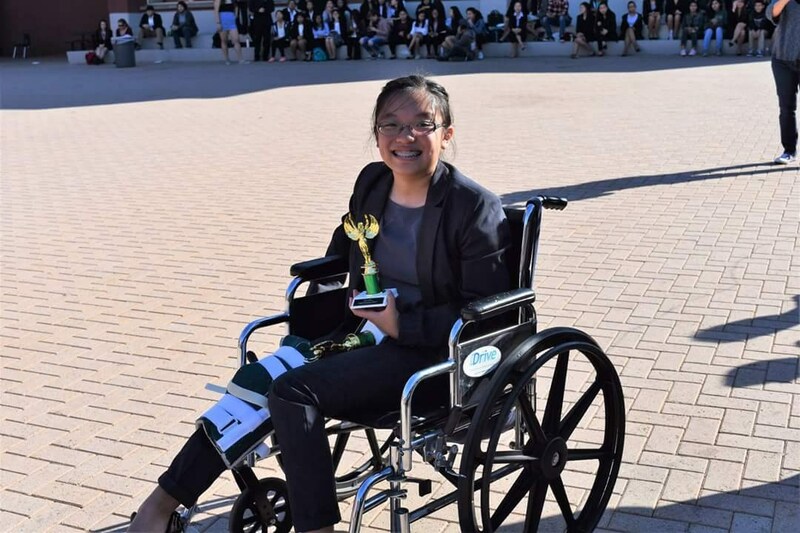 The inspiration of the day, if not the year, came from one of the novices who, because of an injury, performed all her speeches in a full leg brace. Katherine moved between her rounds in a wheelchair with her leg outstretched and in a full brace. When it came time to speak, she got up from the chair, delivered her messages and popped between her characters while steadying herself on her good leg. Most people would have seen the injury as an excuse to get out of the competition, but the freshman refused to let an injury take away her chance to compete. No television cameras caught her determination. Morning talk shows won't talk about her tenacity. There won't be any films made about her incredible courage. But the kids saw it. 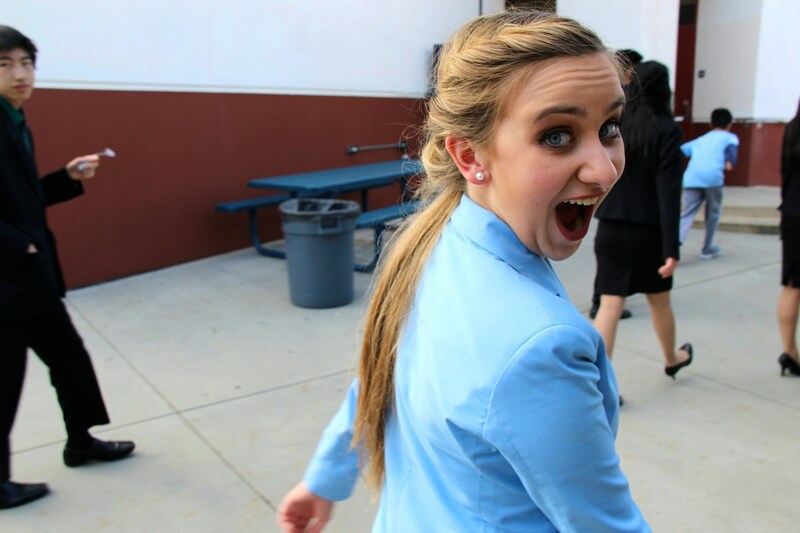 The team members are able to say, "I was there when..." Her story will live on in the lore of the Screamin' Eagles and be told over and over again in the speech and debate classroom at Gabrielino. Katherine's day ended with a 3rd place finish in her event. She topped all the other students, including most of the more experienced varsity members from her own team. One of the assistant coaches remarked, "we should name an award for her, call it the Katherine award and hand it out at the banquet". Katherine and her fellow novice speakers reflected the passion and energy from the entire team. GHS had almost 50 finalists, won eight of the twelve main events and accumulated over 200 points. 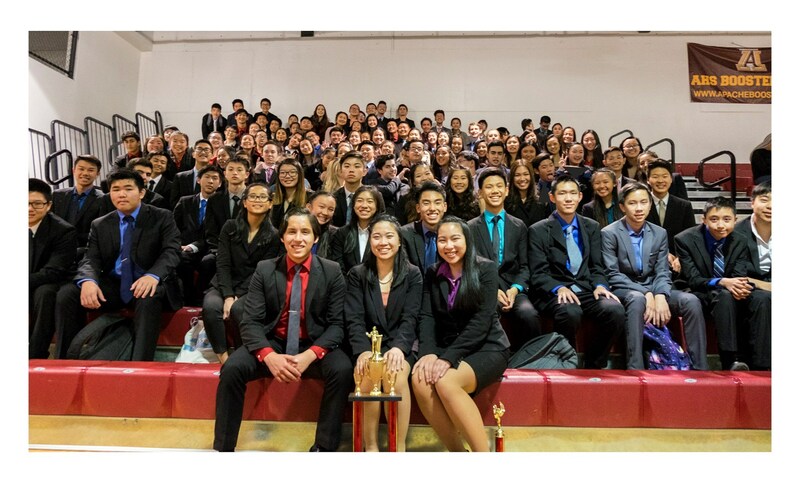 Students who placed 1st or 2nd in their events also completed the first step to automatically qualifying for the California Championships without having to compete at the qualifying tournament. The league refers to it as, "getting a leg". Two legs and you're going to State. Freshman Felicia won the event of Expository Speaking and upon learning of the added honor asked, "what's a leg?" Indeed, they are kids, they are playing, they are learning and they are succeeding. The future seems to be in good hands for the Screamin' Eagles. Congratulations!!! The Screamin' Eagles have entered year two of the additional course requirements for students and their numbers have rebounded a little. The novice team is larger than last year but about half the average number over the past two decades. 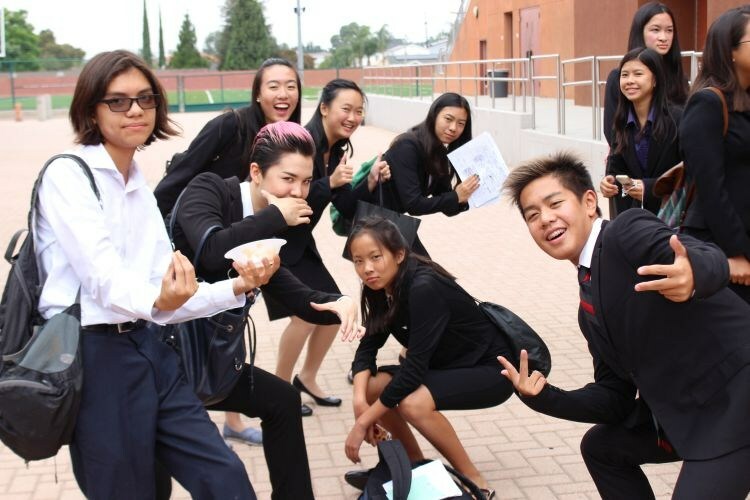 Regardless of numbers, the team remained on track at the Southern California Debate League's Fall Novice Tournament hosted for the 20th time by Gabrielino. This year marks the first time students can compete in almost any two events, regardless of pattern. That meant some competitors were running between rounds for part of the day and observing for the other half. The change opens up new events for students but overall is not the best use of time. One coach explained, "when the league voted last May to allow schools to save time and money by offering all events at the same time for the State Qualifying Tournament, some coaches wanted to remove the 'one event per pattern' rule and they got it passed." 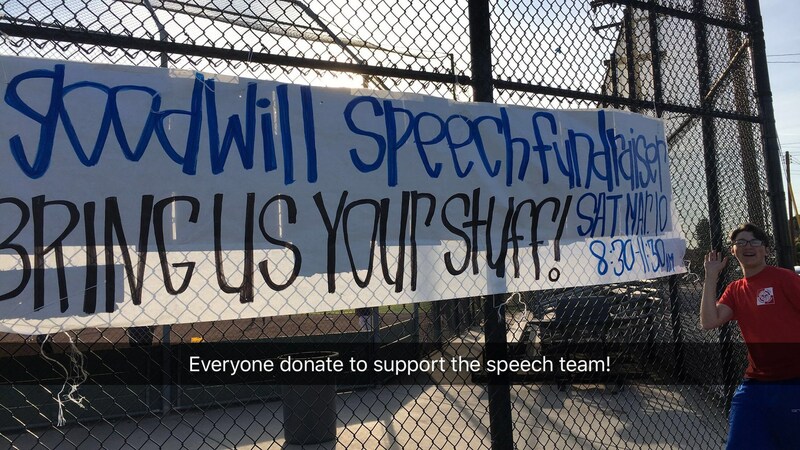 Gabrielino's staff quickly remarked the Screamin' Eagles and a few other schools would benefit greatly from this move since the teams regularly compete at invitationals without particular event limitations and thus, GHS representatives proposed extending the allowance to all league speech tournaments. A Screamin' Eagle insider commented, "we don't think either proposal is the best use of time, but you can't have one without the other. The season will give us a lot to look at and consider moving forward". The rules might have been a little different, the team is smaller, but the results were the same. Gabrielino won almost 20 trophies. One captain said, "I'm really proud of our novices. They had a great tournament." The future looks bright for the team. Way to go Screamin' Eagles! 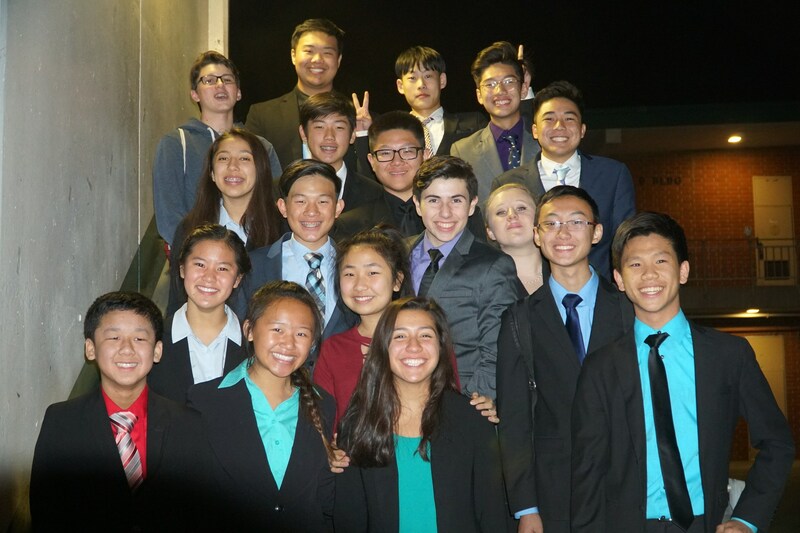 The Screamin' Eagle Debaters competed at the Damien Debates and did really well. Leon and Lex made it to the Quarters of Lincoln Douglas Debate. Michael and Ethan qualified for the Semi-Finals of Policy Debate. Elysia and Andrew were in the Semi-Finals of Public Forum Debate. Several years ago, The Rio Hondo Community College Speech Team created a tournament open to the students enrolled in speech classes on their campus. Over the years, the tournament opened up competition to a few schools in the immediate vicinity of the college. Each year, more schools were invited and the tournament grew. In time, the event out grew the Rio College campus and the entire tournament had to relocate to nearby California High School. Again this year Gabrielino was invited to the tournament and the students did not disappoint. The team won over 70 awards and was the top school overall. As Team Captain Tim said, "it was tiring and rewarding". 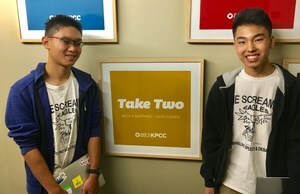 Tuesday morning, KPCC Radio's program, Take Two had two GHS students on to critique the Presidential Debate. 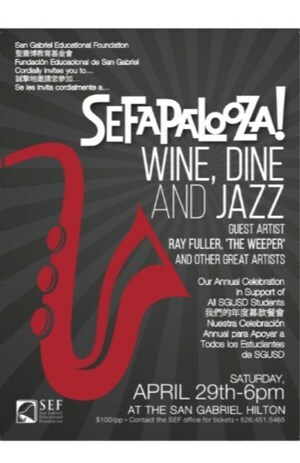 SGUSD Superintendent John Pappalardo commented, "the students were wonderful". Thank you for the opportunity KCPP!!!! In the team area that housed the GHS Speech & Debate Team all weekend as they competed at the CSU Long Beach Invitational sat a single cactus in a field of other plants. It sat in a pot, unable to spread its roots to fully grow. It didn't fit in. It wasn't supposed to be there. In a tournament filled with students from private schools, wealthy public institutions and expensive after school academies, The Screamin Eagles, like the cactus, didn't quite fit. They weren't supposed to be there. But they were there. Students who speak English as a second language or are still learning the language aren't supposed to have success against those whose great-grandparents called America home. But they did. The tournament was certainly not without its challenges. The campus is quite large. Several students competing at the tournament had an entourage of parents and private coaches going from round to round to help prepare or carry visual aids and easels. The Gabrielino kids lugged their expos cases up and down stairs and across a vast campus- that just might occupy multiple time zones- all by themselves. The students also battled temperatures hovering around 100 degrees for two days. The sign read Long Beach, but the weather seemed more like Long Desert. However, like the cactus, the students persevered. If 14 hours of competition on Saturday wasn't enough, over 50 students went back on Sunday to compete in Semi-Finals. The team had 31 entries in the final round. At one point during the weekend, some parents brought lawn chairs to the team area as if a little league game was about to break out. They didn't see any home runs, they didn't cheer for any touchdowns. They were lucky enough to watch a very large group of teenagers spend their weekend becoming better speakers, learning to communicate, and preparing to perform. At the end of the weekend in the field of 93 schools, the lone cactus, the one team different than most, ended up as the Champions of the 2016 Jack Howe Memorial. 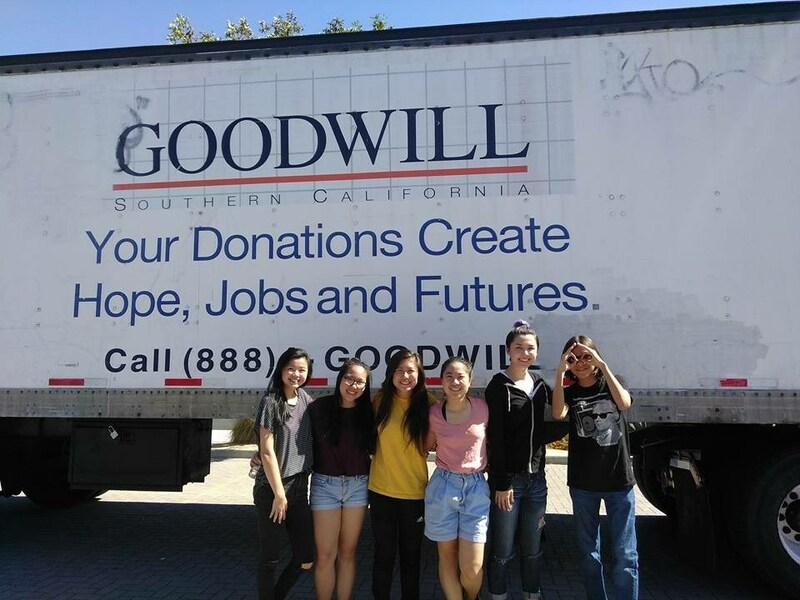 After a year without it, the Screamin' Eagles welcomed back the Goodwill Fill The Truck Fundraiser. Save your items for the next opportunity to donate your used items on March 11th. Twenty years ago, the Icebreaker began with just a, “let’s see what happens”. The Screamin’ Eagles Coaching Staff put together an event where experienced speakers could guide new students step by step through a tournament without having the challenge of finding even more judges. 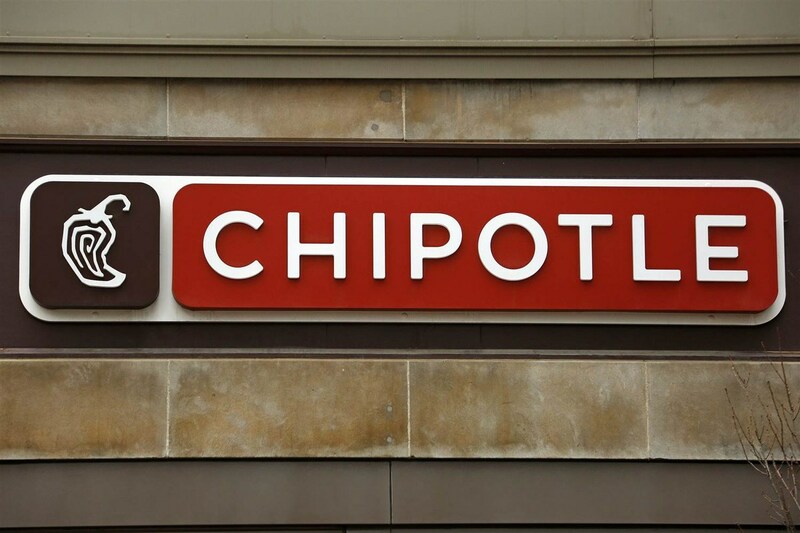 After two decades, the simple idea has persevered. The theme has changed over the years from autumn harvest to real pumpkins to plastic pumpkins and now to pirates in honor of National Talk Like A Pirate Day (September 19th). The 20th edition of the tournament was not without challenges. Gabrielino’s internet – crucial to record all 5000+ scores – was completely down for the first portion of the day. There were no custodians available to work to unlock or lock all the classrooms. Yet, in typical Screamin’ Eagles fashion, they made the best out of it with much less than ideal conditions. In fact, because of the extra efforts of the GHS parents, students, alumni and coaching staff, the tournament actually finished early.